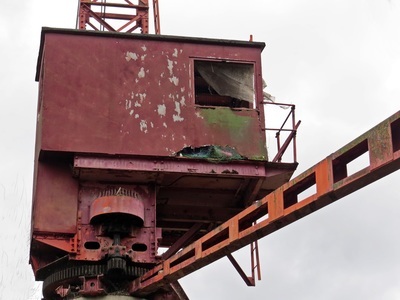 A "Scotch derrick" was a crane that was frequently used in docks for lifting and moving heavy loads. 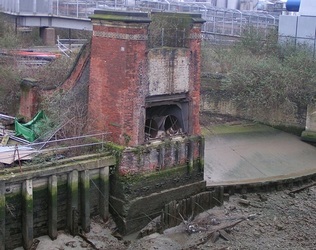 In this case the heavy load was wood - shifting tree trunks from ships on the Thames into Lawrence Wharf thought to be the last remaining sawmill in London until it closed in 1986.The derrick derives its name from a type of gallows named after Thomas Derrick, an Elizabethan era English executioner. 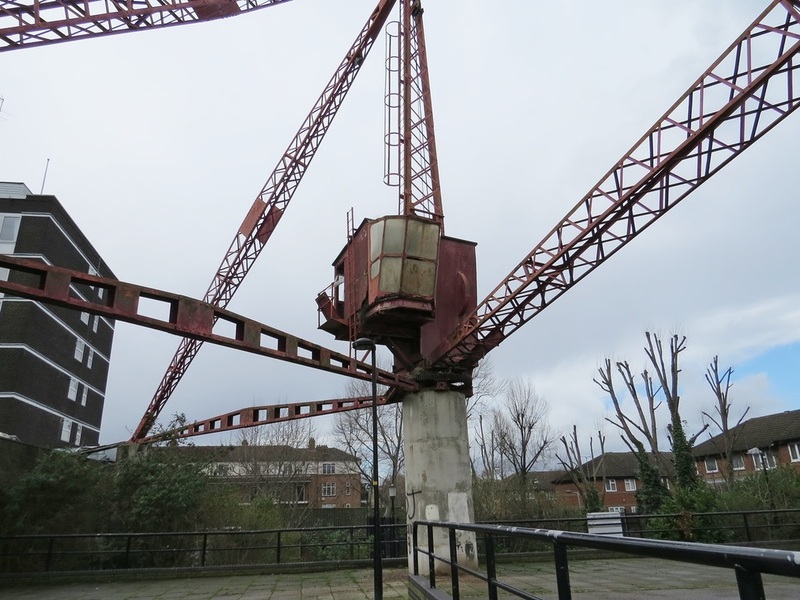 ​The London Docklands Development Corporation recognised its importance as the last remaining independently mounted crane in Rotherhithe and placed a protected covenant on it but this safeguarding was subsequently removed by the Mayor of London.Greater London Archaeology Society say that this red crane was built just after World War Two replacing an earlier crane destroyed in the Blitz. This crane is the last of its kind in London and is one of the few remaining physical and tangible links to former Surrey Docks community heritage and identity and despite opposition from local residents, the owners of the land Hollybrook Homes don't wish to retain the crane due to its poor state of repair and of course the amount of space that it occupies. 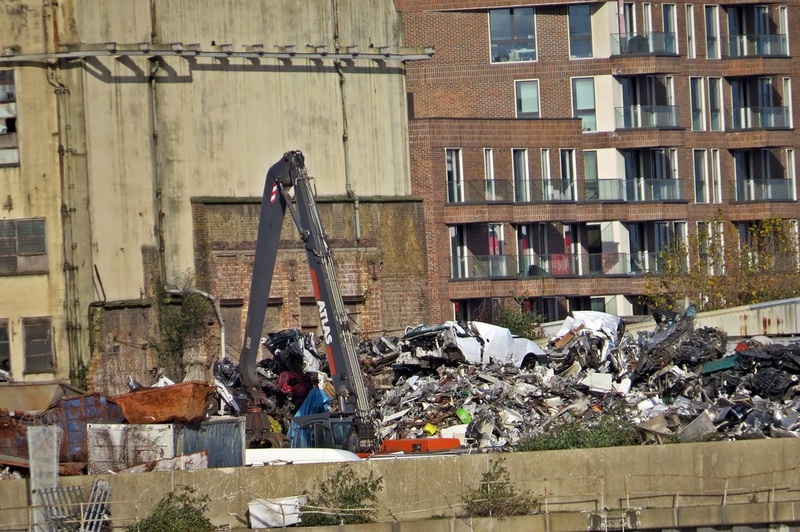 They plan to take the crane down and recycle parts to make a riverside sculpture whilst building housing around this valuable Thames-side site. 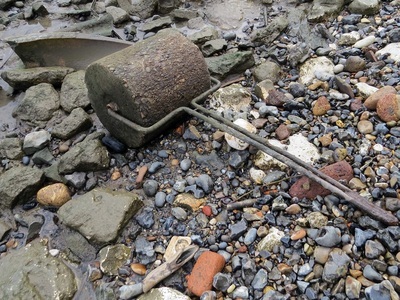 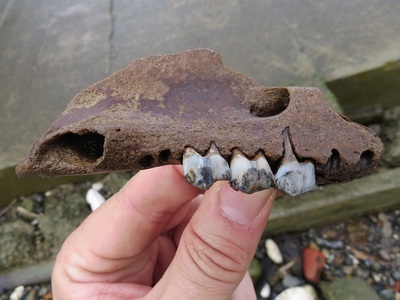 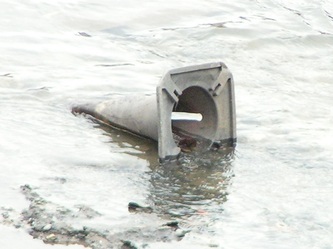 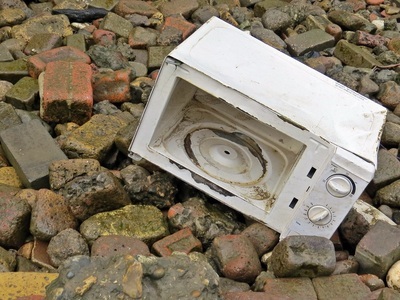 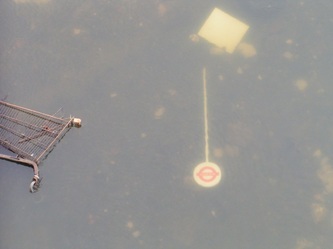 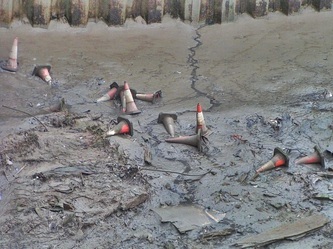 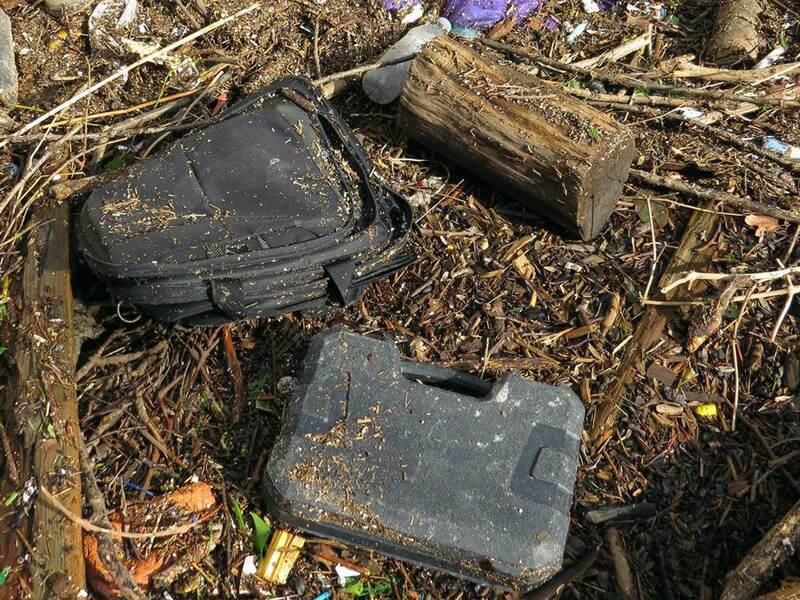 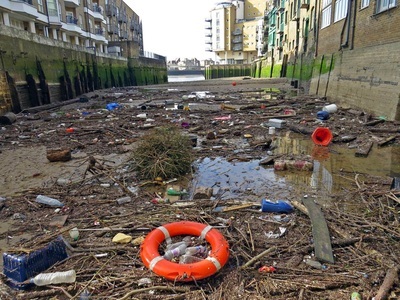 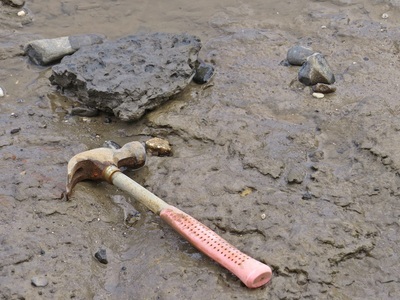 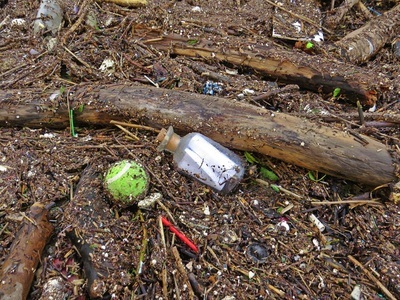 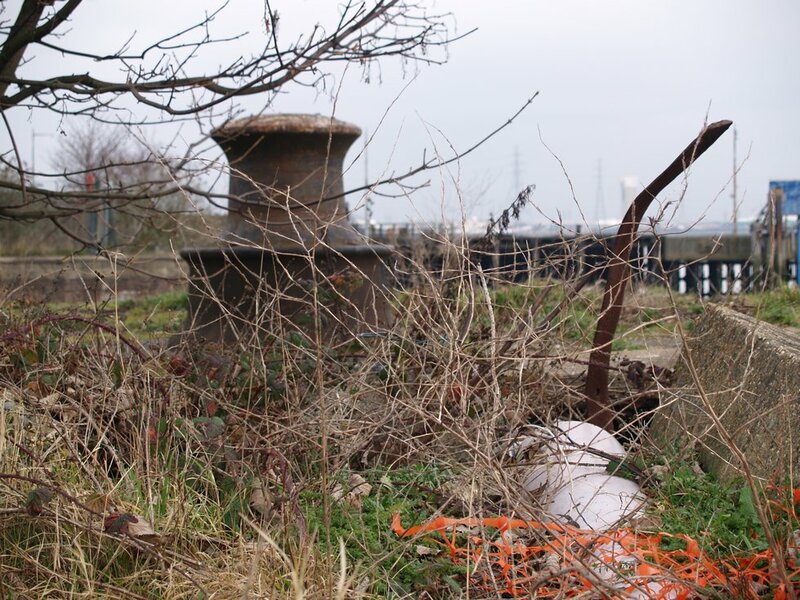 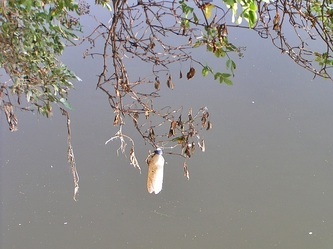 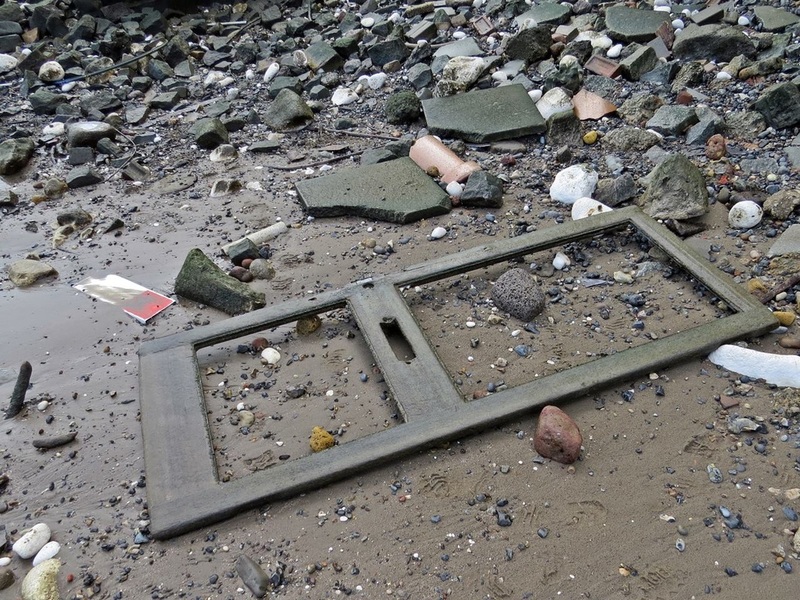 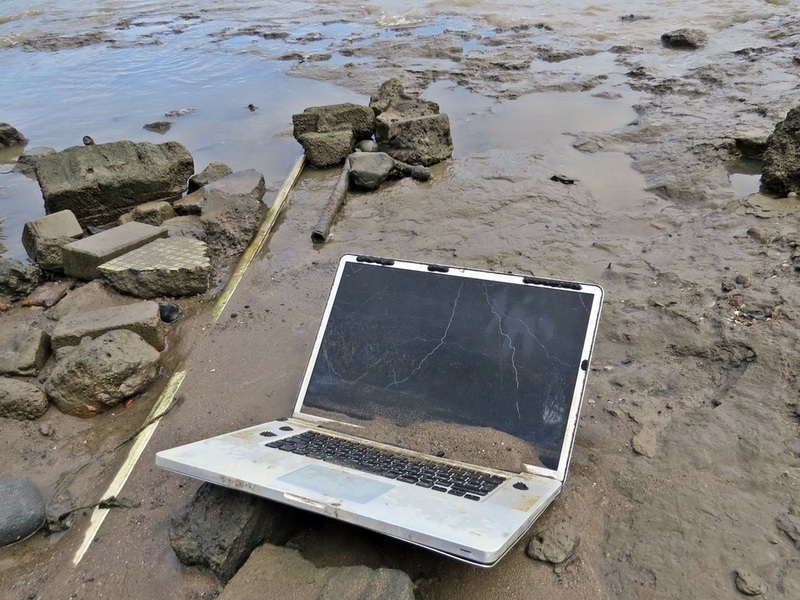 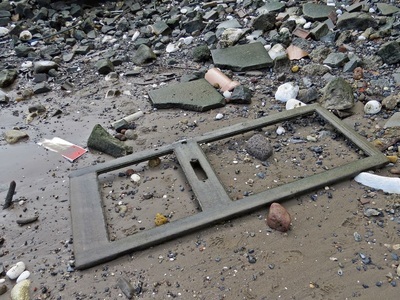 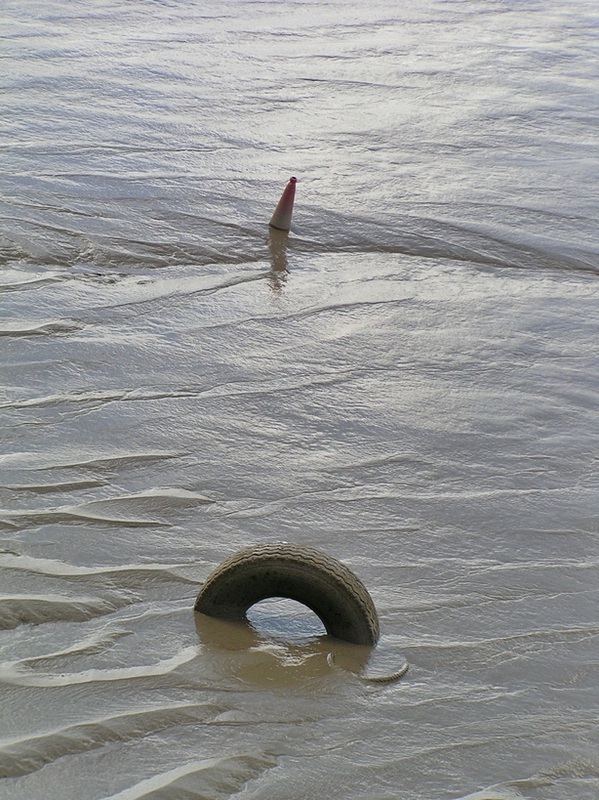 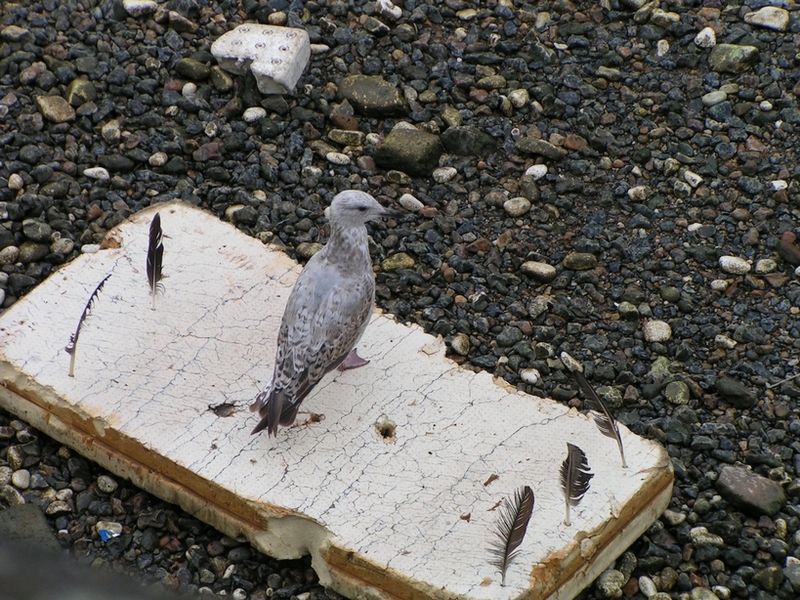 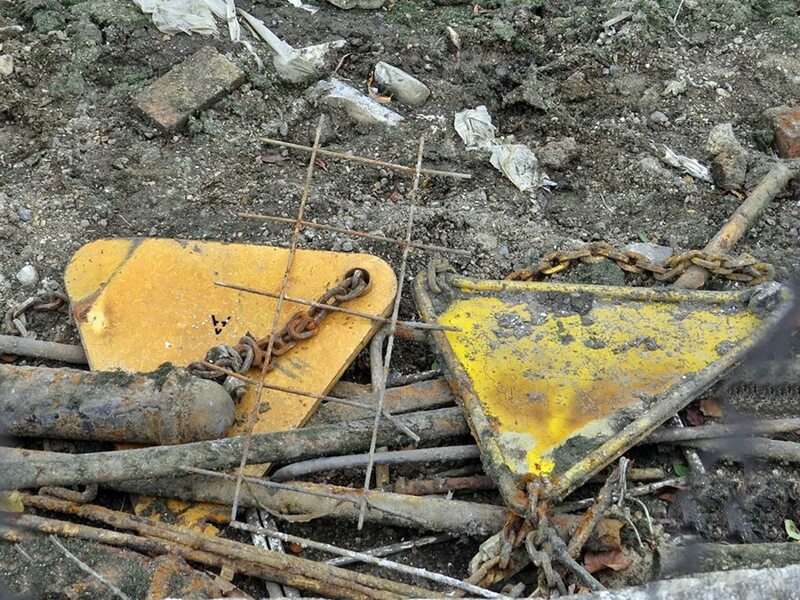 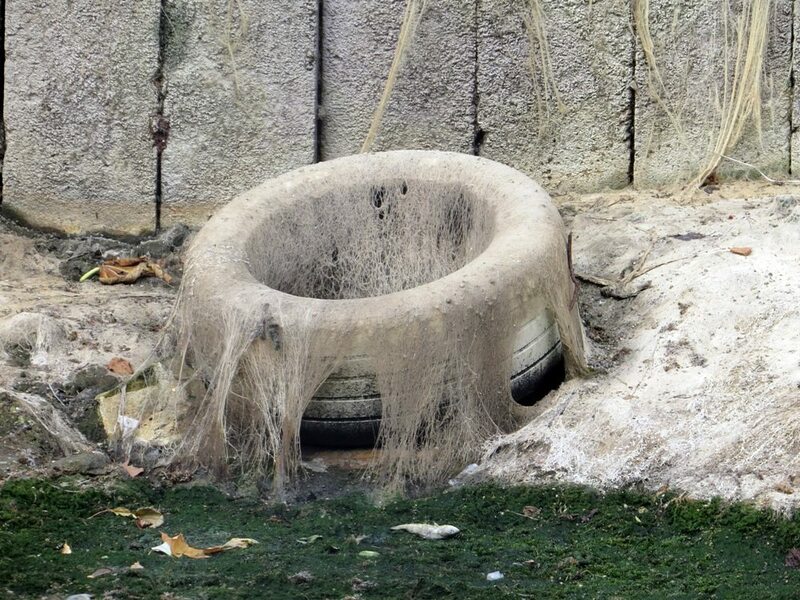 A few everyday items found along the Thames foreshore on the Deptford/Rotherhithe border by the sewer outfall of the Earl's Sluice. These include a laptop, microwave, VHS cassette, a front door, a hammer, a roller and a piece of a jaw with a few teeth intact. 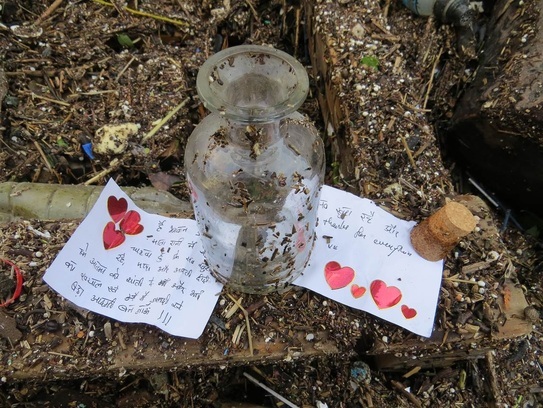 When walking amongst the low tide debris of discarded footballs,stolen laptop cases & a dead fox I find this mysterious message in a bottle. 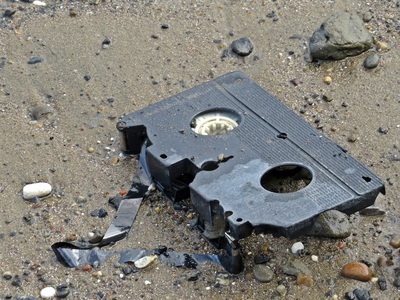 I carefully open it, take these pictures then securely reseal it before sending it back on its journey. Now for the contents of the message It's in devanagari script and is a letter adressed to god. 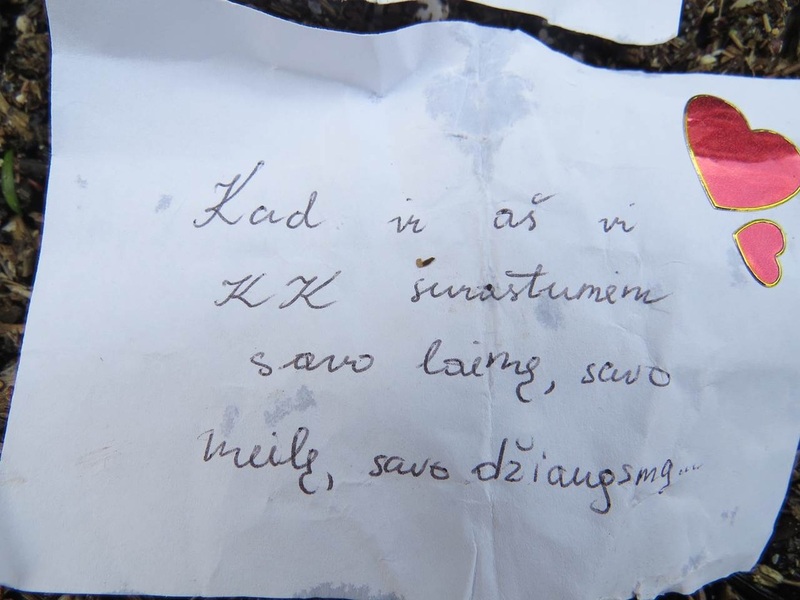 The guy wishes for everyone's happiness. 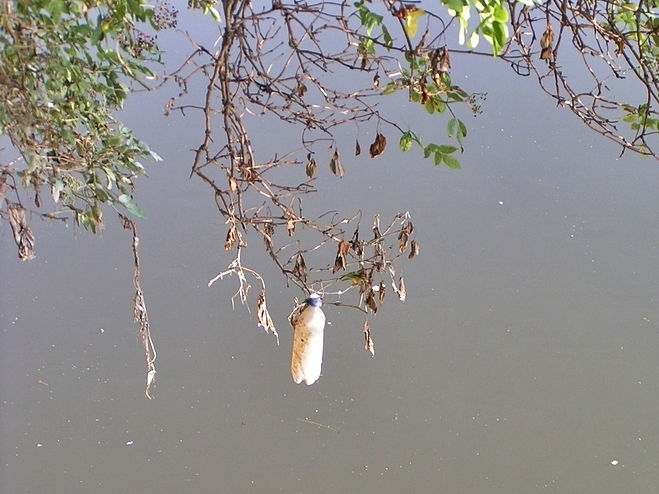 He then prays for his father's and sister's soul to rest in peace. 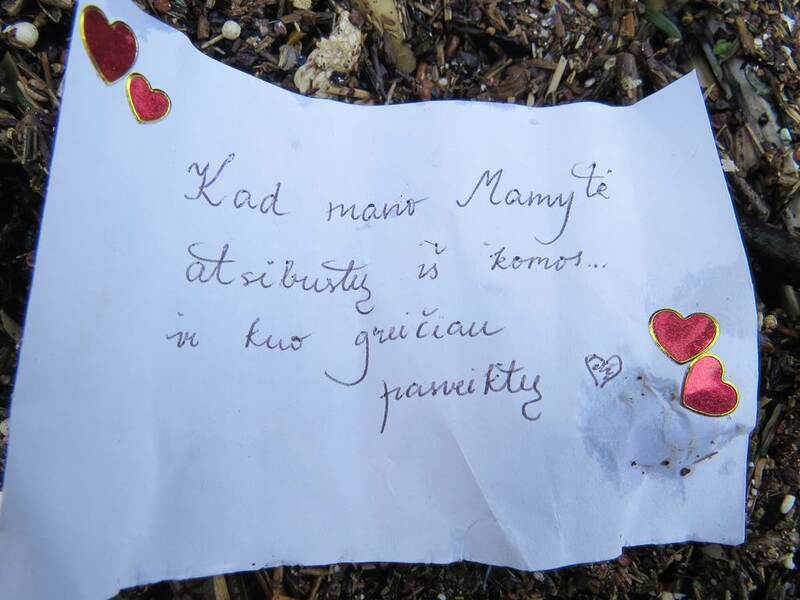 He then prays for his mother's and brother's wellbeing. 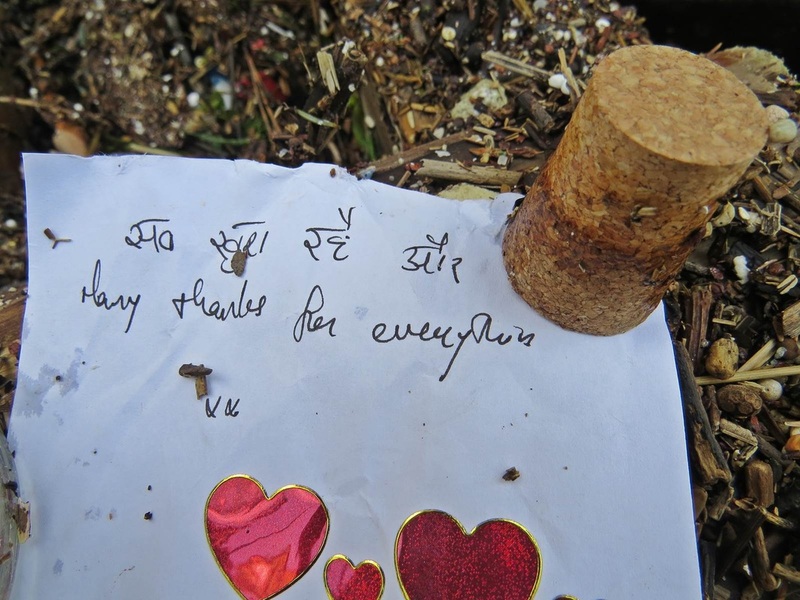 Finally, he hopes he will be a rich and successful man soon.Thanks to Yasser on Twitter for translating this for us. 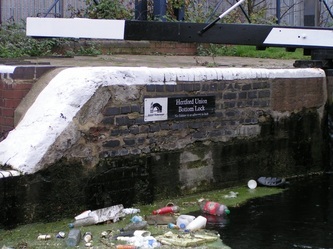 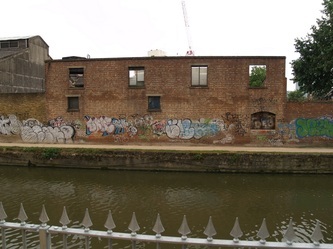 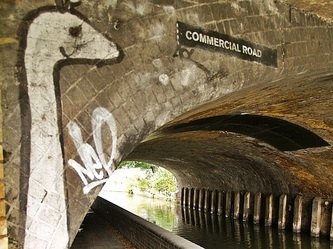 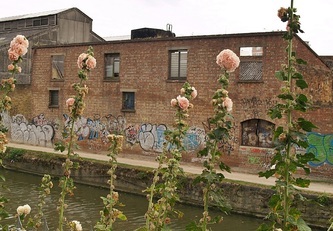 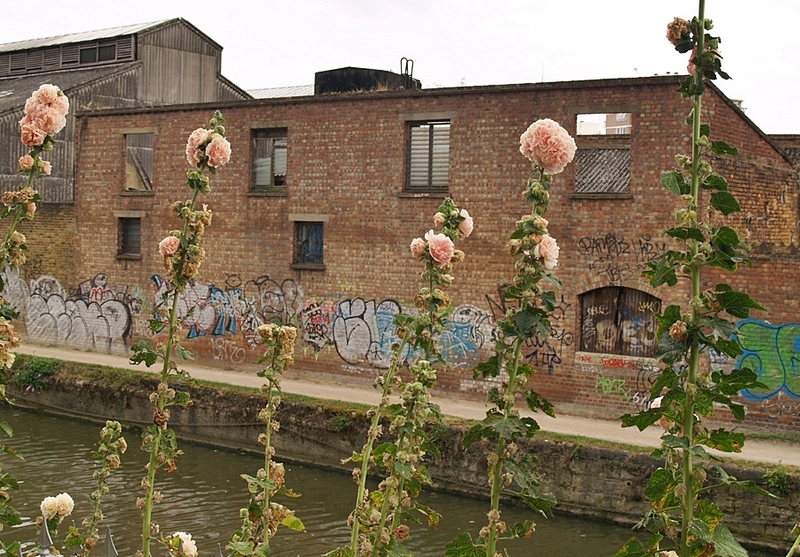 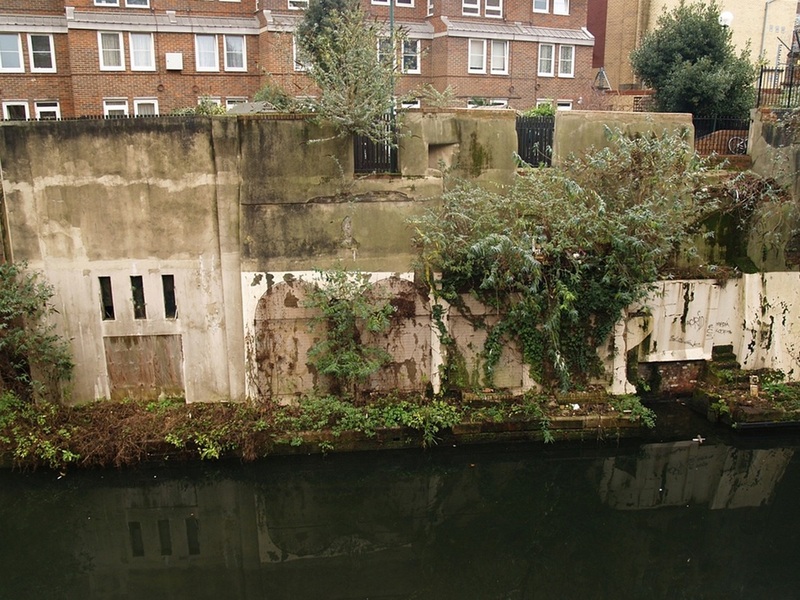 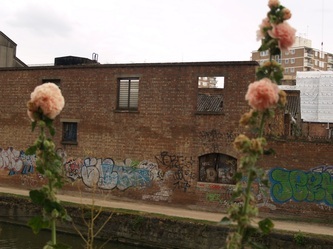 The Regent's Canal is an 8.6 mile long canal providing a link from the Paddington Arm of the Grand Union Canal, just NW of Paddington Basin in the west, to the Limehouse Basin and the River Thames in the east. 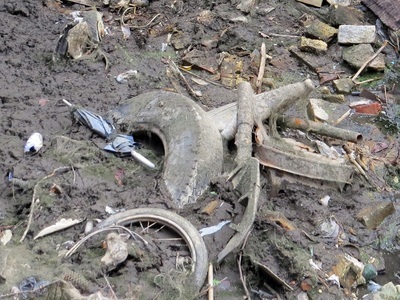 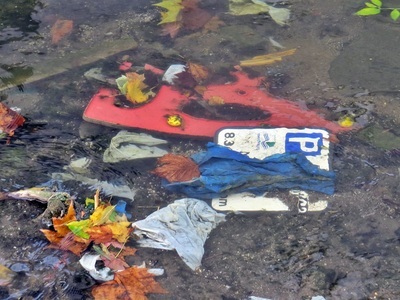 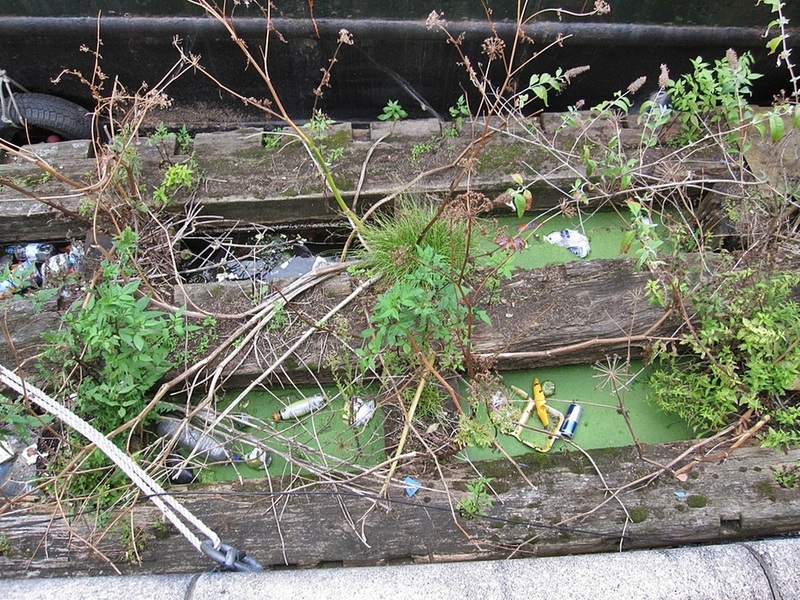 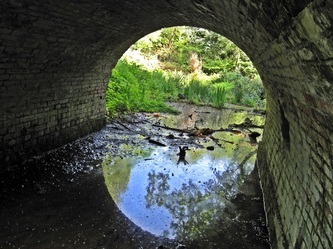 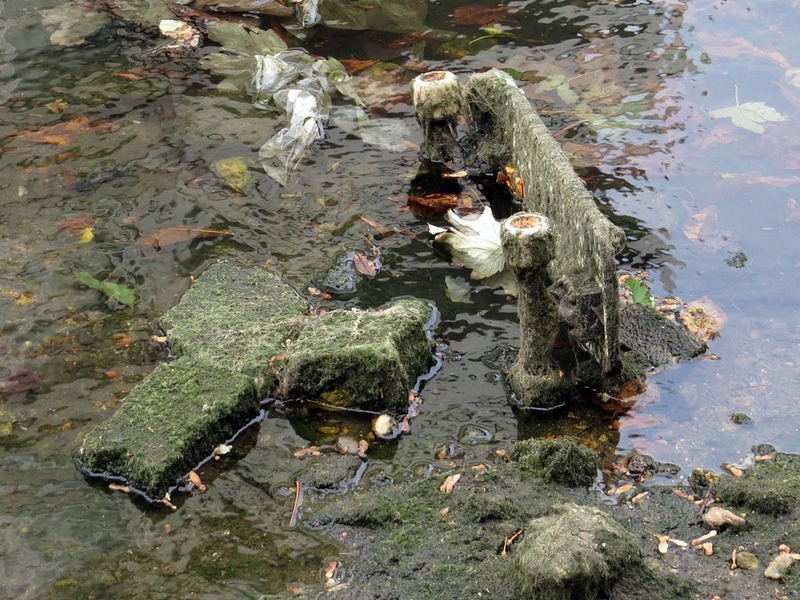 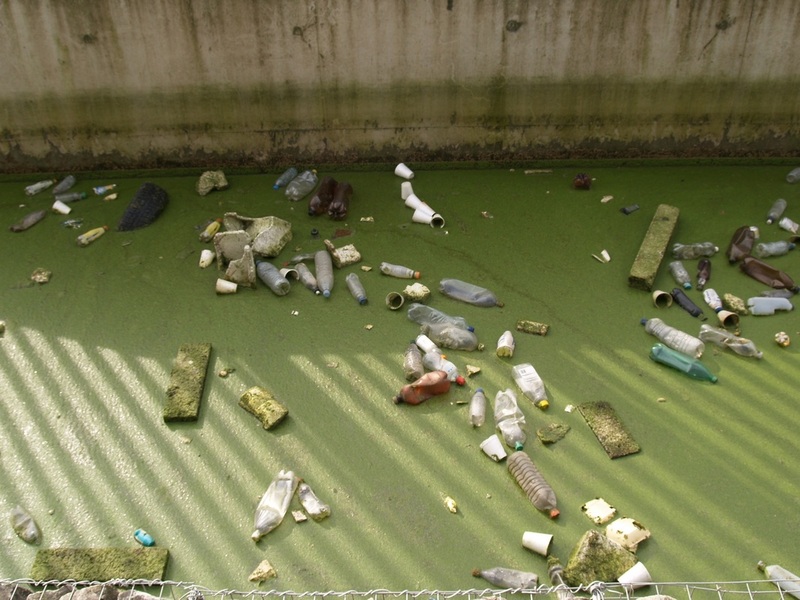 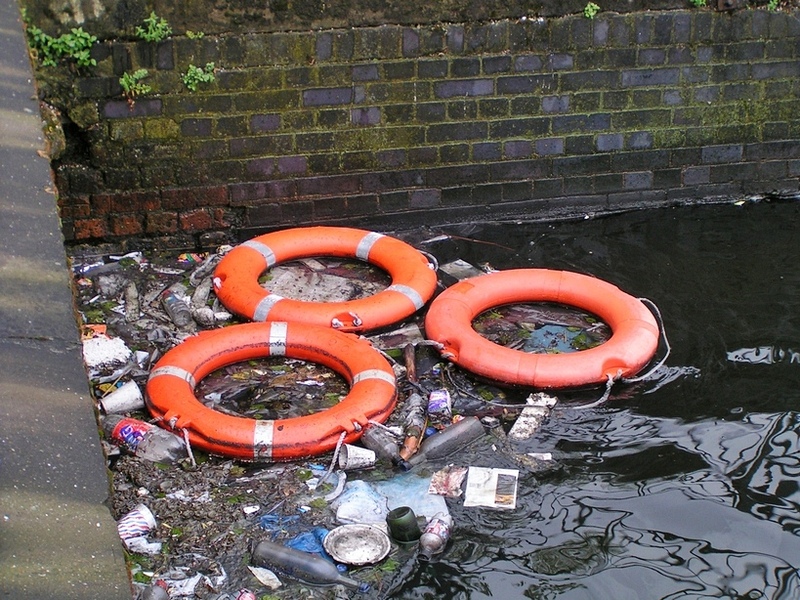 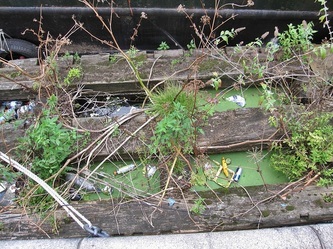 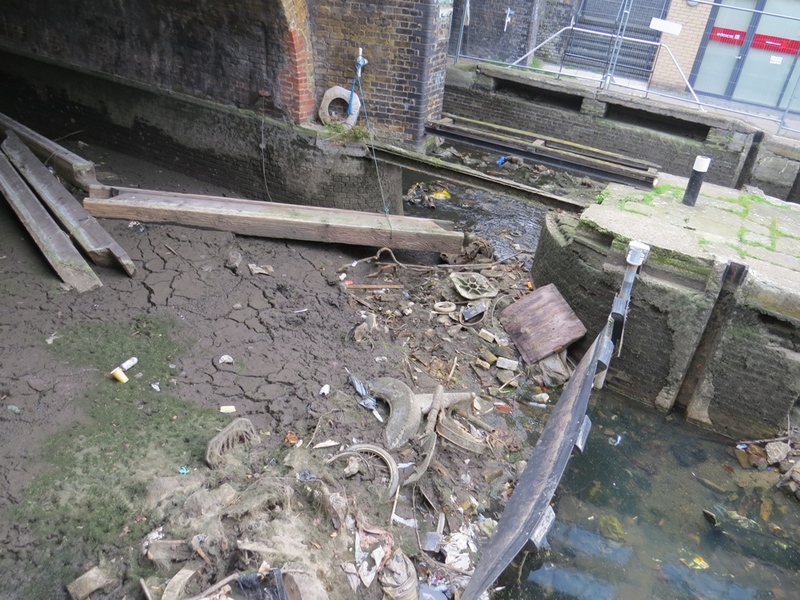 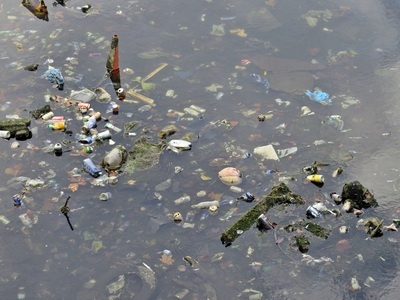 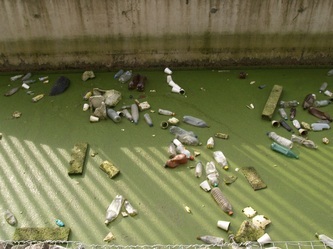 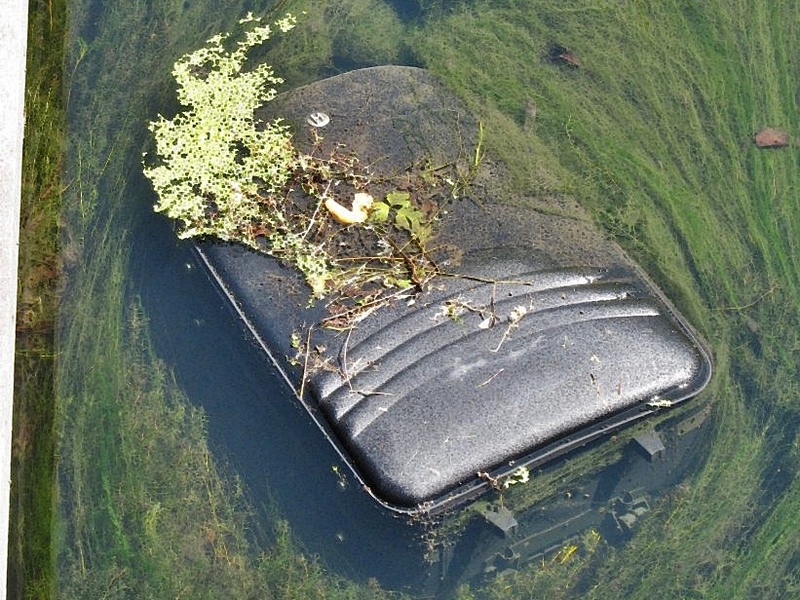 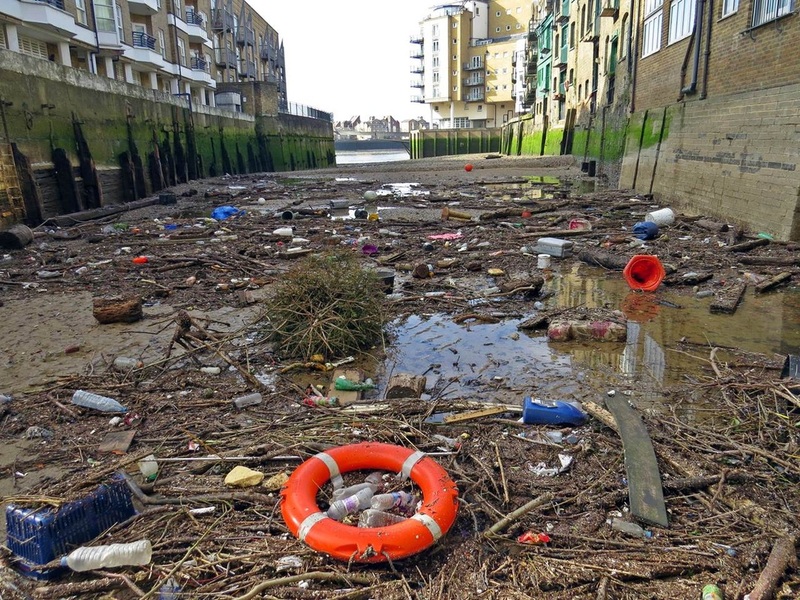 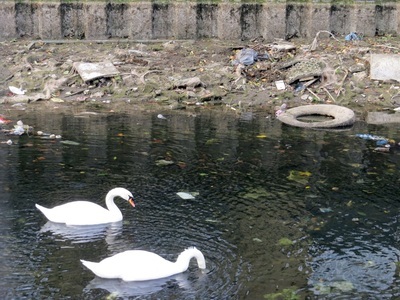 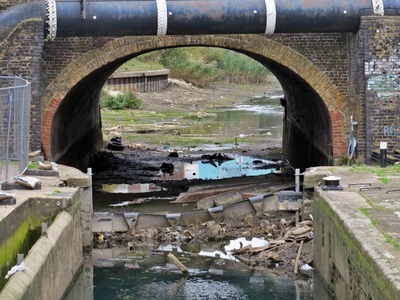 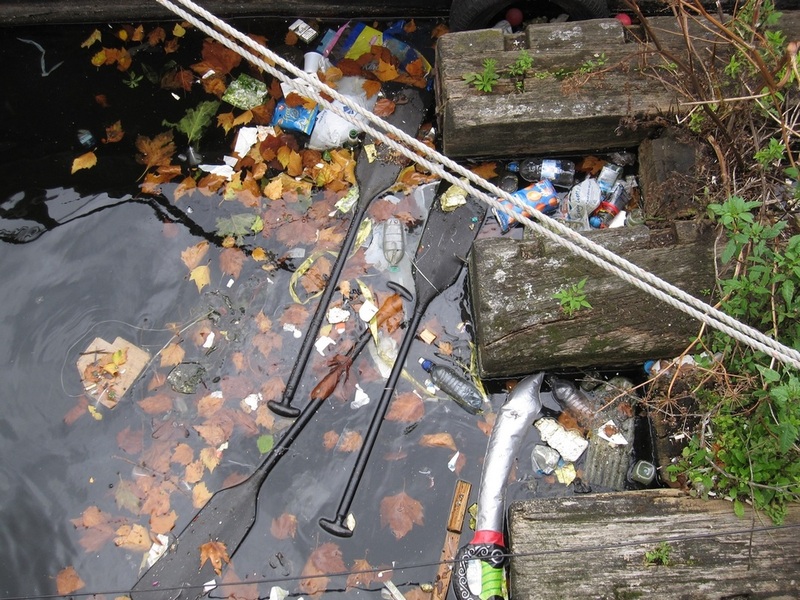 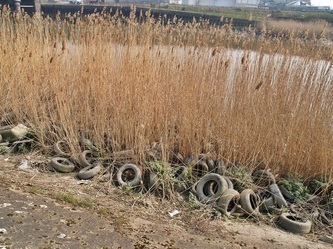 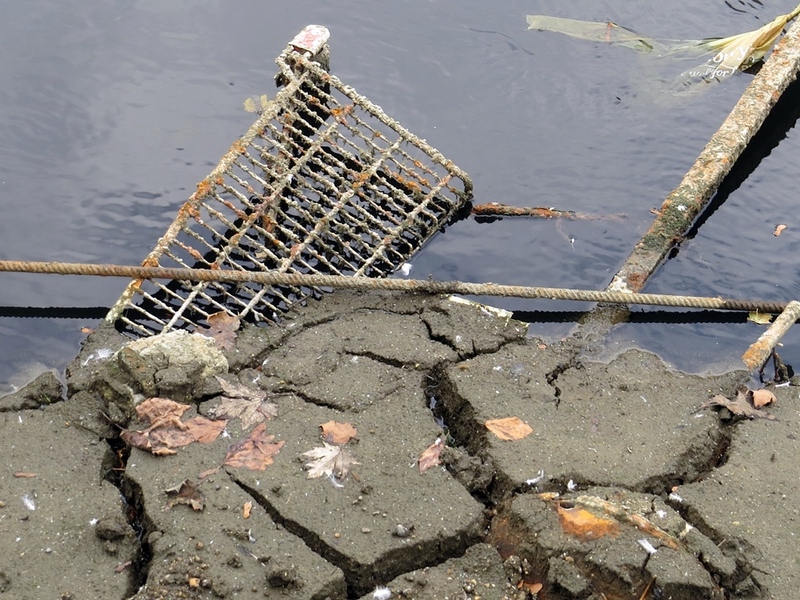 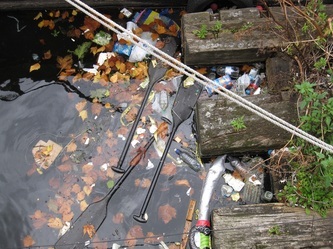 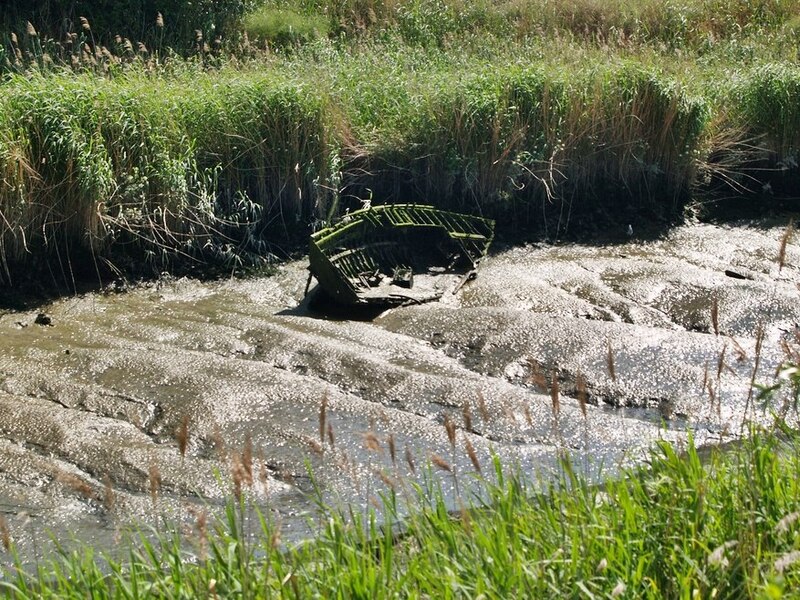 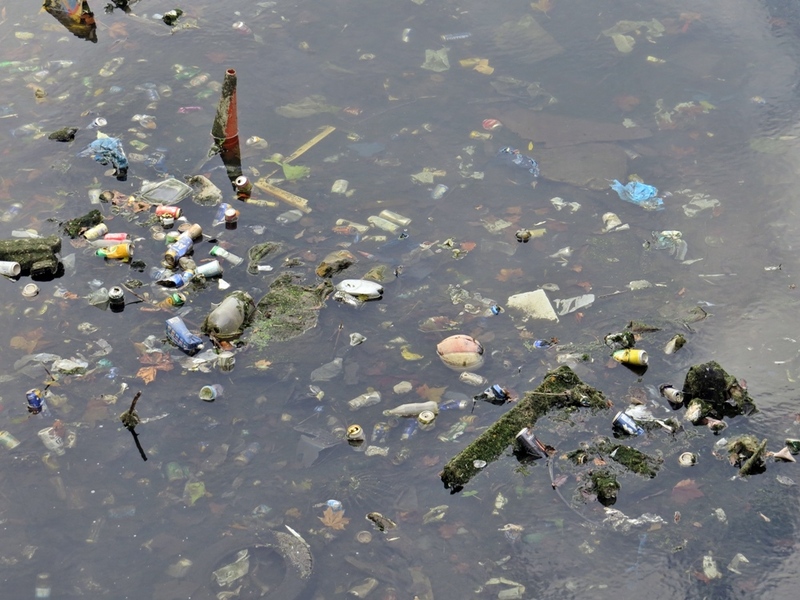 The draining of the canal has highlighted all the rubbish dumped in the canal bed - an unsurprising collection of shopping trolleys, tyres & traffic cones, thousands of plastic bags & bottles plus a few wheelclamps, a safe, knives & traffic signs. 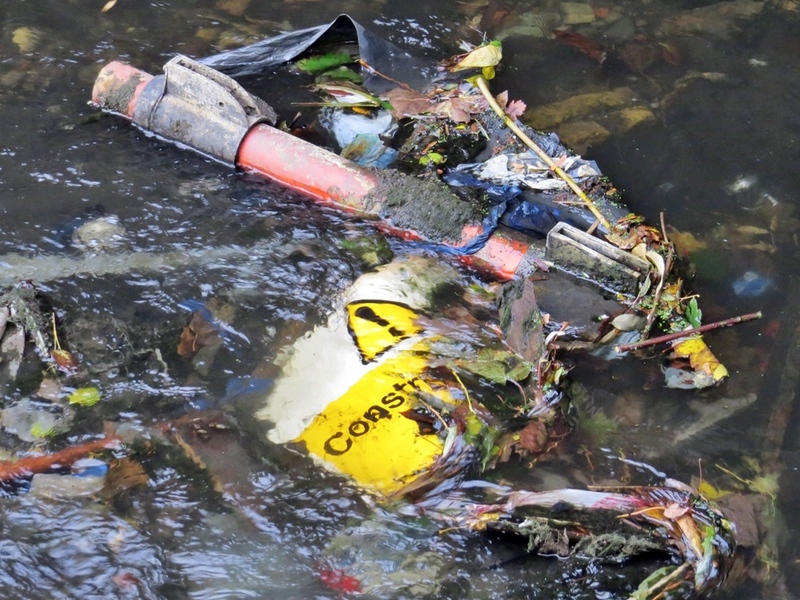 I am surprised that they havent discovered any unexploded wartime bombs.Volunteers have been cleaning up the litter during organised campaigns by the Lower Regents Coalition. 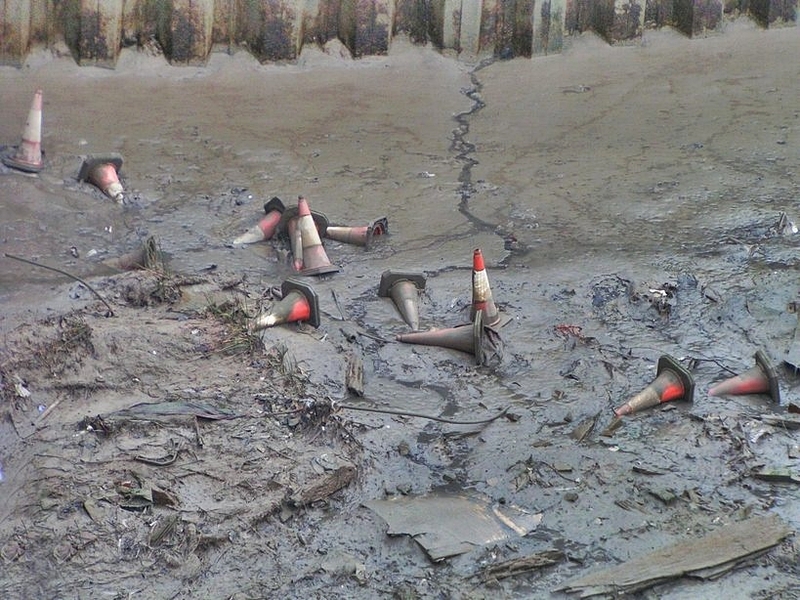 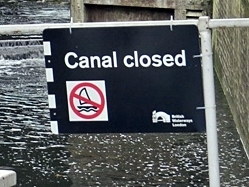 The canal is expected to be reopened by Christmas 2014. 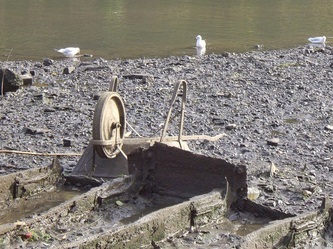 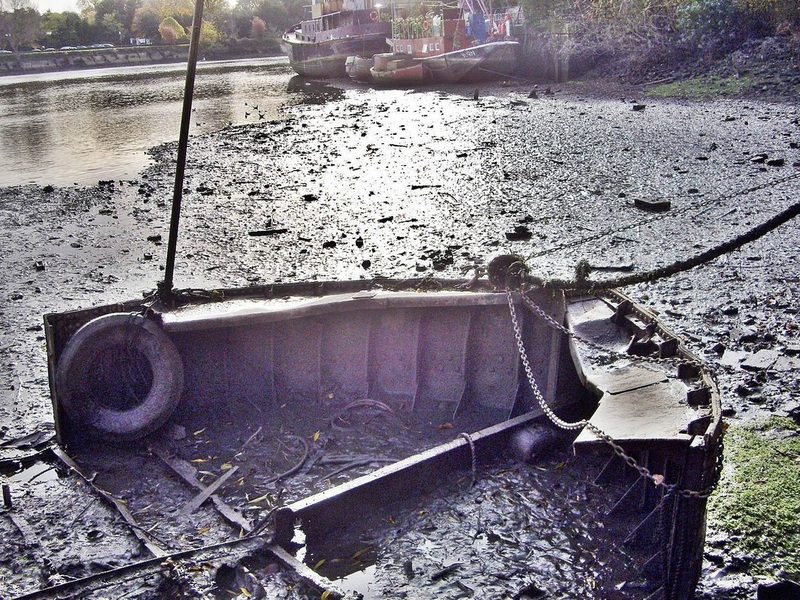 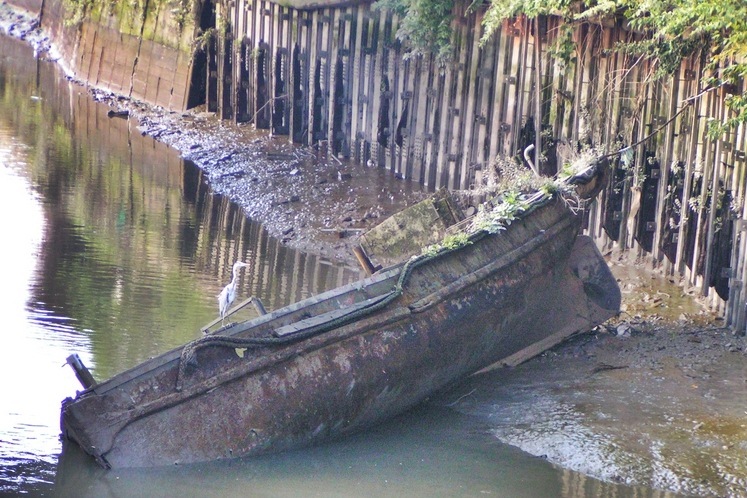 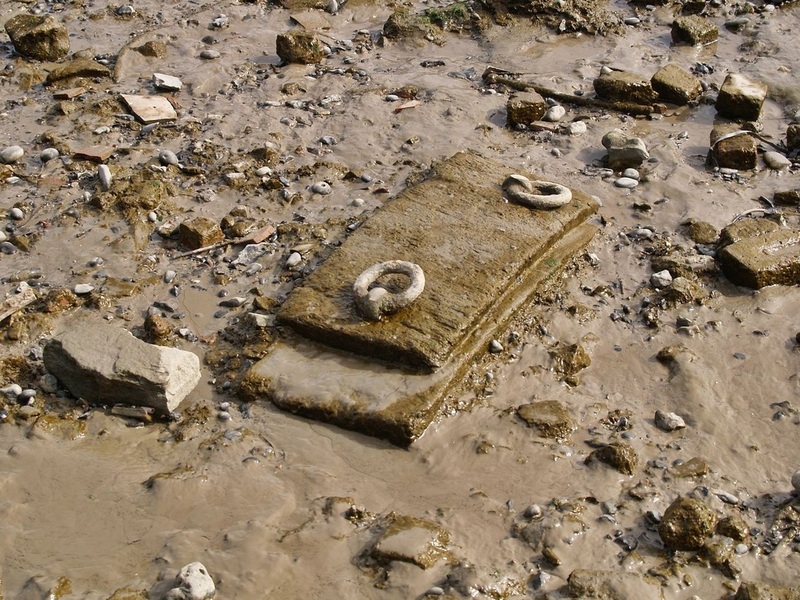 From the medieval period onwards, Deptford was an important place for shipbuilding and fishing. 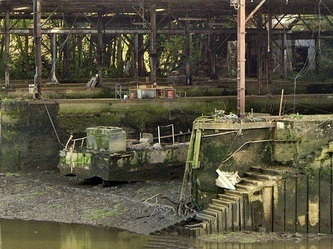 It was then used as a repair yard and as an anchorage for the king’s ships in the reign of Henry V11. 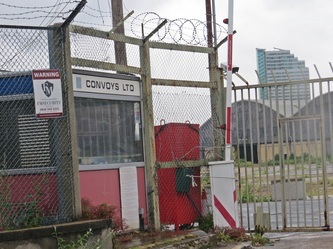 In 1513, The Royal Naval Dock Dockyard was established by Henry VIII, who was born in nearby Greenwich, to become the chief Thames dockyard for building and repairing naval ships bringing a large population and prosperity to Deptford. 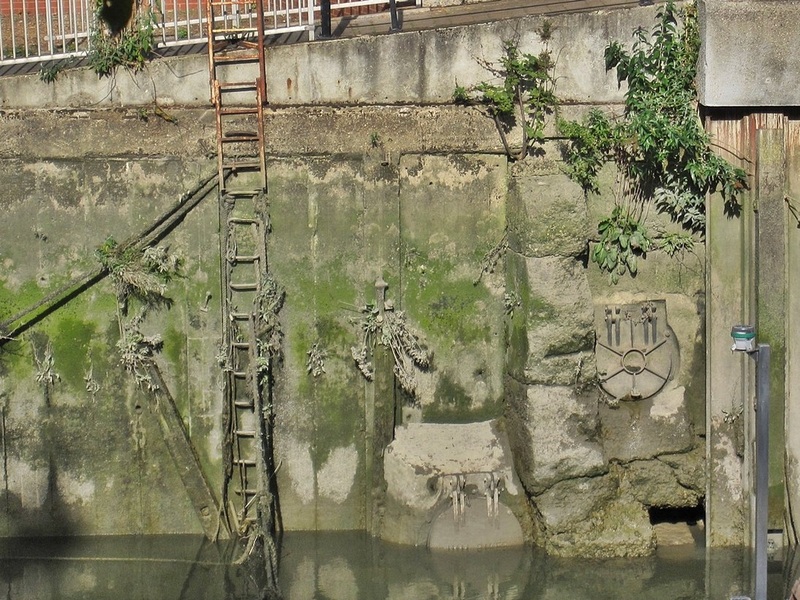 Queen Elizabeth I knighted Francis Drake in Deptford in 1581 after he returned from the great circumnavigation of the globe in the Golden Hind. She directed that the ship be preserved and it remained here until 1662, when the rotting hulk was broken up. 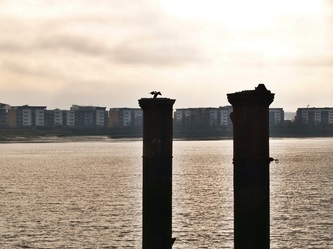 The docks were also noted for building the ships that fought against the Spanish Armada in 1588, Captain James Cook's voyages in the 1770s, and the building of some of the fleet for Nelson’s battles including Trafalgar in 1805. 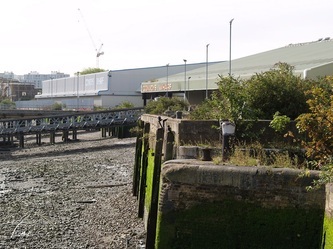 In 1810 The Times reported that more than 20,000 people witnessed the launch of HMS Queen Charlotte at the Deptford Dockyard. 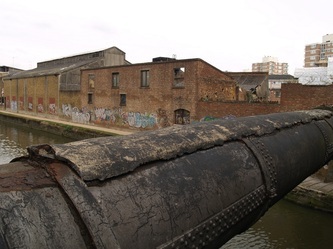 However, by the end of the Napoleonic Wars, in 1815, the Deptford yard was in decline with less demand for new warships and repair work dropped when peace broke out. It eventually closed forever in 1869. 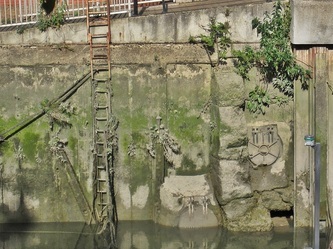 Few ancient dockyard structures above ground level still exist. 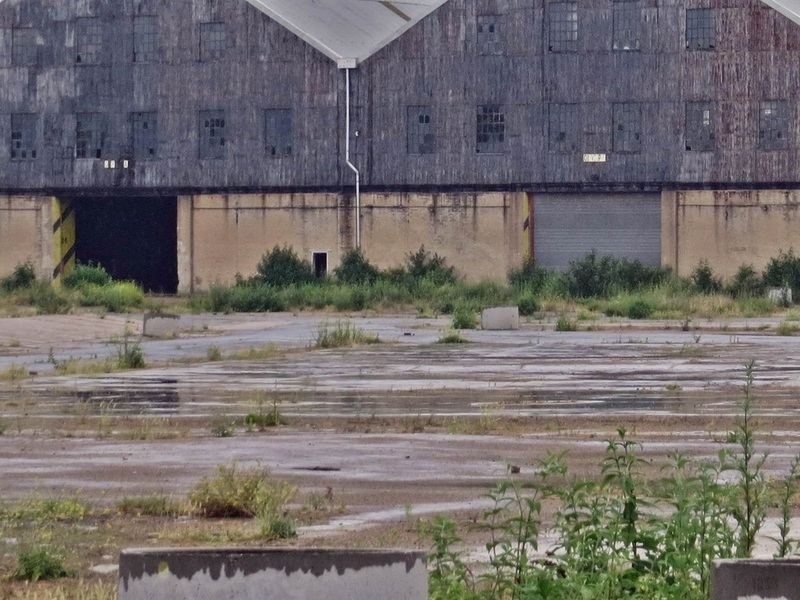 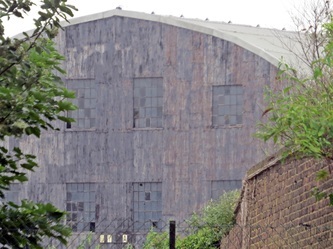 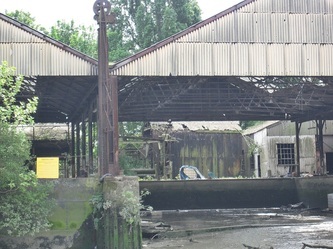 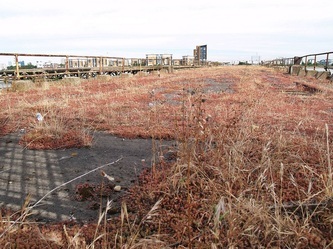 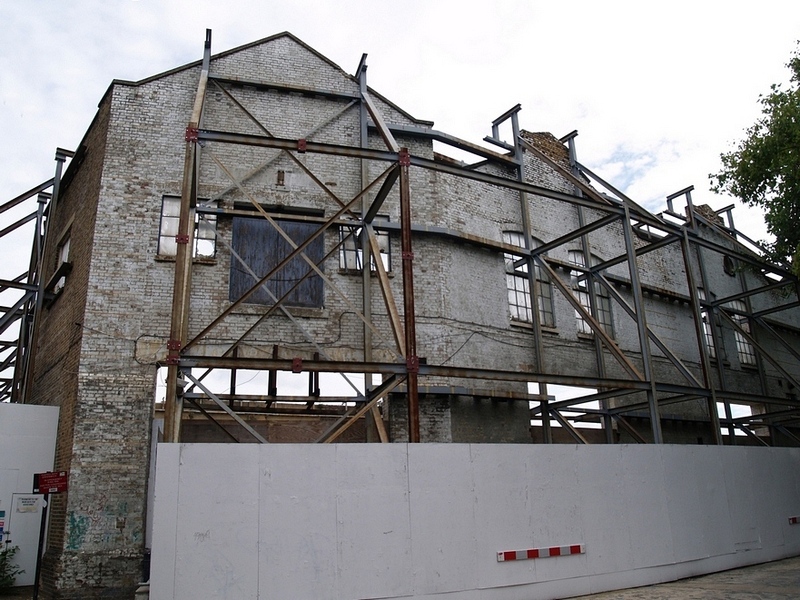 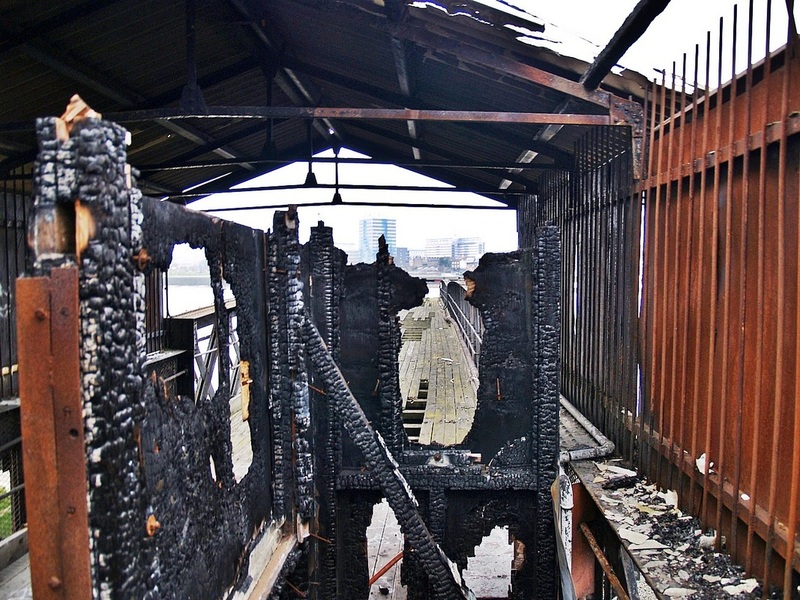 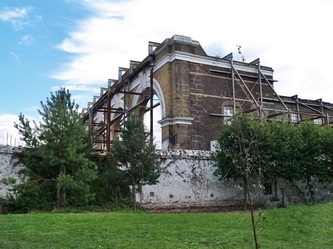 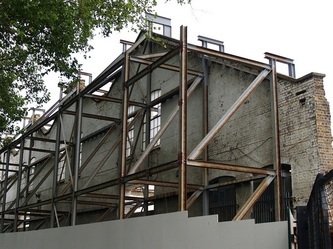 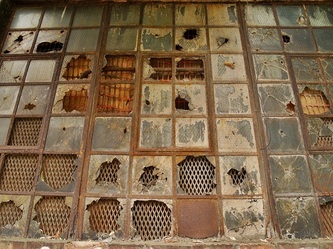 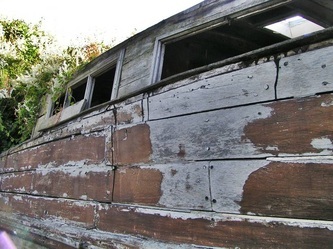 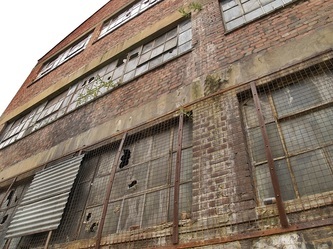 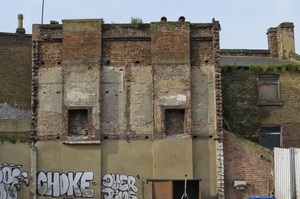 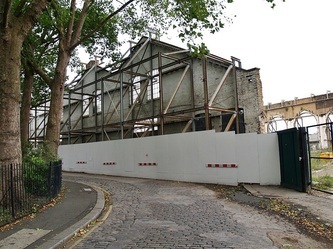 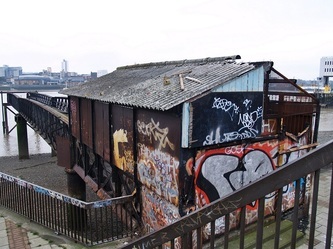 One structure to survive is Olympia Warehouse, a unique cast-iron building constructed in the 1840s.The Olympia Warehouse originally spanned covered slipways, allowing ships to be constructed within. 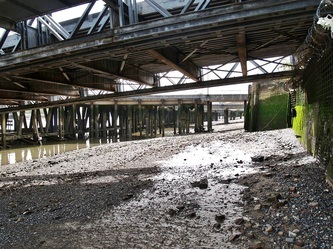 The building now has a concrete floor and its more recent use was simply as a warehouse, the slipways are intact a little below current ground level. Archaeologists discovered that a greater part of the dockyard survives as buried structures including the docks, slips, basins, mast ponds, landing places and stairs which were filled in intact between 1869 and 1950. 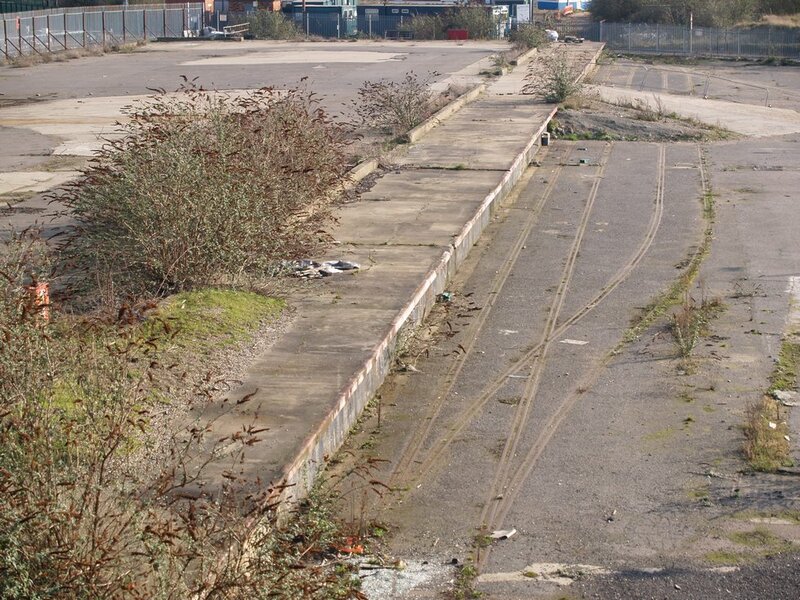 Most recently the site of the dockyard was used by News International for importing newsprint and the site renamed Convoys Wharf from 1984. 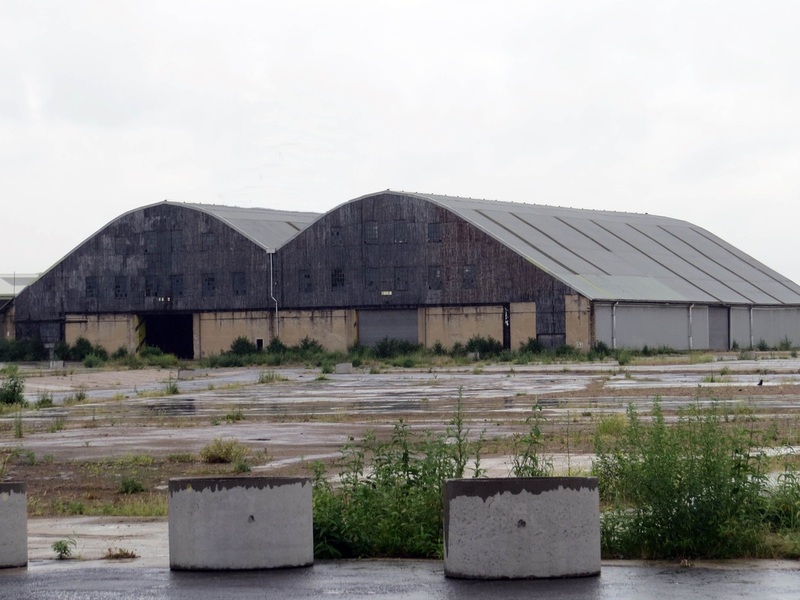 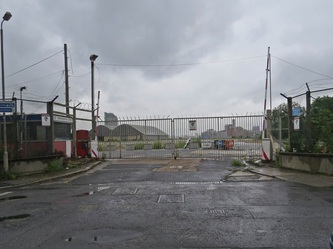 News International have now left and development is planned for the site: "up to 3500 mixed dwellings and leisure and culture space, to give significant and sustainable economic opportunities for the area. The scheme will reconnect the community with its river offering an enriched public realm for local residents and visitors, and will rehabilitate the Grade II Listed Olympia building"
The pier was formerly served by the Docklands River Bus, but has been closed since Low passenger numbers saw the service’s operator go into liquidation. 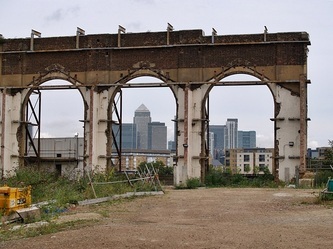 It was originally constructed in the 1870s, to facilitate access for merchants to the East and West India Dock Company's new wool warehouses at the South Dock of the West India Docks. 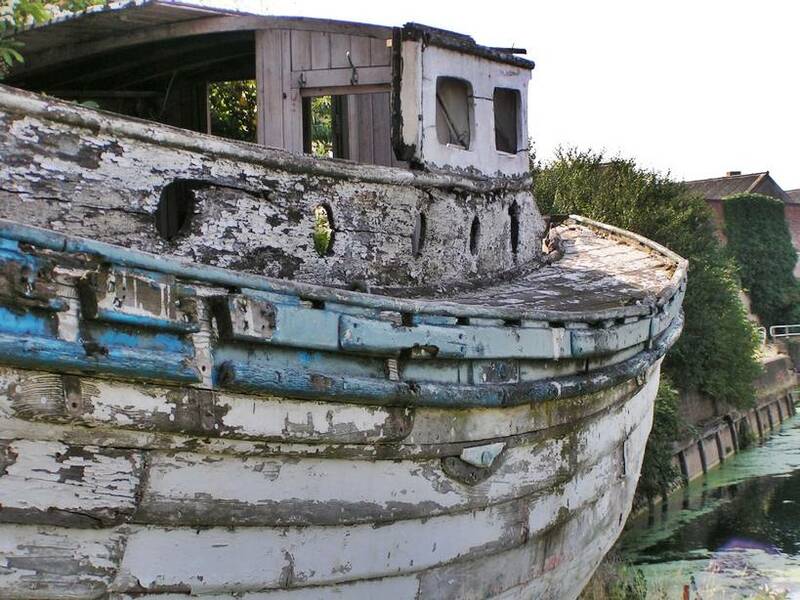 It was re-built after it was destroyed in World War II. 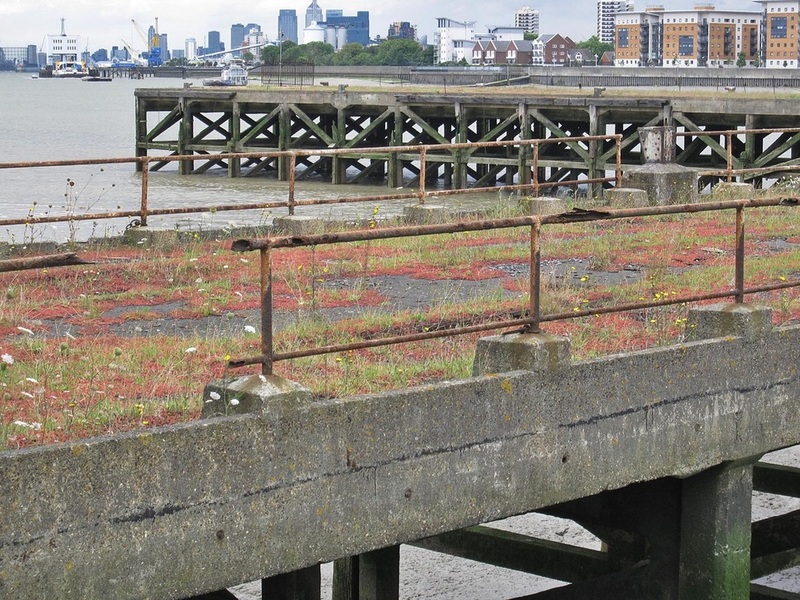 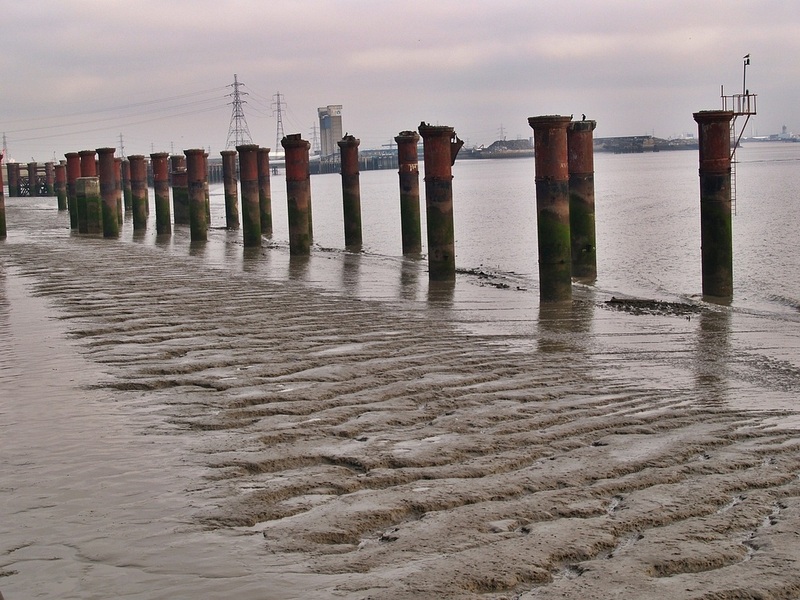 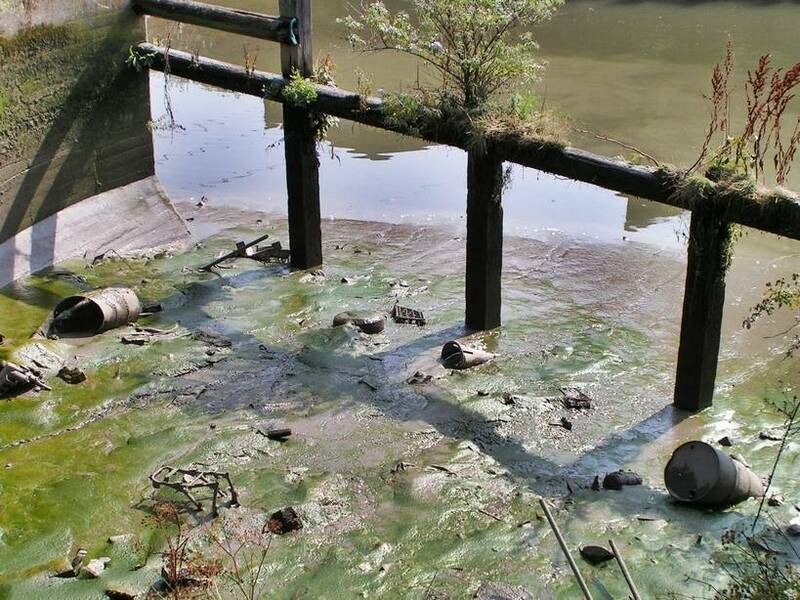 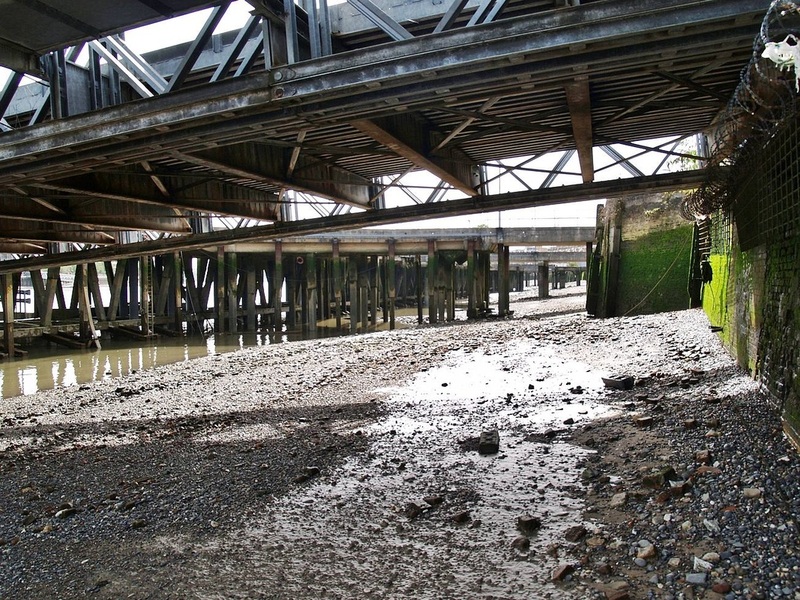 This is pier is covered in the Derelict London/Lost Docks/Lost Canal tour of the Isle of Dogs (available from Summer 2014). 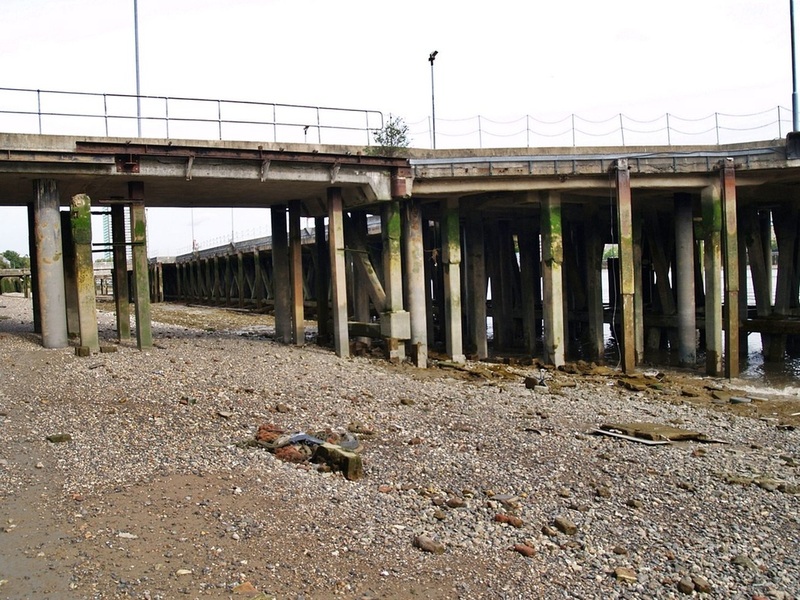 Stop Press: The pier has now been restored! pics to follow at some point. 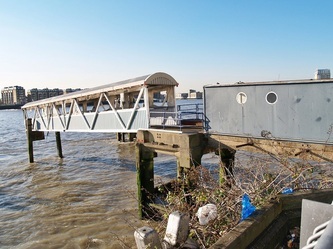 Before the Woolwich Ferry began providing a free river crossing, the Great Eastern Railway had its own cross-river passenger ferry service, for which they charged one penny. 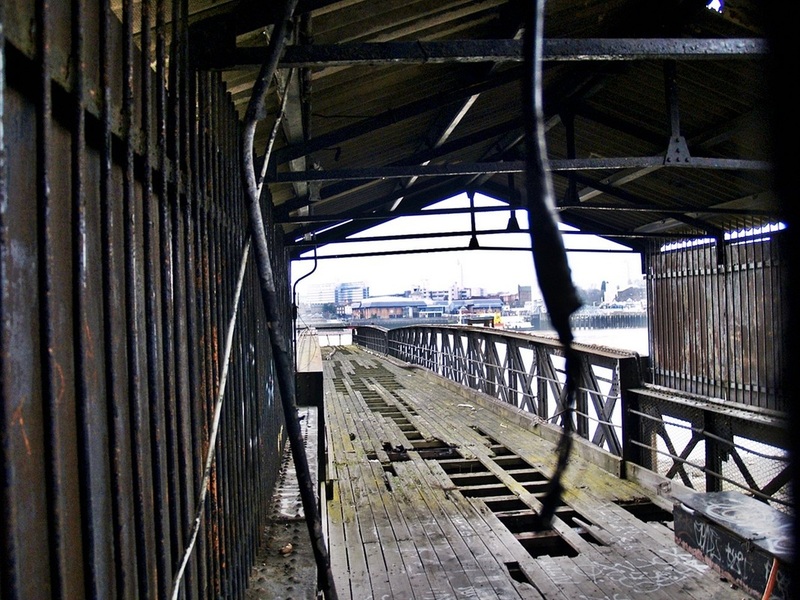 The pier is adjacent to the (now closed) North Woolwich Station. 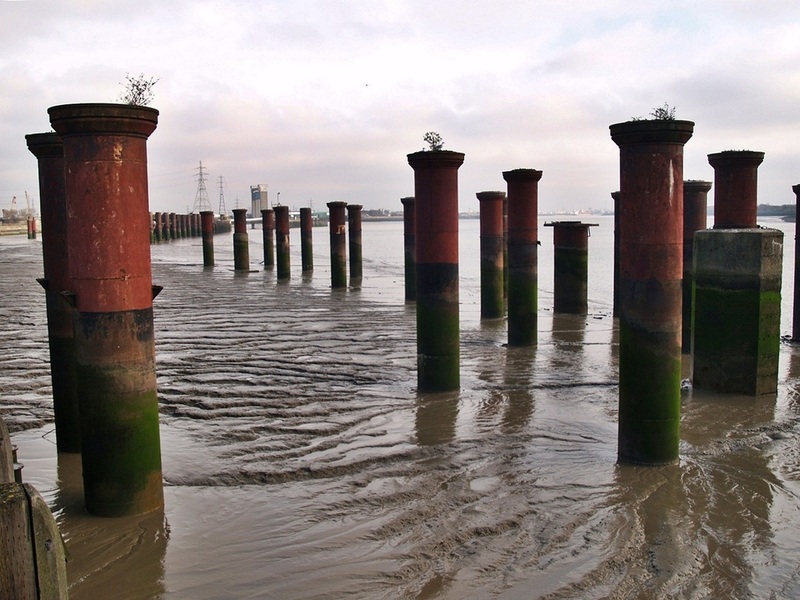 A grim moment in the pier's history was in 1878, when the paddle steamer 'Princess Alice' crashed with a ship and sank within 4 minutes in Gallions Reach. North Woolwich was to have been her next stopping point. A large crowd gathered here to await news of their relatives and friends.Approx 640 people died.Those waiting at the pier faced the ordeal of seeing the bodies being brought in. In 1908 the railway company withdrew the service as it was unable to compete with the free Woolwich Ferry.The pier was retained and until WW2 was used by the LNER as a calling point for river steamers providing a service to Southend and Margate. 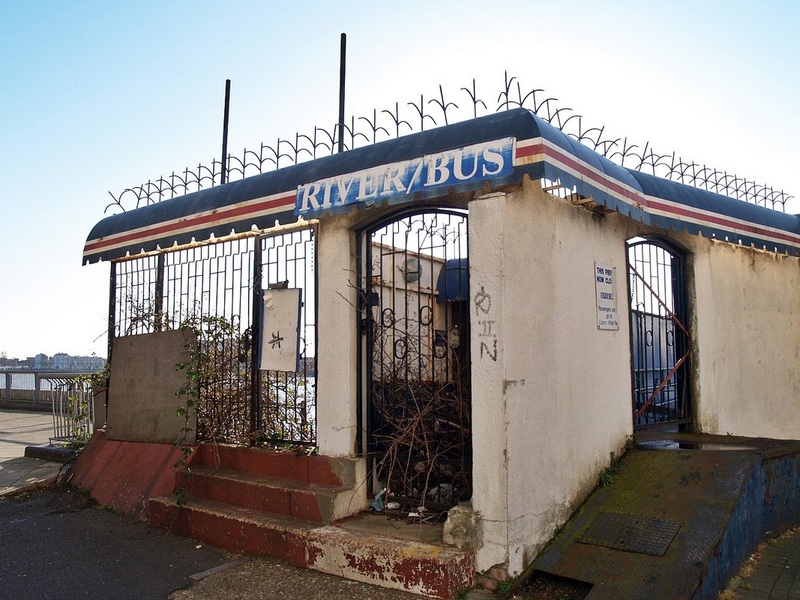 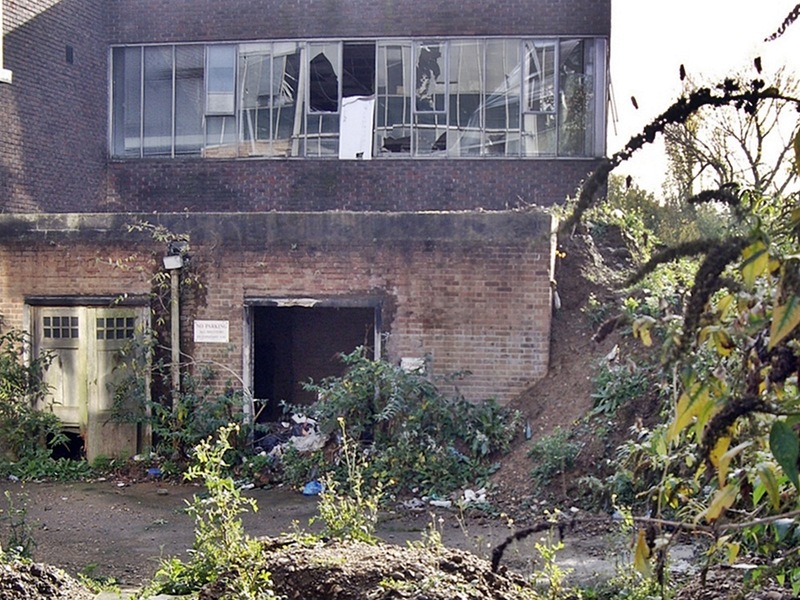 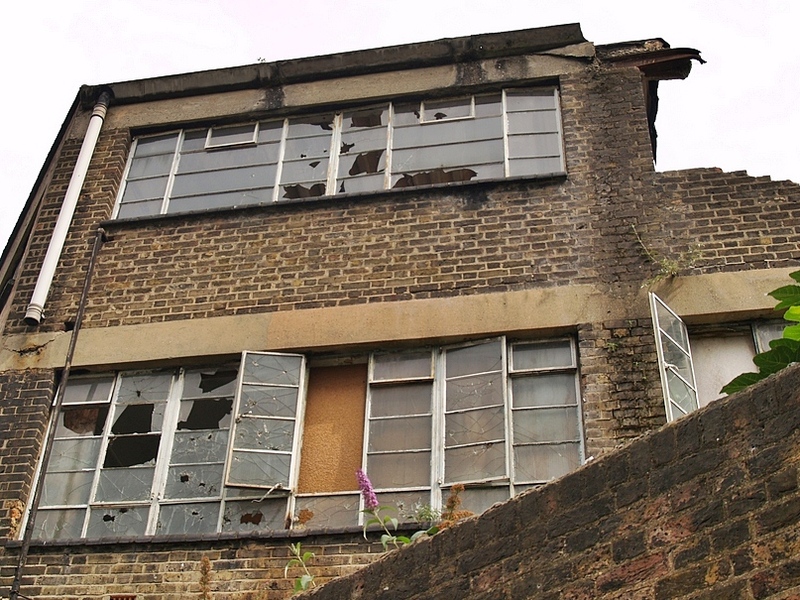 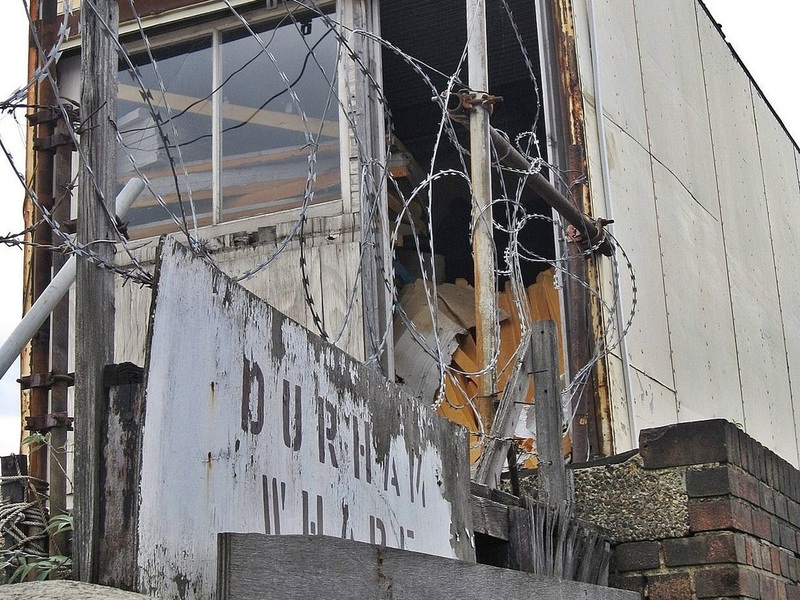 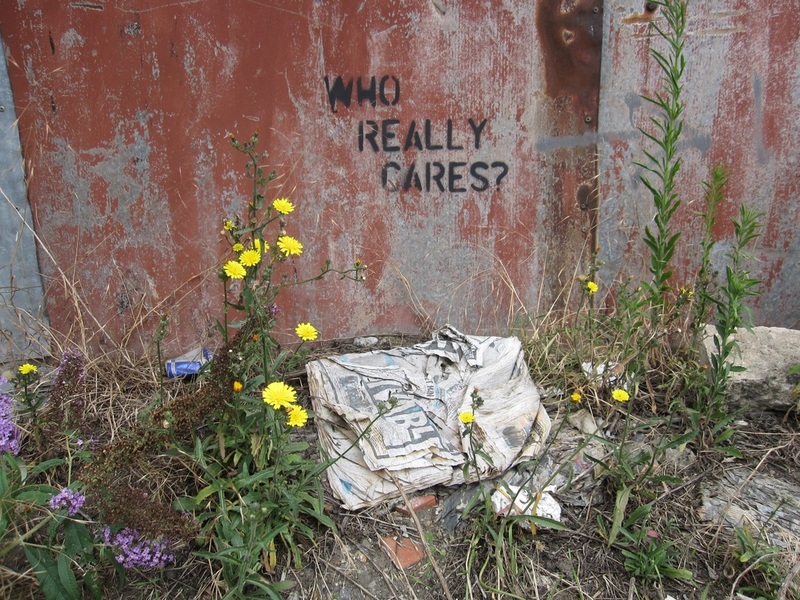 This is another site that we visit on the Derelict London guided allday walking tour of Woolwich. 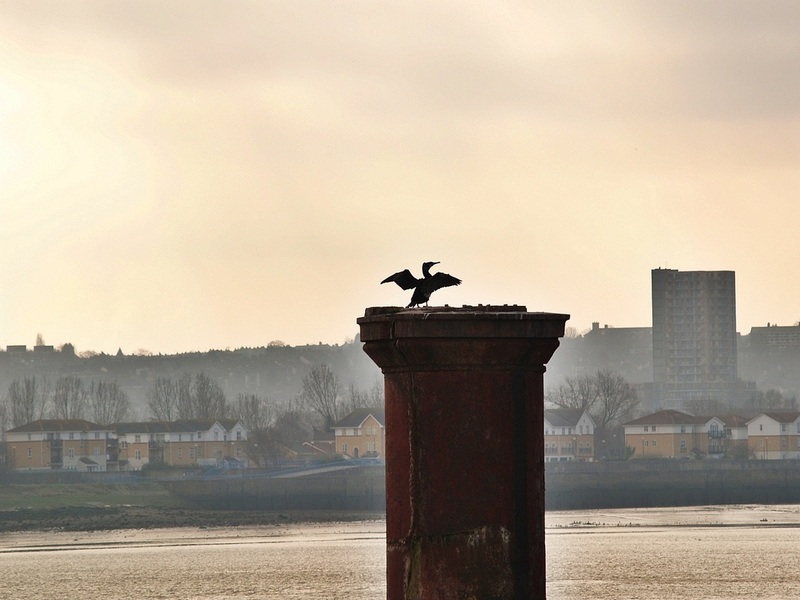 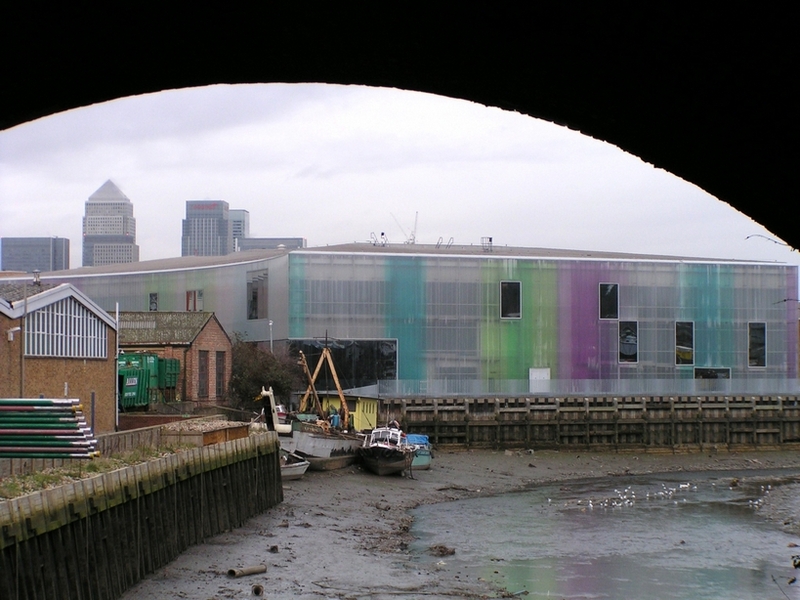 The name Limehouse came from the lime kilns were sited here from the 14th century onwards. 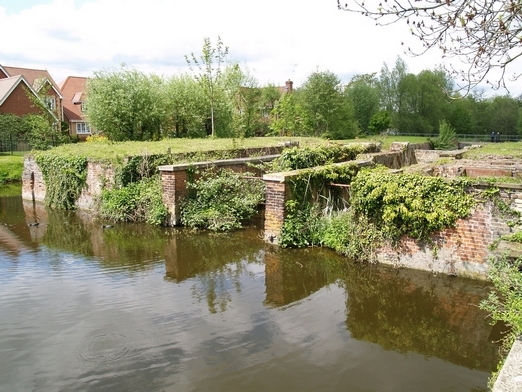 The lime produced was used for the plaster in the wattle and daub timber-framed buildings of the period. In the 18th century Limehouse was London's Chinatown. 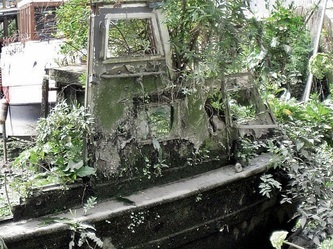 There was a population of Chinese sailors who had come off the boats. In the Sherlock Holmes stories Limehouse was thought to be filled with Chinese opium dens. The Limehouse Cut, authorised by an act of parliament in 1766,is actually the oldest canal in London and provides a short cut from the Thames to the Lea. 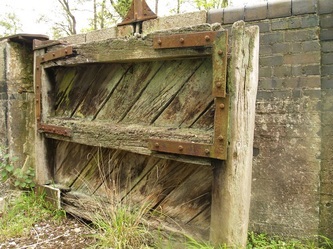 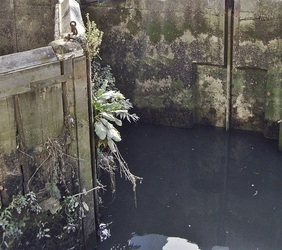 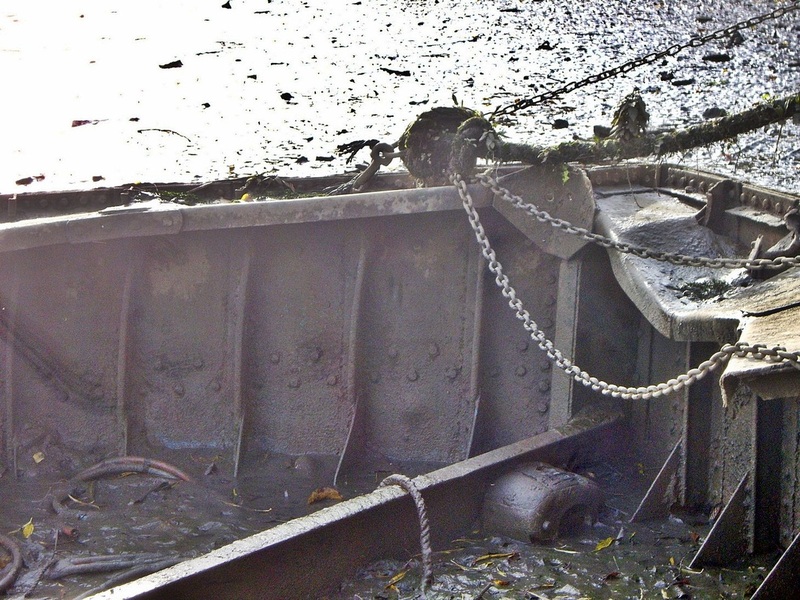 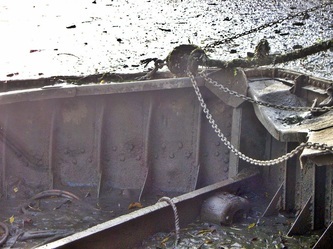 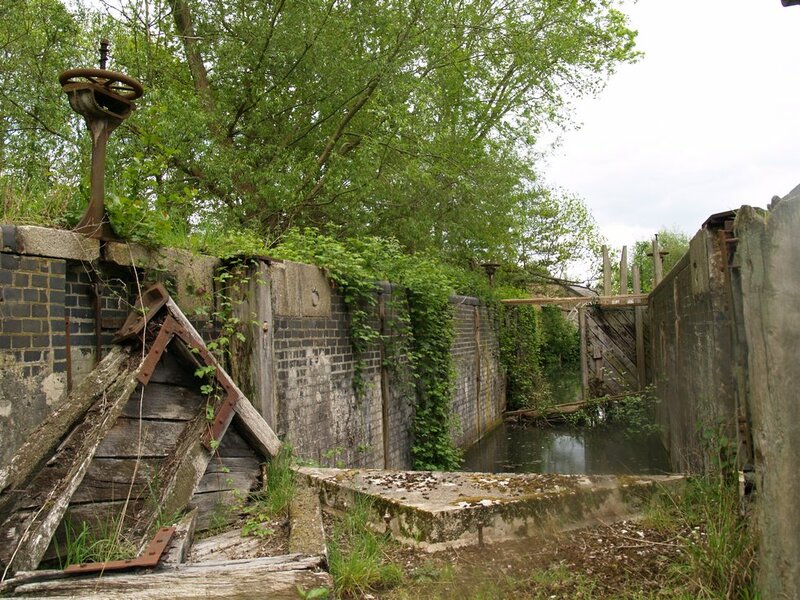 It originally cut its way directly to the Thames, but this lock was replaced in 1968 with a short canal leading into the Regent’s Canal at what is now Limehouse basin. 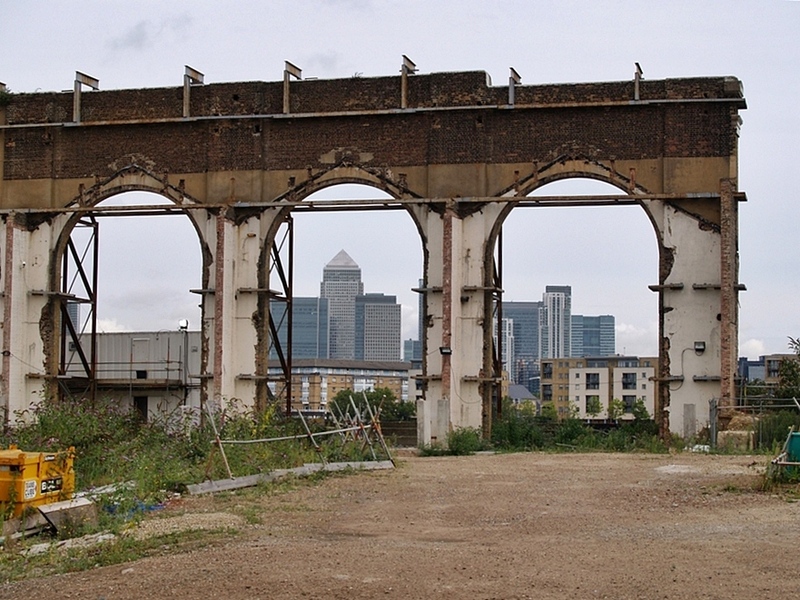 Today Deptford is overshadowed by nearby Greenwich, but it, too, has played an important part in London’s history. 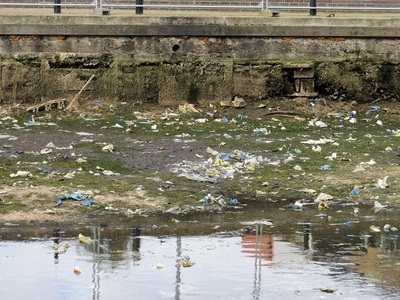 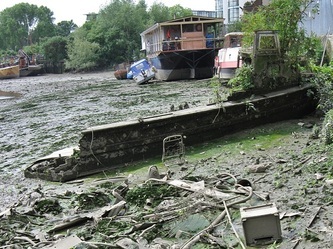 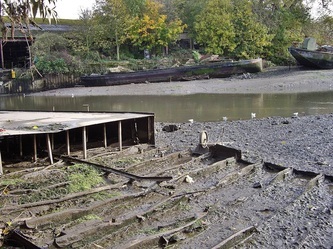 A fishing village in the Middle Ages, it witnessed the Battle of Deptford Bridge in 1497 on a site adjacent to Deptford Creek when Cornish rebels under their leader Lord Audley were soundly beaten by the king’s forces. 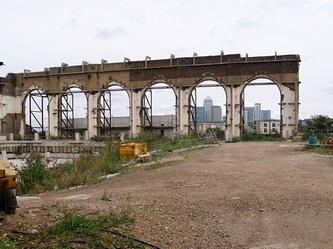 A few years later Henry VIII created a royal dockyard here, and it was at Deptford that Elizabeth I knighted Francis Drake on board the Golden Hind on his return from circumnavigating the globe in 1580. 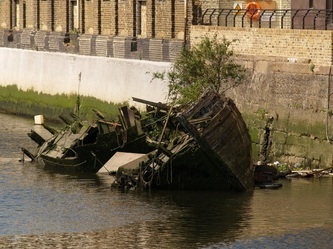 The Golden Hind remained moored in the creek until it broke up. 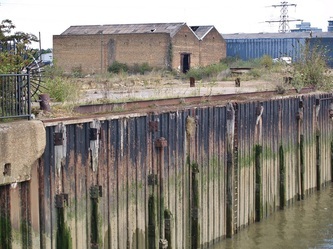 Later still Captain Cook’s ships Resolution and Discovery were equipped at Deptford before his last voyage to the Pacific. 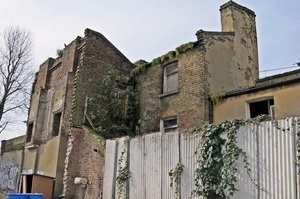 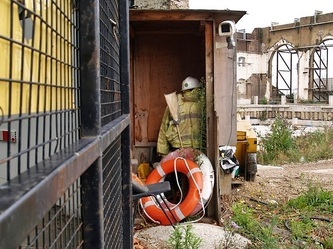 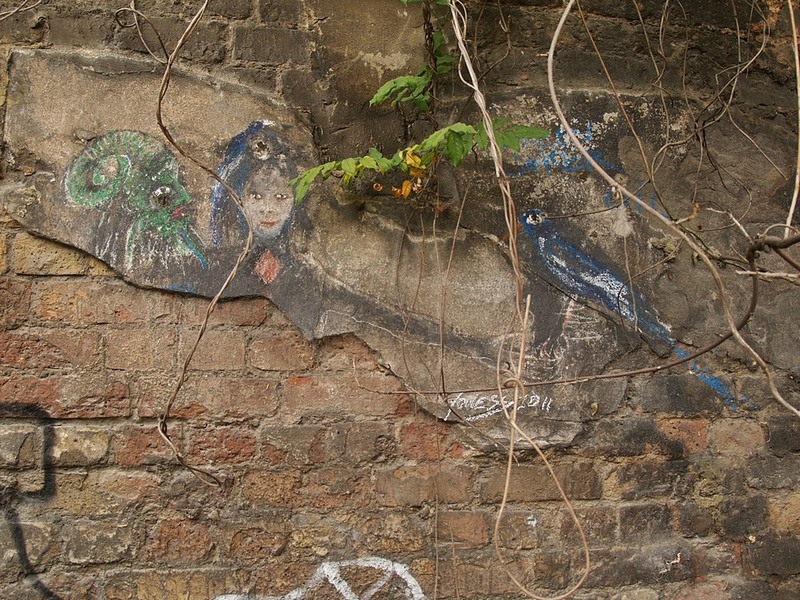 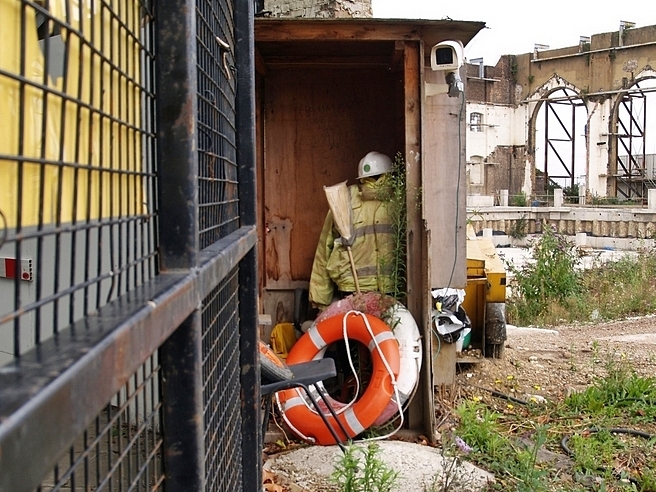 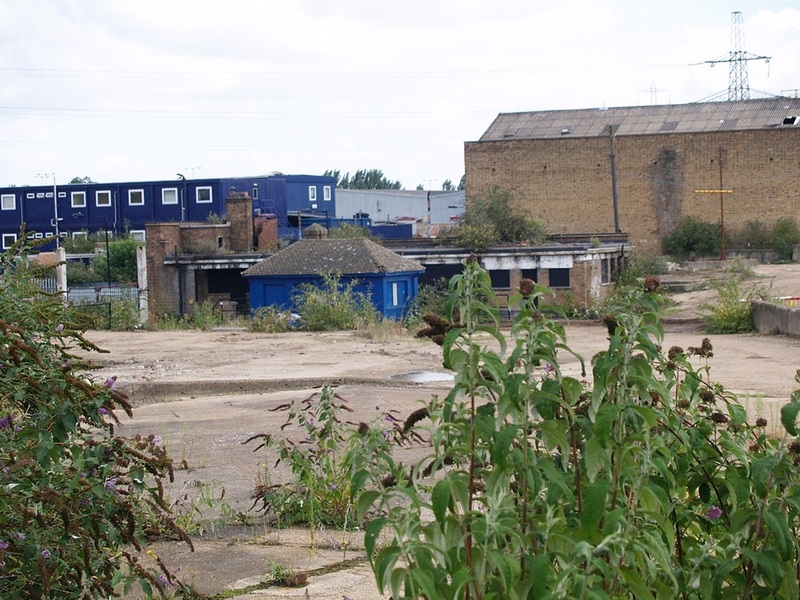 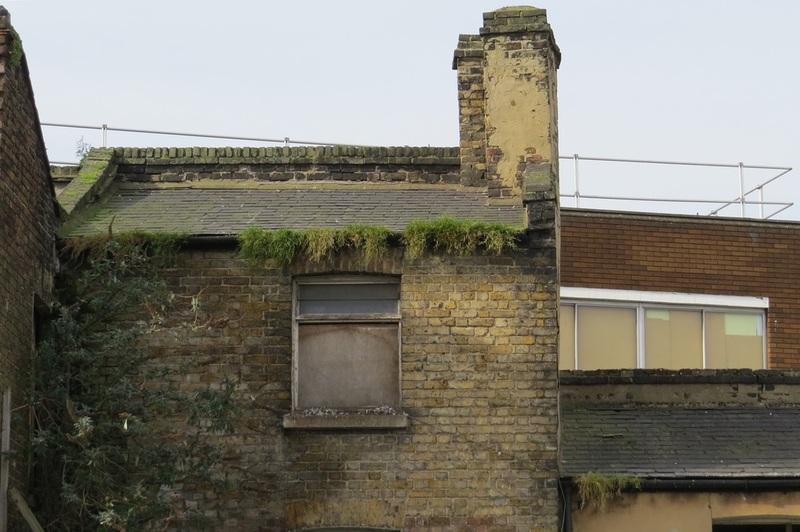 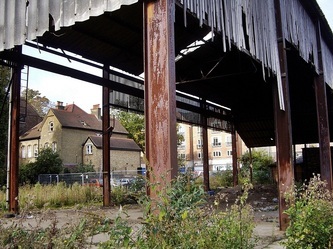 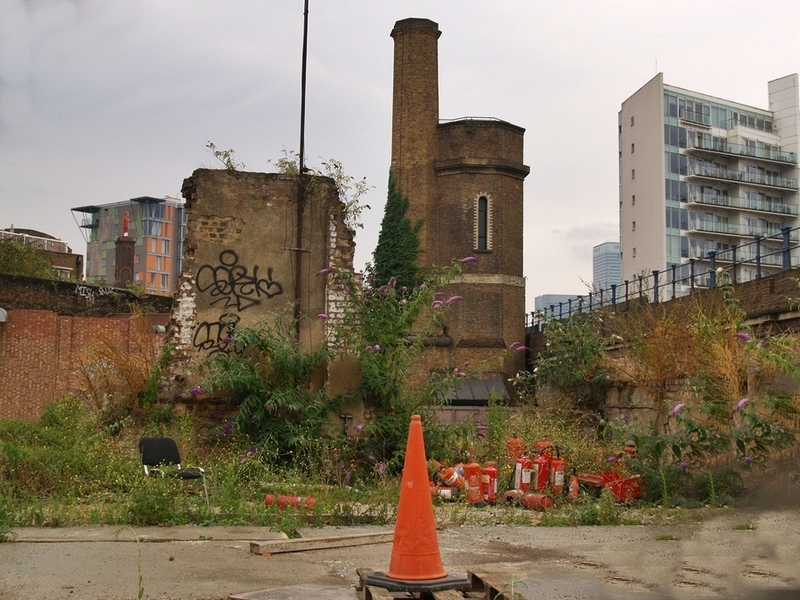 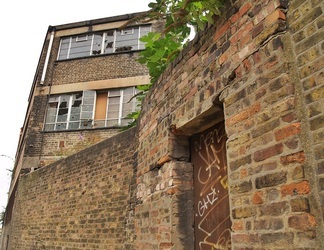 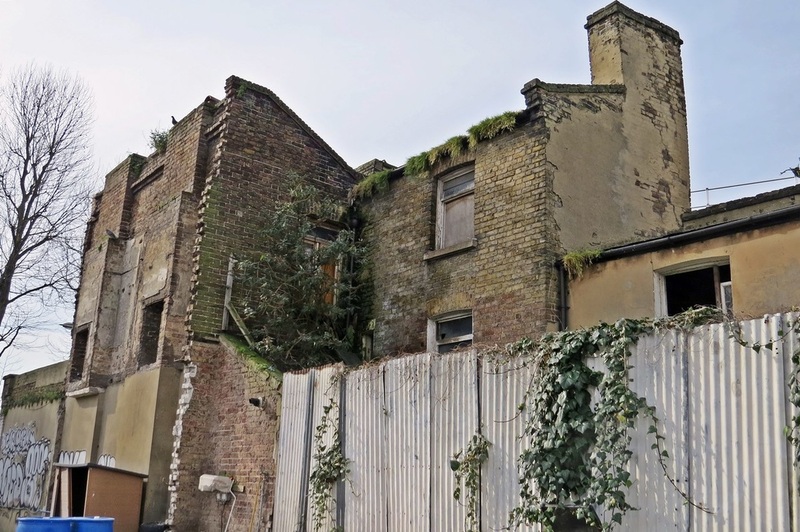 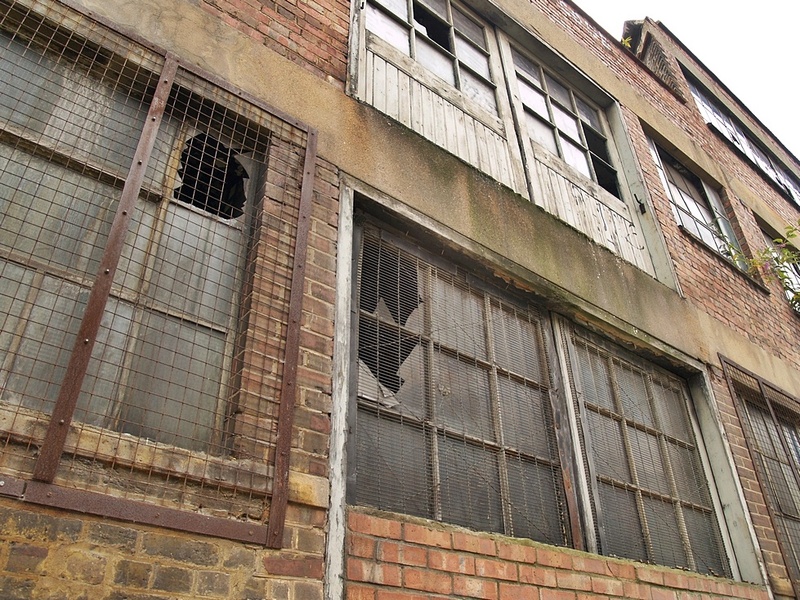 Deptford’s fall from grace has been dramatic, although regeneration of the area is now under way. 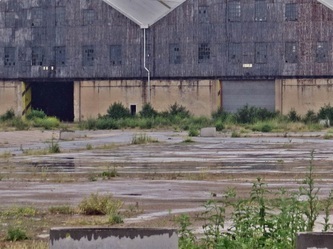 In the meantime the abandoned industrial landscape has produced a lively local wildlife habitat. 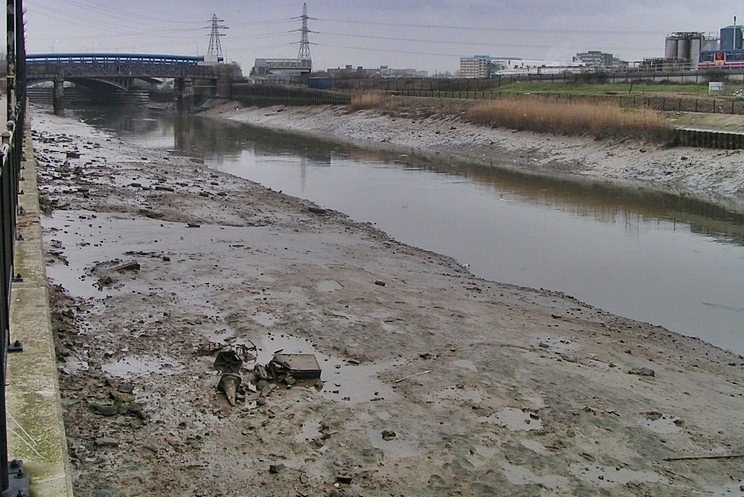 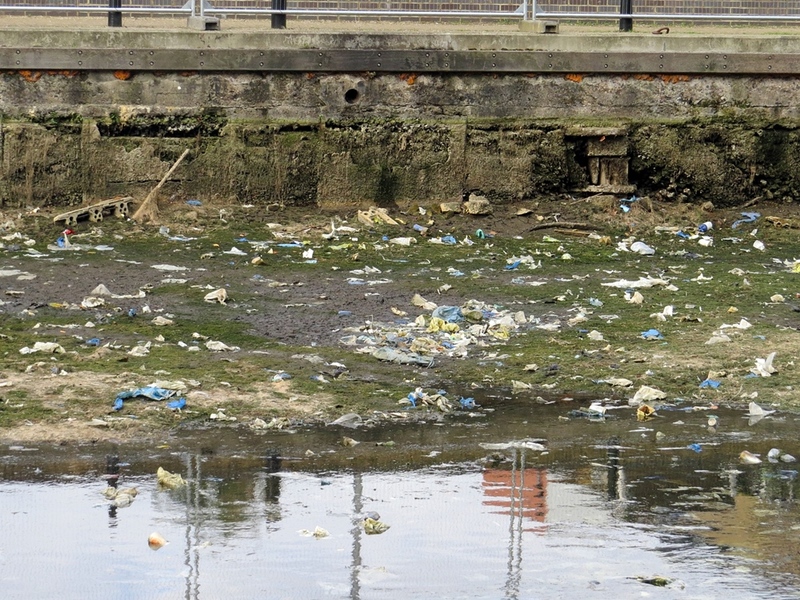 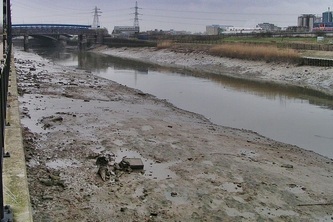 This is where the River Lee (or Lea) reaches its tidal estuary. It was navigable from a very early date. In 896 King Alfred the Great is believed to have chased the invading Danish fleet up the Lea. 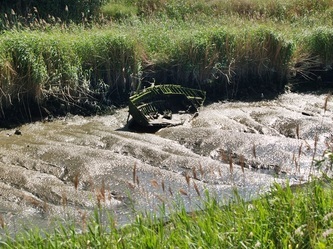 The Anglo-Saxon Chronicle tells of Alfred lowering the water-level of the Lea to strand the Danish invading fleet upstream. Being outside the City of London and free from its regulations, the area became a centre of mills and industry in the Middle Ages. 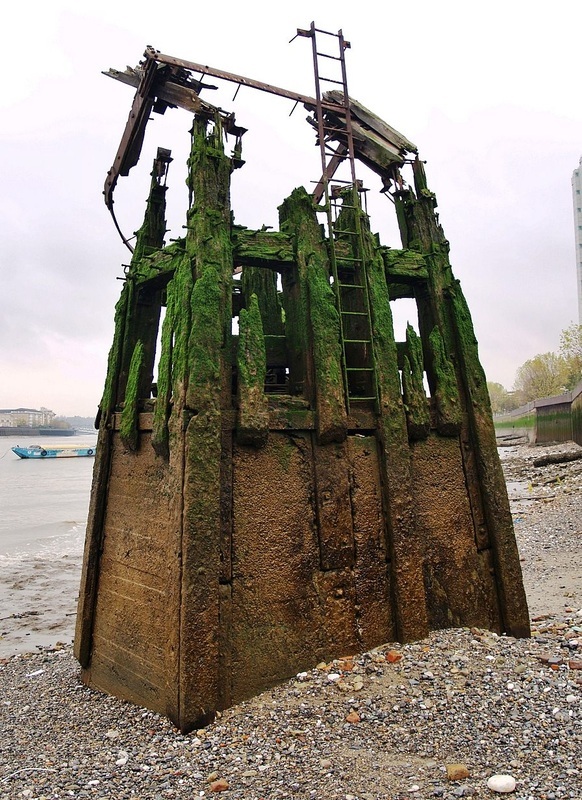 Some traffic (but not much) remained until the 1970s for the Pura Vegatable Oil refinery – prior to building their own wharf on the Thames (due south of the site and linked by an underground pipeline). 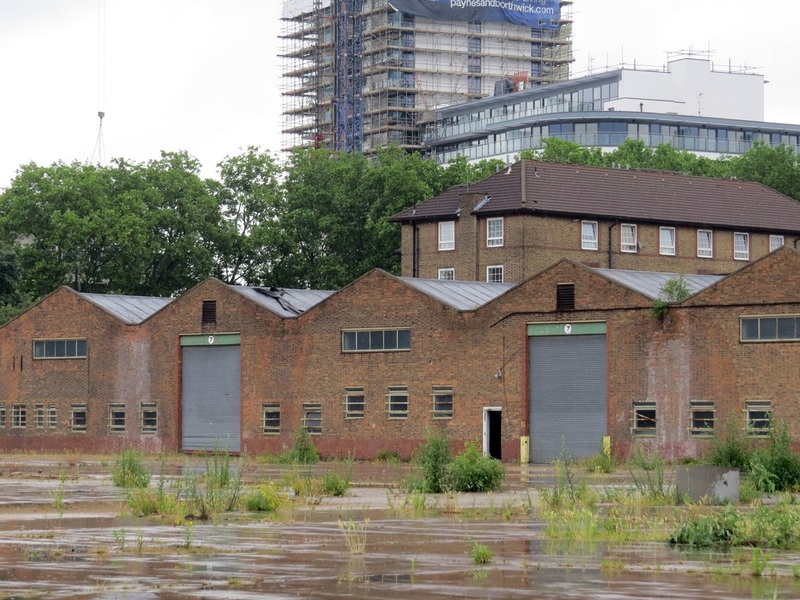 Thames Ironworks had built ships in Canning Town since the mid 19th century at their yard along both sides of Bow Creek adjacent to the Thames. The Ironworks built some of the largest vessels of their time. 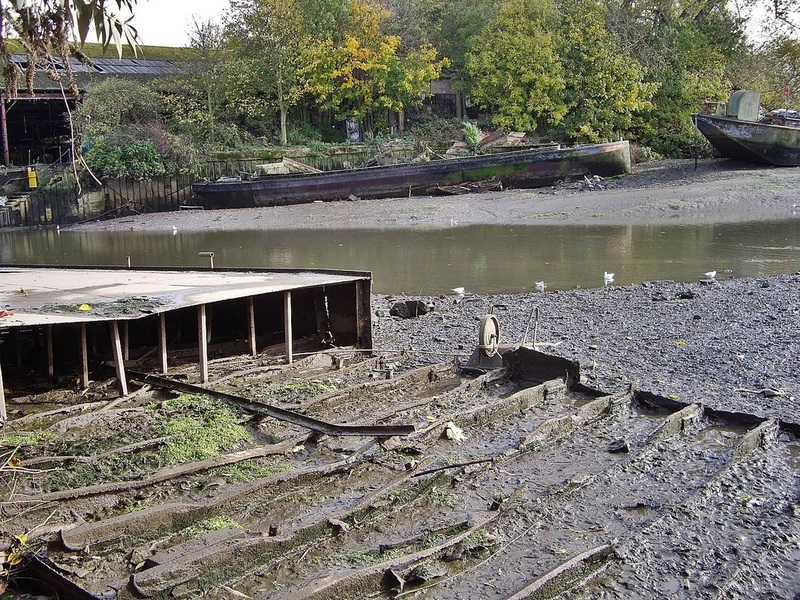 Because the width of the river at Bow Creek was relatively narrow, the larger vessels were built parallel to the shore and launched 'sideways' into the river. 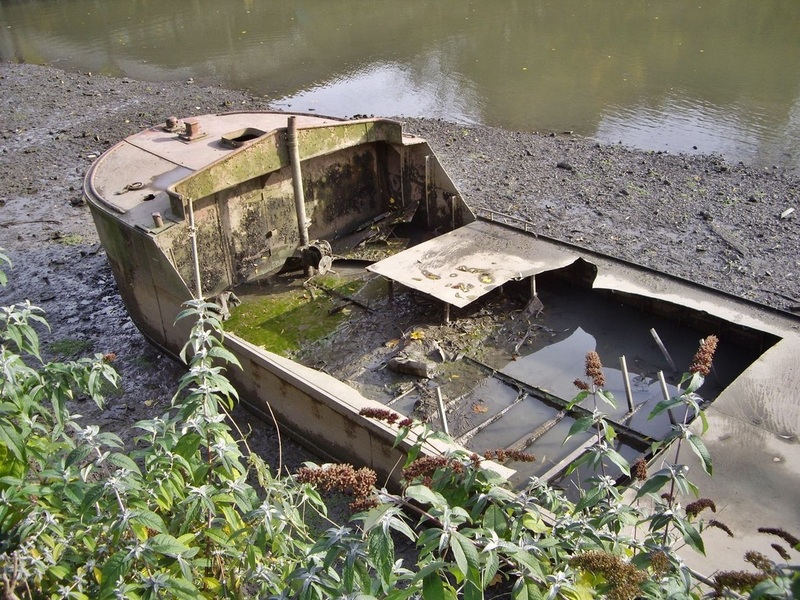 On the occasion of the launch of the Navy battleship HMS Albion this was also to be the case. However up to 200 people keen to get a good view of the launch had made their way to a temporary slipway 'bridge' beside a nearly completed vessel also being built in the yard for the Japanese navy, to get a better view of the occasion. 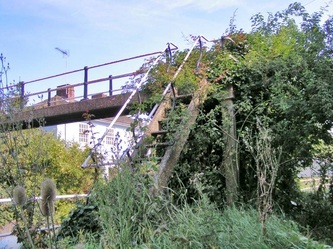 The 'bridge was not designed to hold so many, and was signposted as 'dangerous', but despite this a large crowd had gathered and those on the bridge felt they had the perfect viewpoint to see the ship launched by the Duke and Duchess of York. 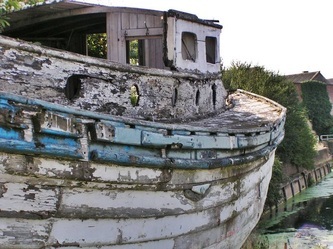 Local schools were given the day off and thousands were standing watching when the 390 foot long, 74 foot wide, 6,000 ton ship slid into the water. 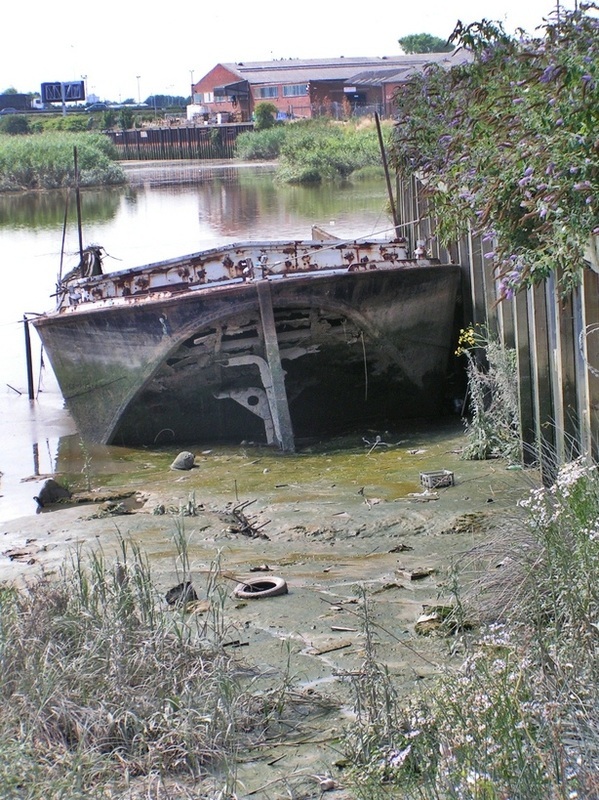 The momentum of the vessel's launch created a large 'tidal wave' which raced along and crossriver and engulfed the 'bridge', smashing it to pieces and plunging shocked onlookers into the river, where they were also smashed by the broken bridge and the inevitable debris of the launch itself. 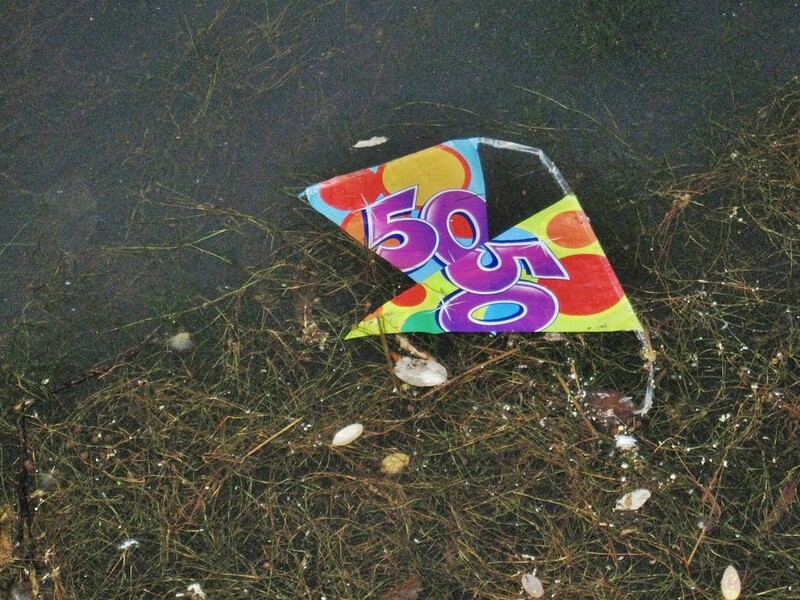 Their cries of panic were drowned out by the cheers of the main crowd applauding the launch. 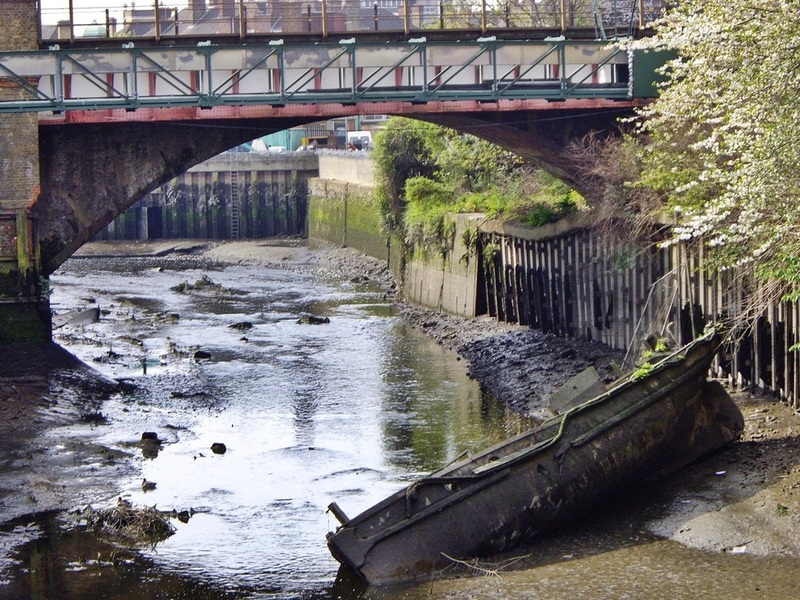 38 people perished in the incident, which was in 1898, one of the worst disasters in the East End in peacetime. 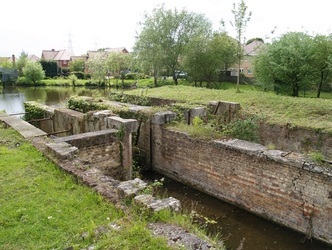 The Royal Humane Society later awarded 26 of its Bronze Medals to those men that had risked their lives by jumping into the river and rescuing many of those that were in danger of drowning. 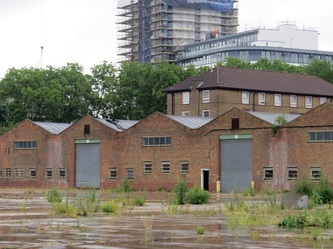 In 1895 Thames Ironworks formed the Thames Ironworks Football Club. 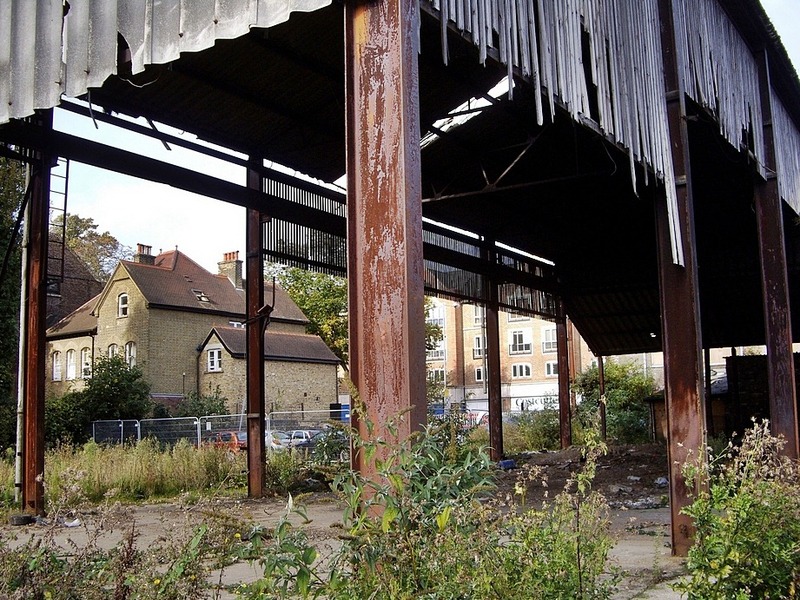 Since 1900, they had been known as West Ham Football Club after a merger with another local side, Old Castle Swifts. 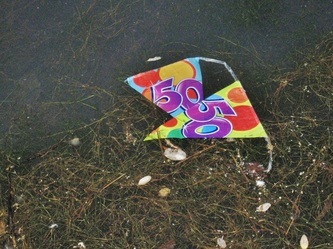 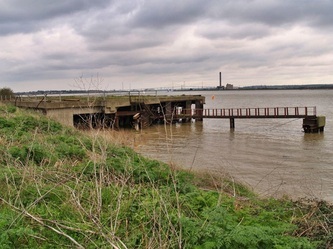 Ricky writes: "As a child, I'm in my 40's now, I remember an island in the river lea at the bottom of Southwold road near where the ice rink is now.The island was called "rat island" locally and was a very real ,standalone island that you could only reach if you were prepared to swim. 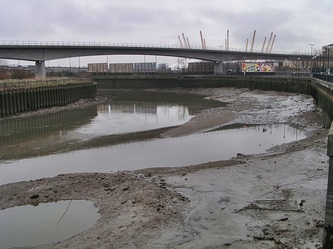 Over the years it has filled in due to natural river deposits and prams and motorbikes, etc and is no longer an island. 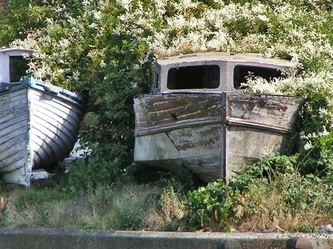 You wouldnt even know that it was once an island. 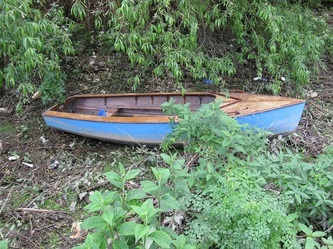 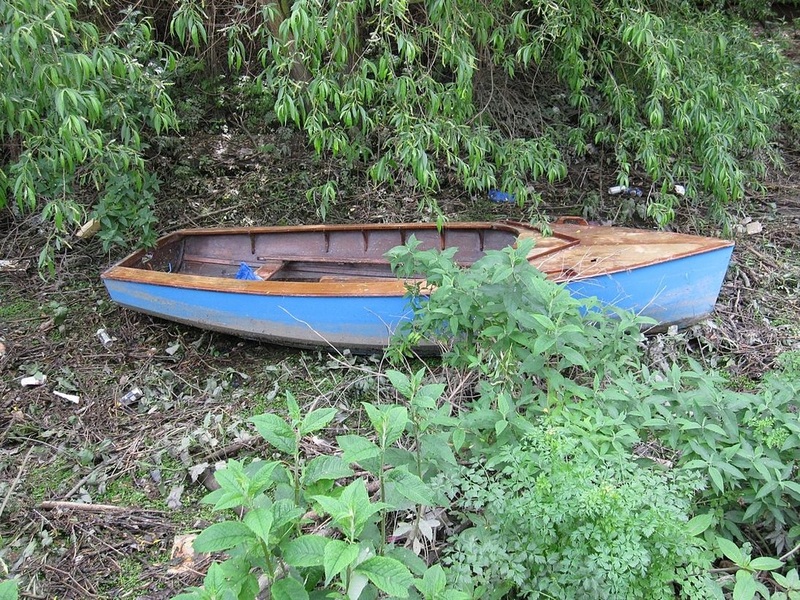 we used to canoe to the island and pull our canoes up onto the bank and skadoo off the bank into the water." 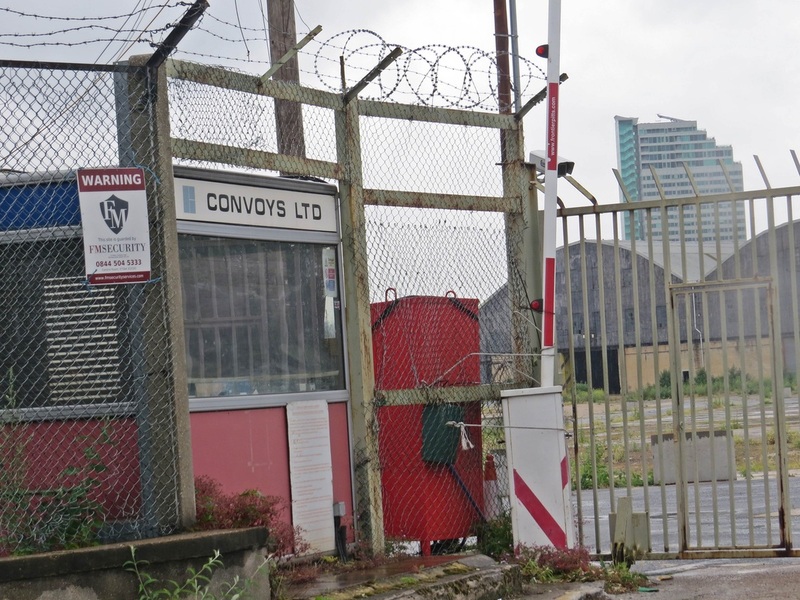 Convoys Wharf, formerly called the King's Yard is the site of Deptford Dockyard, the first of the Royal Dockyards, built on Thames in London. It was first developed in 1513 by Henry VIII to build vessels for the Royal Navy. 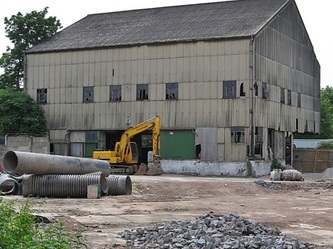 The site was owned from 1994 until 2008 by News International, which used it to import newsprint and other paper products from Finland. 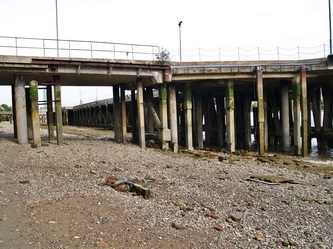 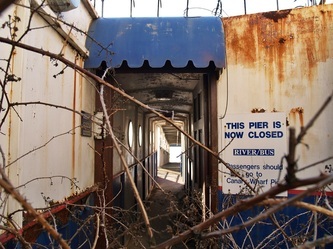 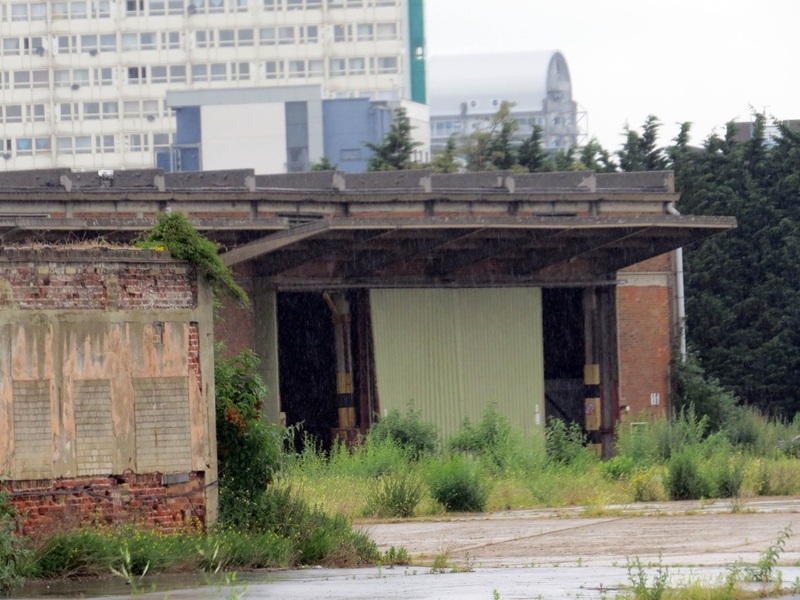 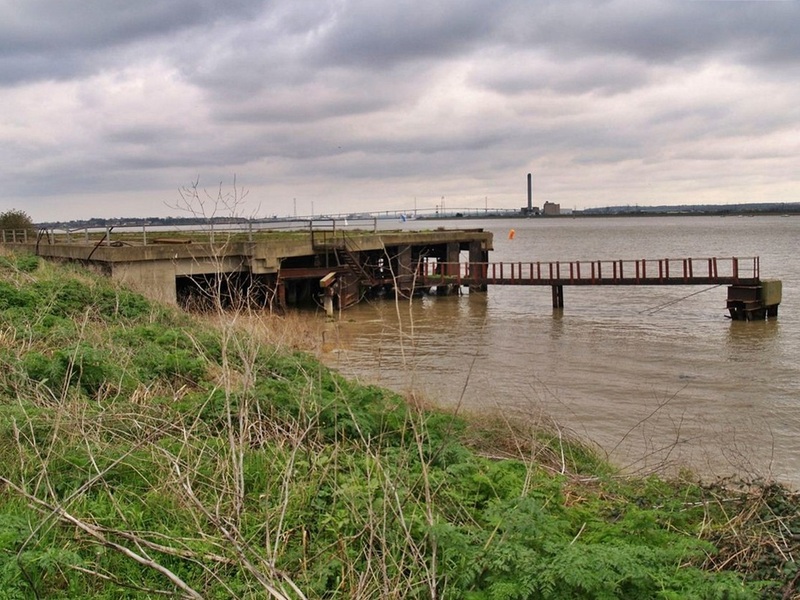 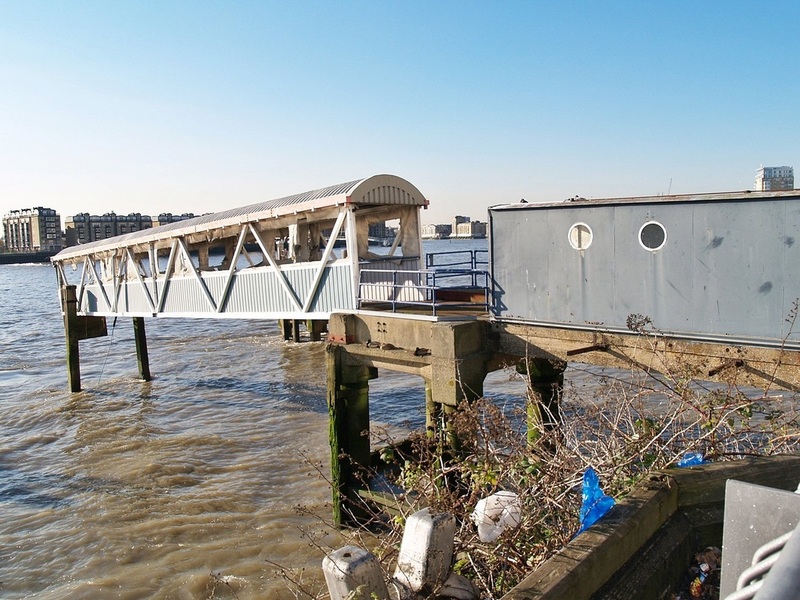 It is now subject to a planning application to convert it into residential units, though this pier has listed status. 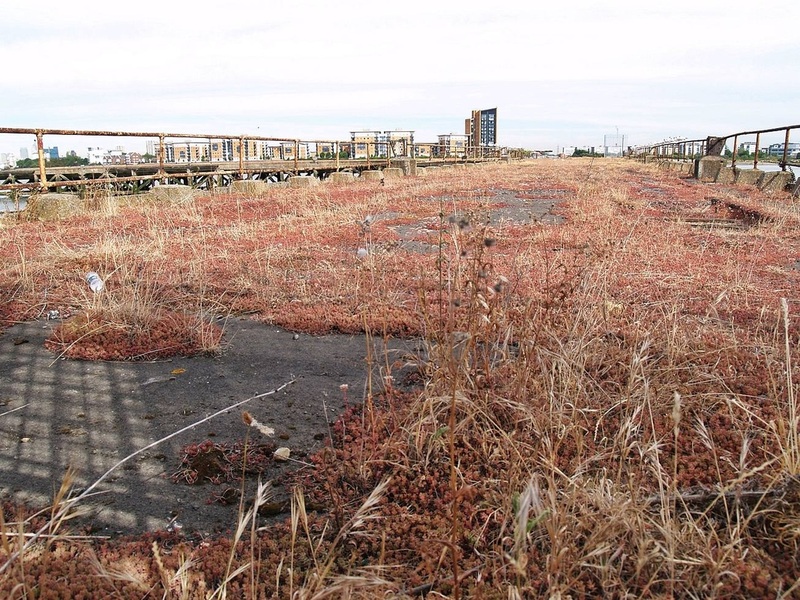 These jetties were used for loading coal in and products out (tar,coke & other chemicals). 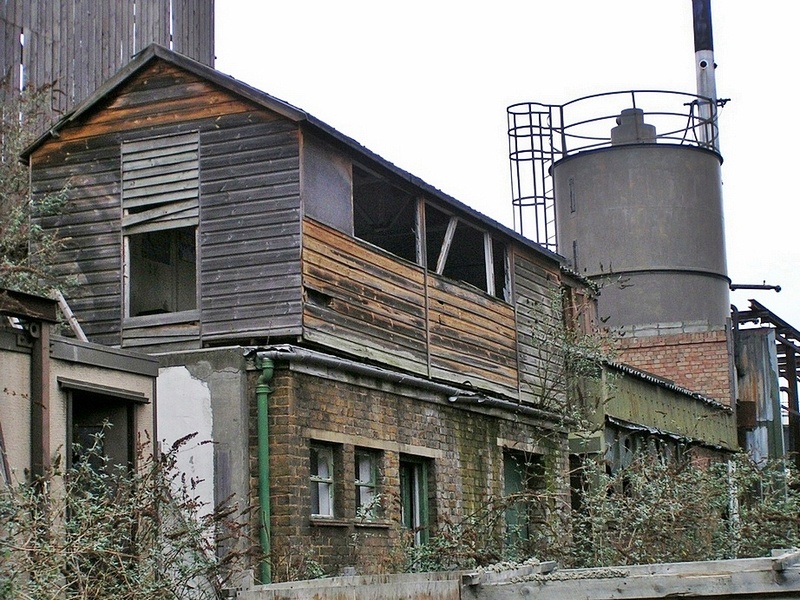 Once Europe's largest gas-works - the plant was opened in 1870 by the Gas Light and Coke Company (GLCC). 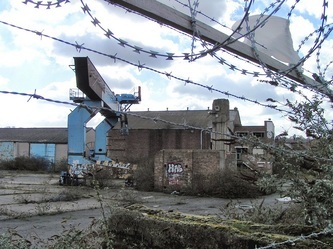 The name Beckton was given to the plant and the surrounding area of east London in honour of the company's governor Simon Adams Beck. 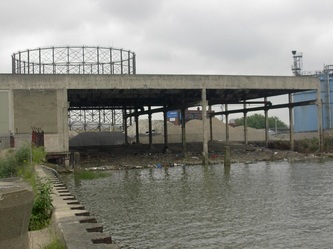 It came eventually to manufacture gas for most of London north of the Thames (its south London counterpart was in Nth Greenwich - now the site of the O2/Dome). 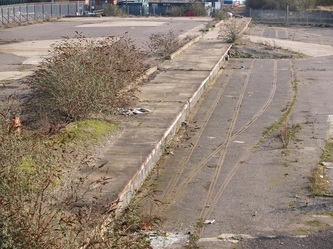 Various chemicals, such as creosote & amonia, as by products of gas production were produced at a purpose-built chemical works, Beckton Products Works from 1879. 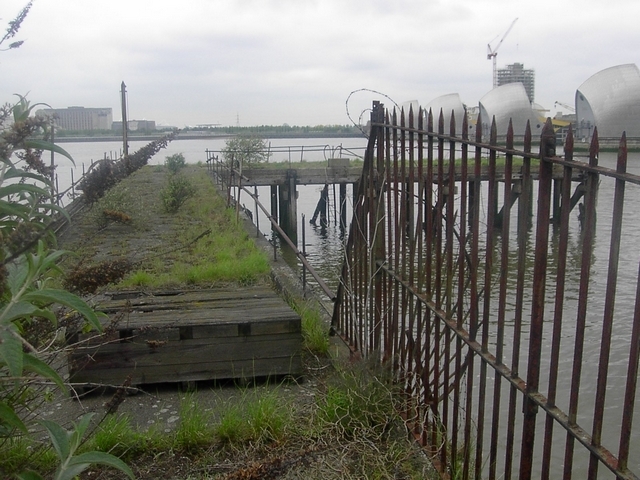 The discovery of natural gas in the North Sea meant that manufactured gas became uncompetitive. 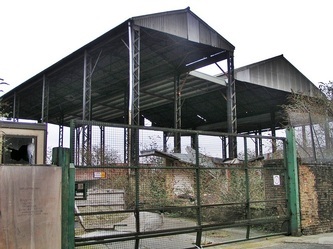 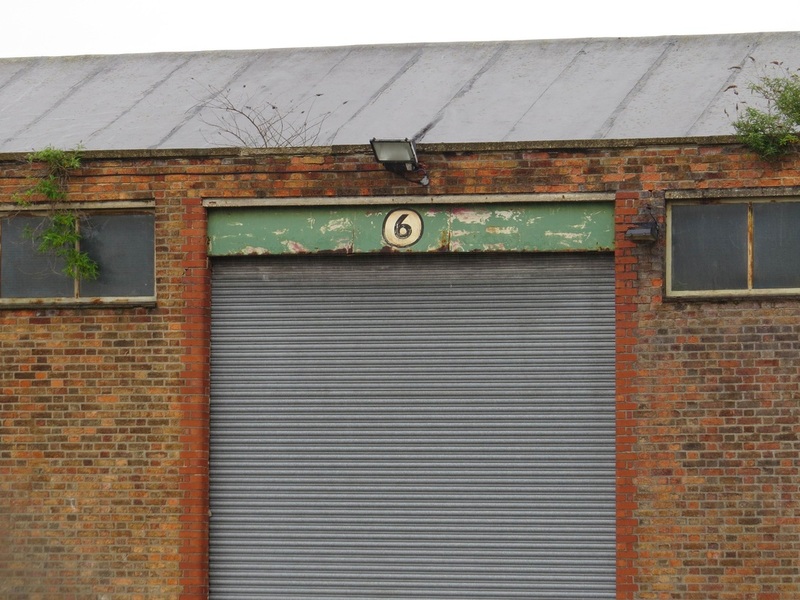 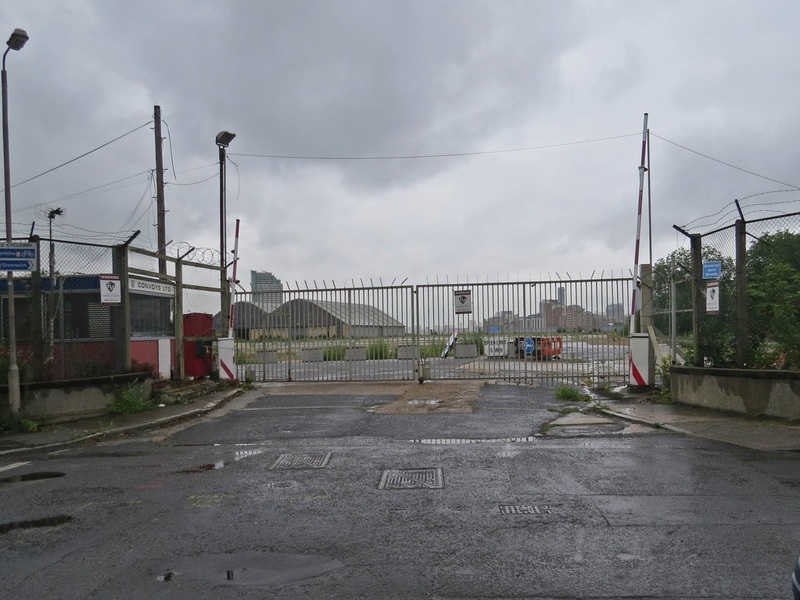 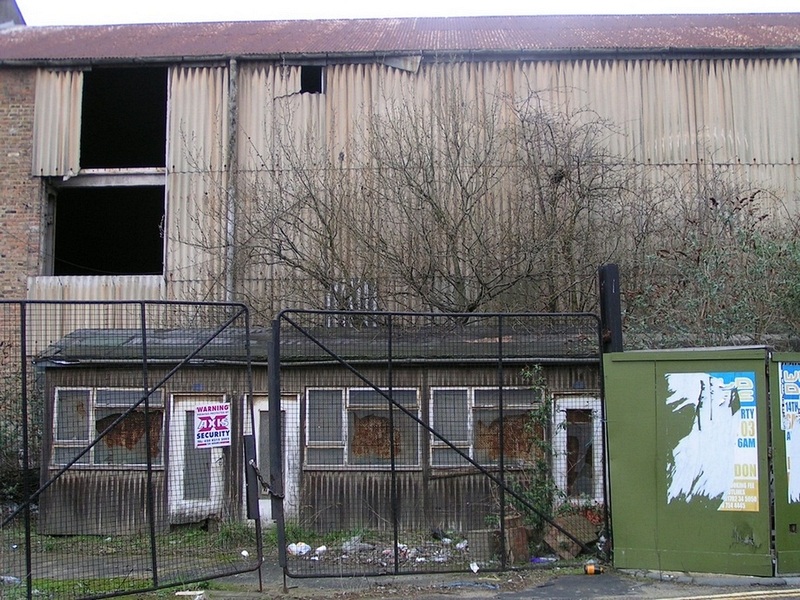 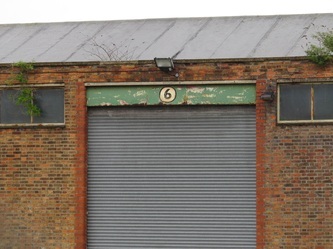 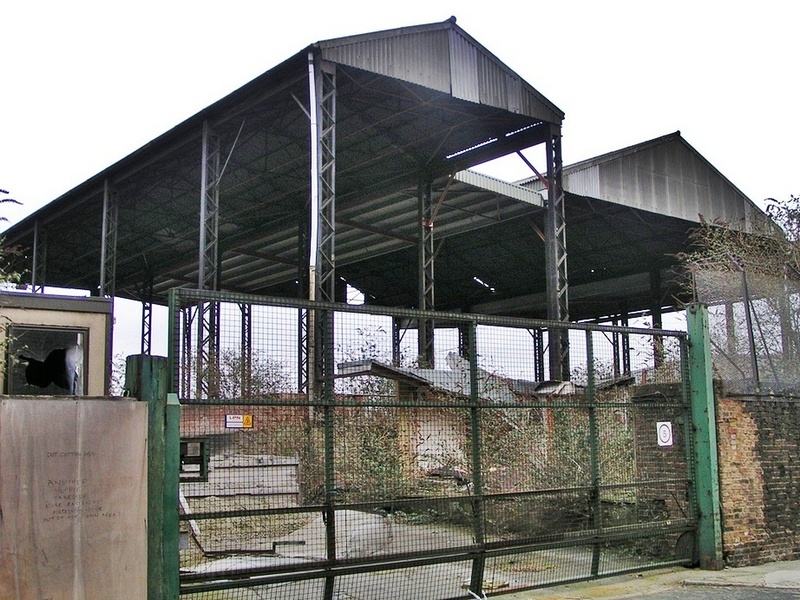 The Beckton works closed between 1969 and 1970. 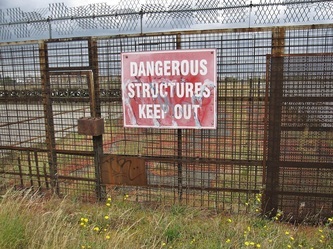 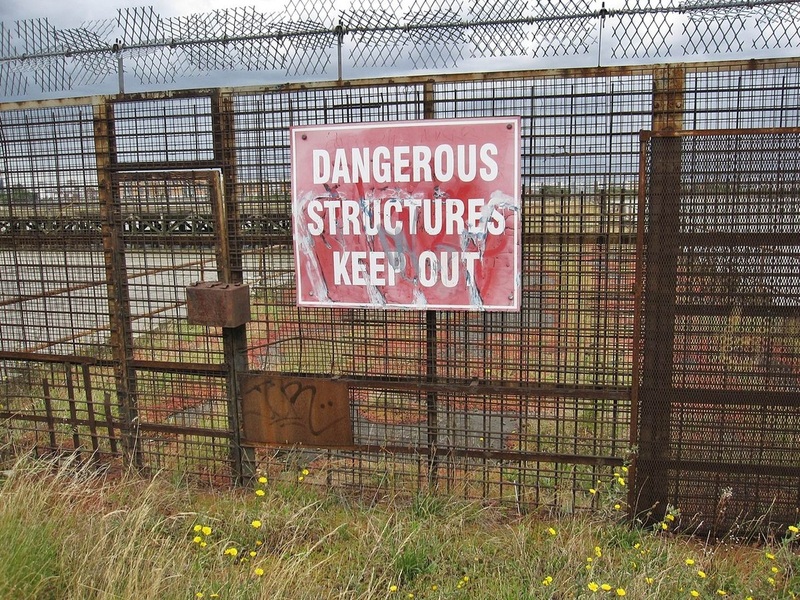 The gasworks site was used for filming an Oasis video, scenes for a James Bond film though one of the most famous scenes to have been filmed here was a sequence out of Full Metal Jacket, director Stanley Kubrick had the gas works transformed to look like the Vietnamese city of Huê where the end scenes of the film takes placeduring which lots of the old gasworks were demolished by explosions. 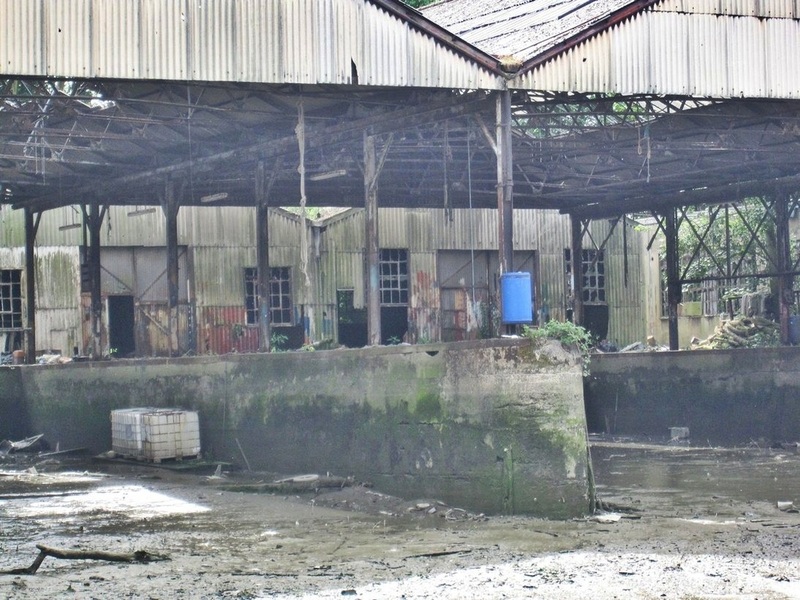 Over the past 150 years this wharf by the River Thames has dealt with coal, lime, metal and gravel, and was used until the 1980s by Shaw Lovell as part of their metal transhipment operation. There is also believed to be an ice house on the site, built for a commercial ice company at the turn of the last century. 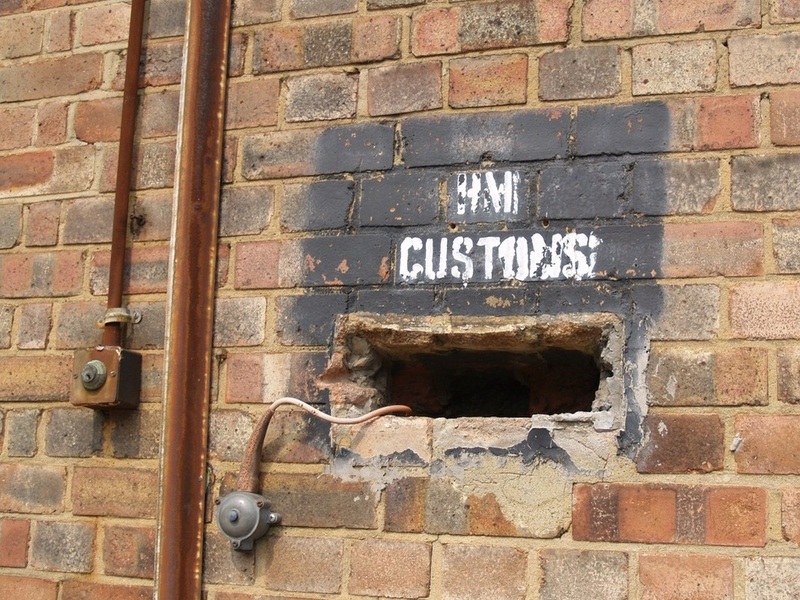 On the side of the main wharf building there is a hole in the wall mysteriously marked ‘HM Customs’, with a bell still attached. 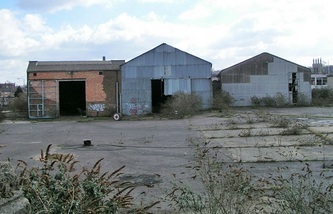 The site is now completely derelict. 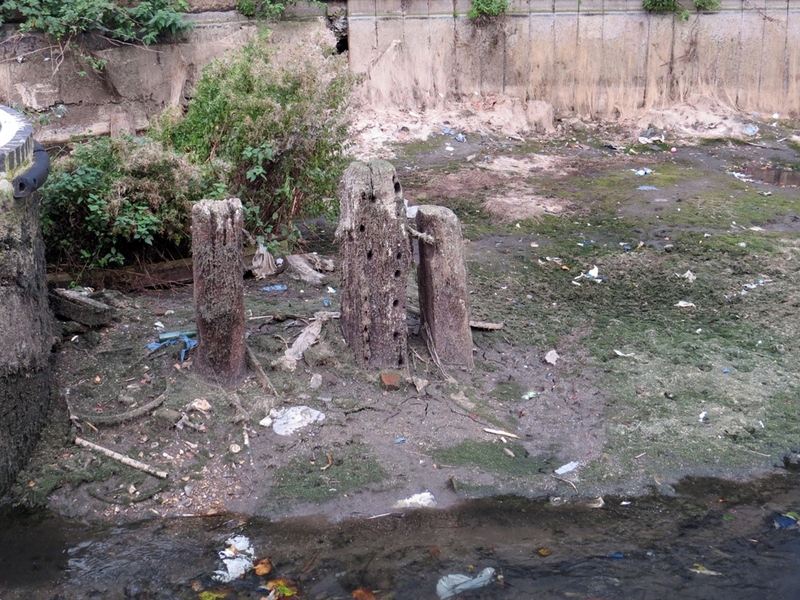 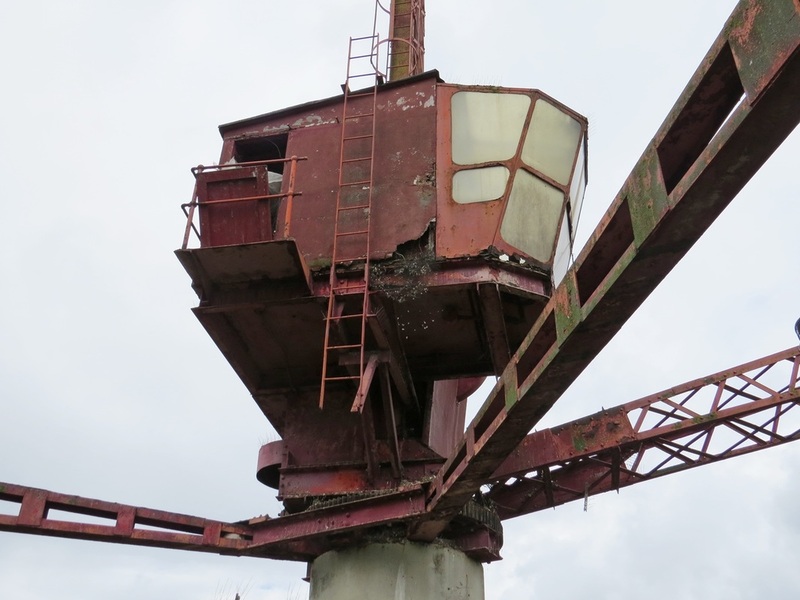 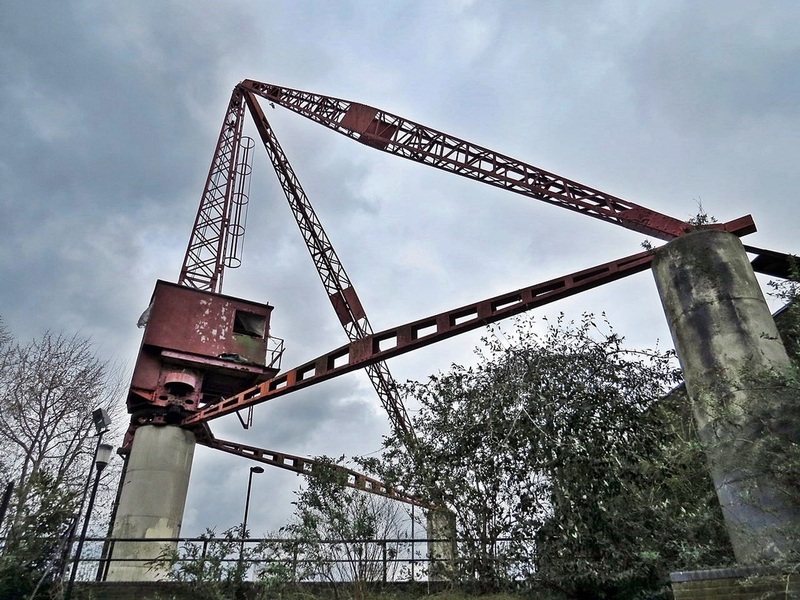 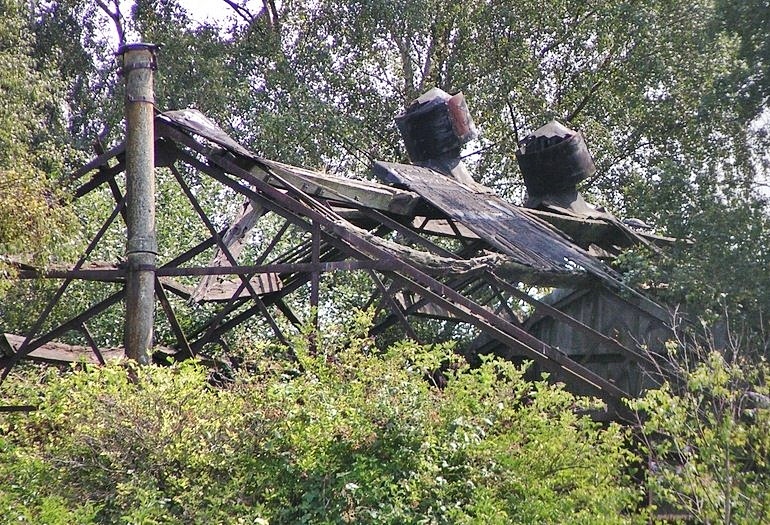 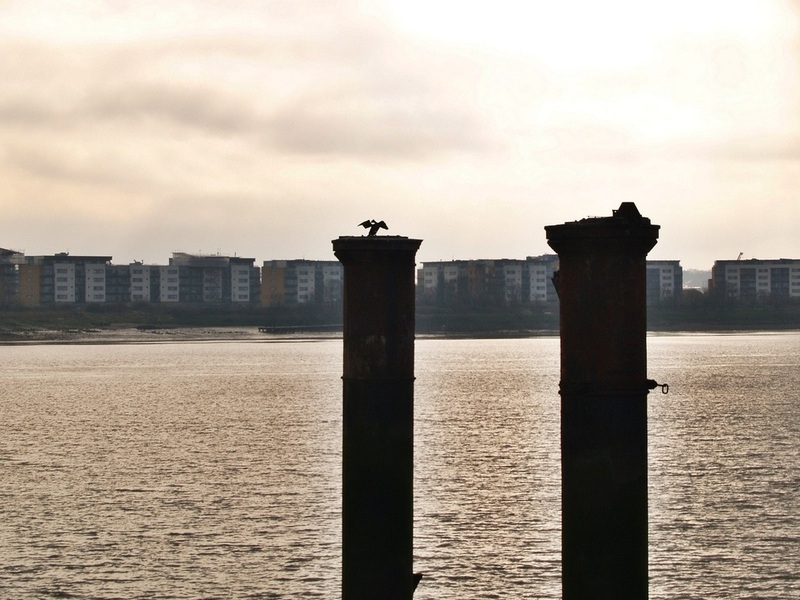 Two large cranes, known as ‘Scotch derricks’ and thought to be the last of their kind on the river, were removed in 2001, much to local dismay. 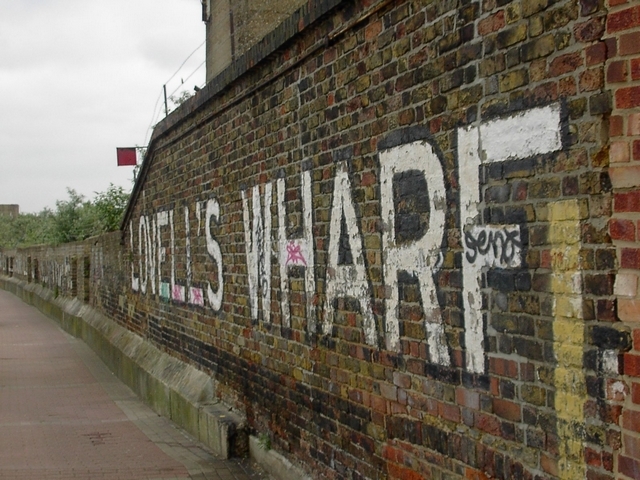 The rest of the wharf is under threat of demolition to make way for new housing, which may include some tall tower blocks. Parts of the 2000 film Gabriel & Me, starring Billy Connolly, were filmed at Lovell’s Wharf. 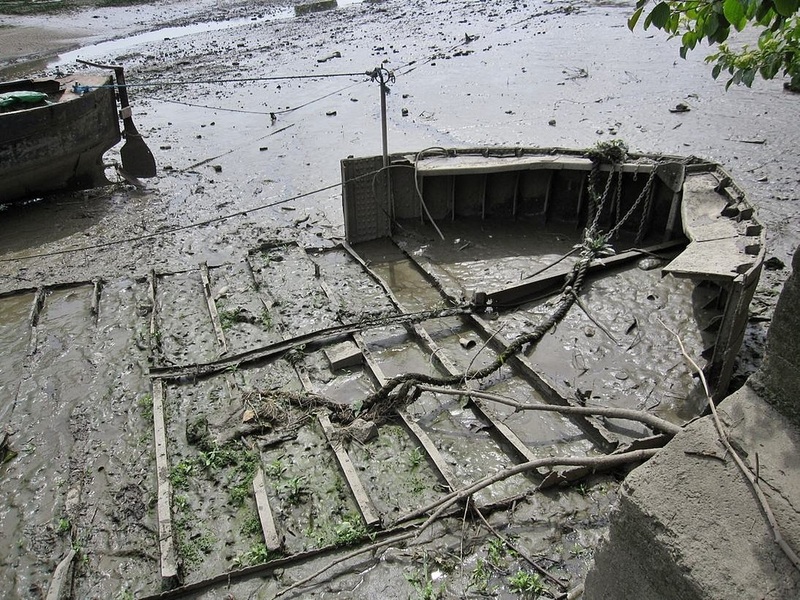 These steps originally gave access to the row boats and ferry man that ferried crew members between the shore and cable ships anchored off-shore in the deeper central channel of the river. They also pass alongside the Bendish Sluice one of four sluices established in the 17th century to draw off water from the natural marshlands that constitute Greenwich Peninsula. 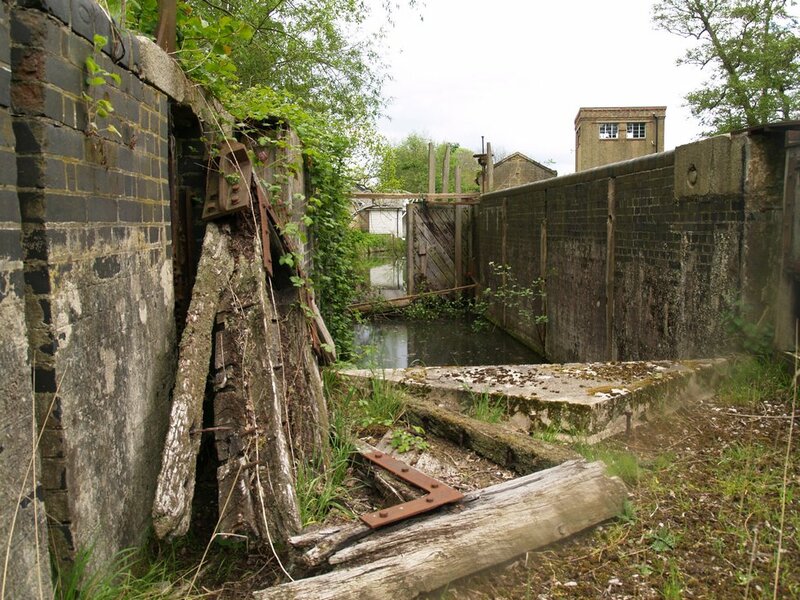 From the mid 1800’s until 1975 telegraph and latterly cable telephone cables have been manufactured at Enderby Warf and were stored in vast tanks at the works which Alcatel now operate. 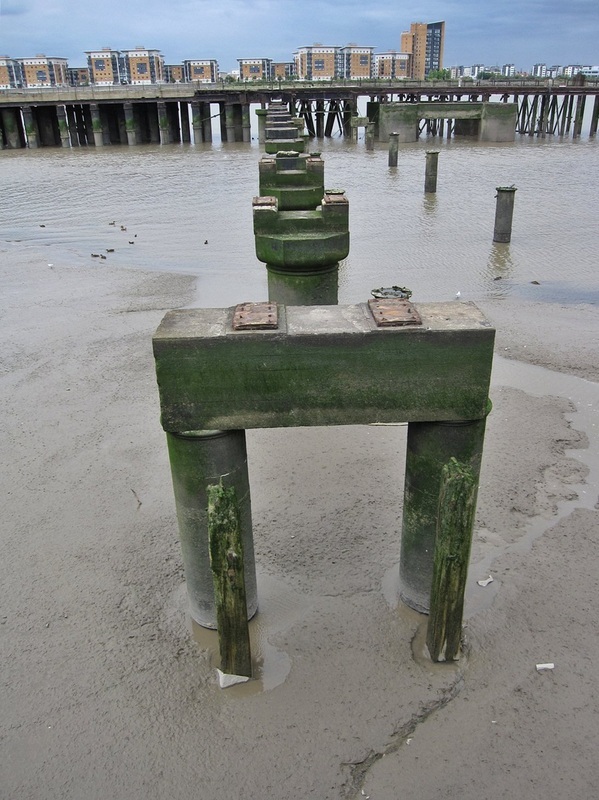 These cables were loaded onto the holds of ships while they lay anchored in the river. 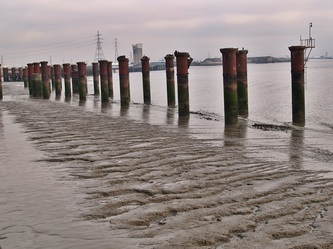 Cables produced at this site were used to establish the first links between England and France; the last cable made on the Greenwich site linked Venezuela and Spain. 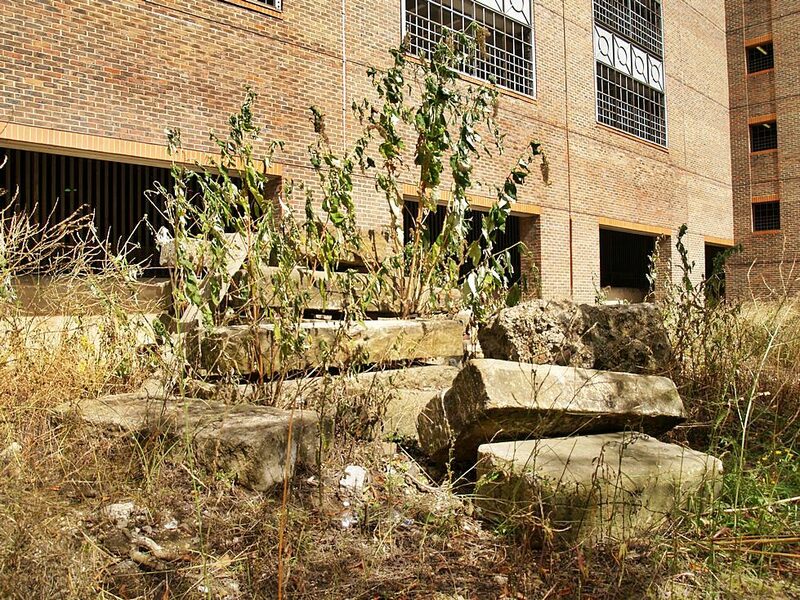 Despite looking pretty negelcted these steps were actually refurbished in 2001 to re-establish access to the river. 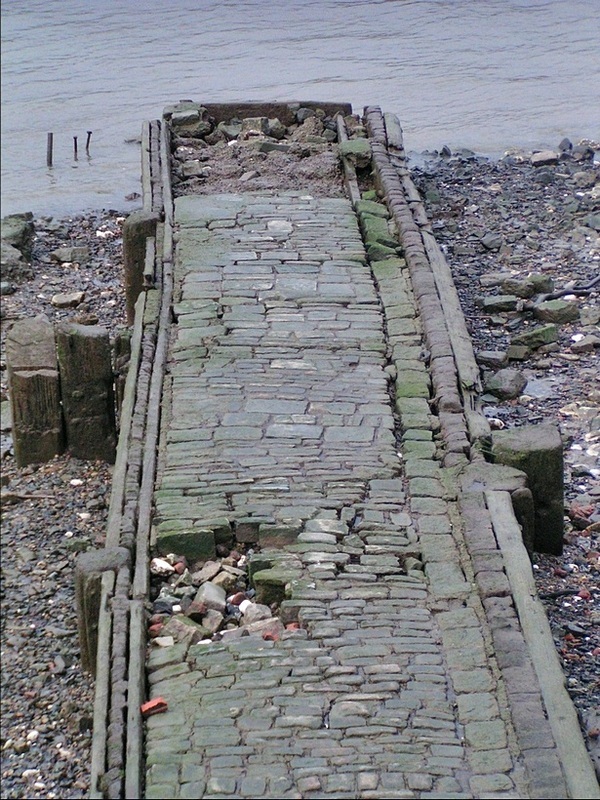 Commemorates the old Barge House and stairs where the King's State barge was housed from Henry VII to Charles I. 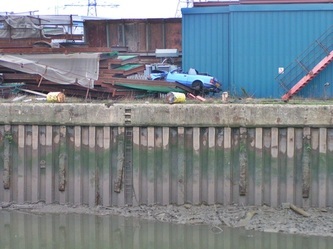 Home of royal barge masters, and the site of the sheds for the royal barges. 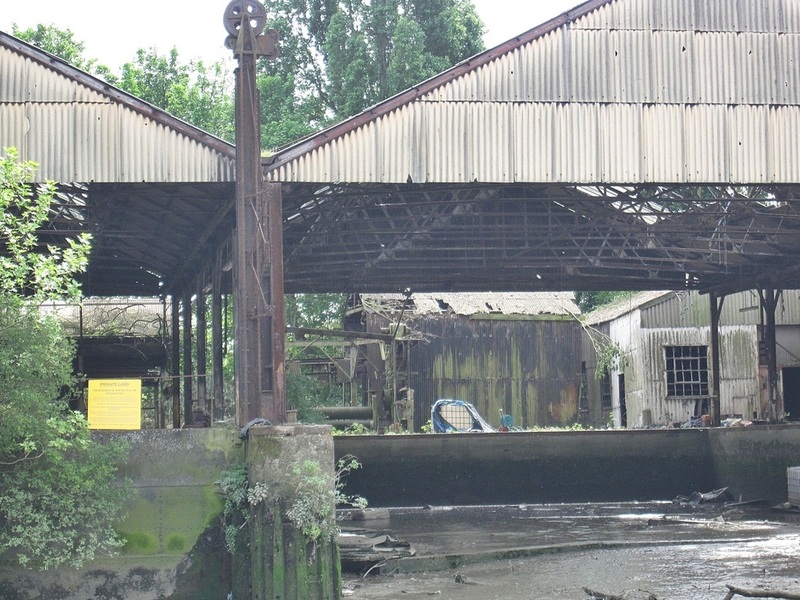 Delta Wharf produced metal products, mainly bronze, on this site from 1905 until around the early 80's. 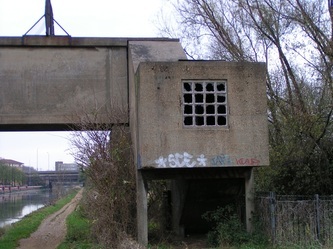 It was later used for aggregates until its fairly recent closure. 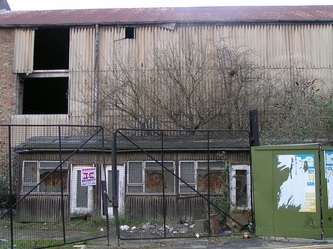 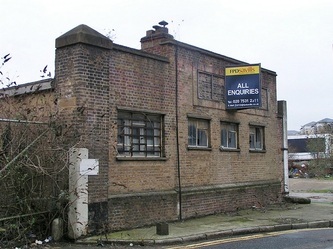 This photograph was taken just before demolition which took place early in 2010. 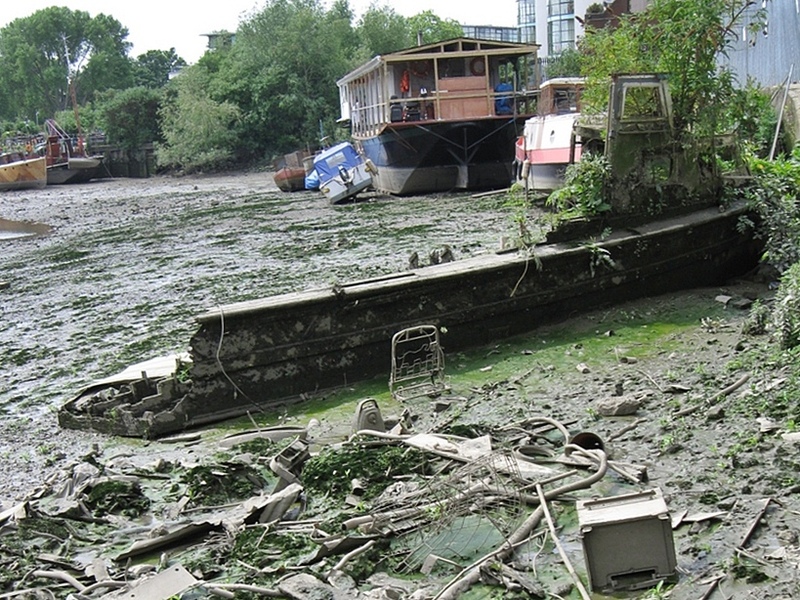 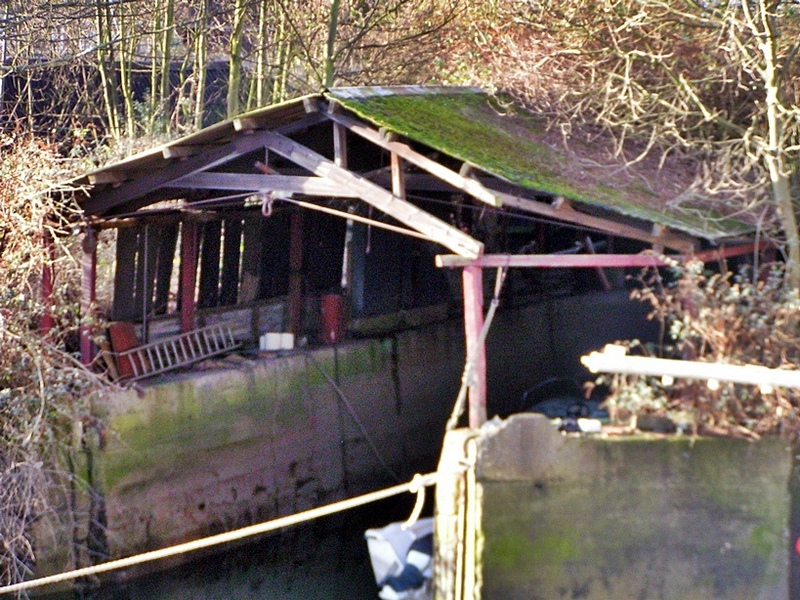 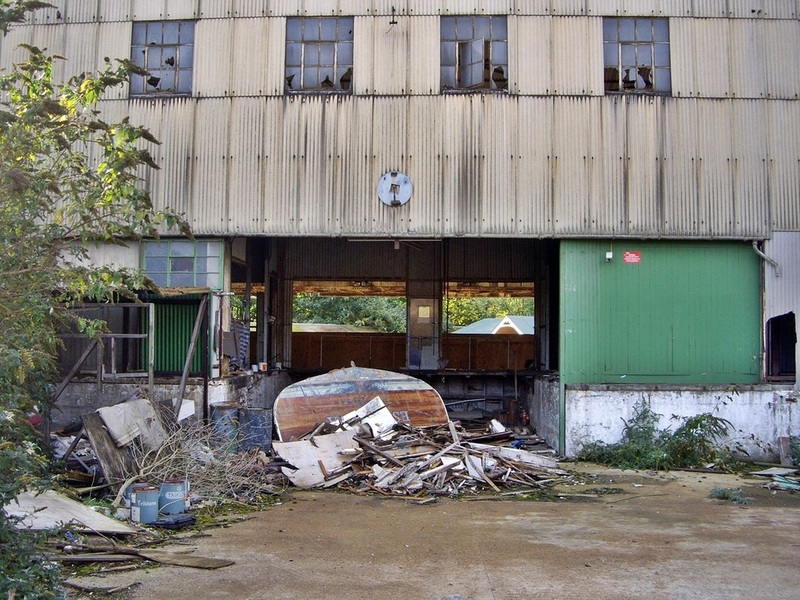 The first few pics above are of Lots Ait, a boatyard on the Thames at Brentford. 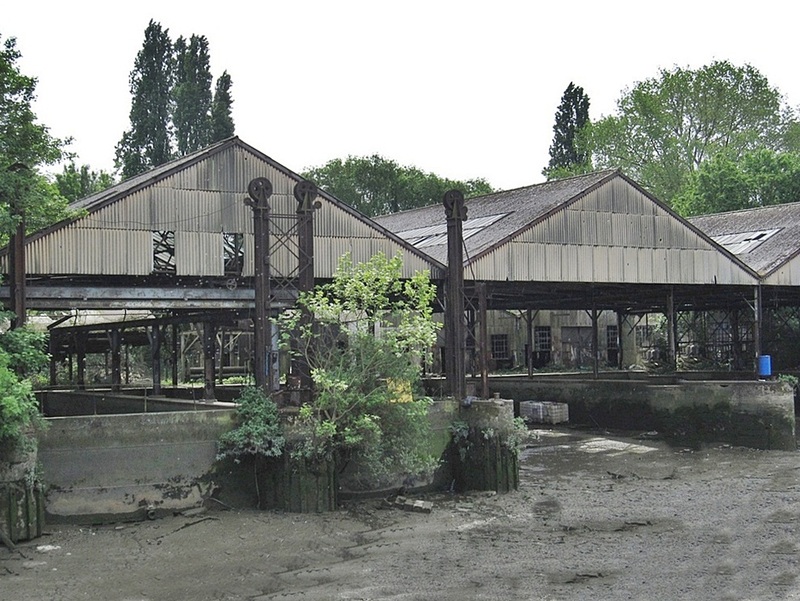 The boatyard was established in the 1920's by the Thames Lighterage Company to provide a base for the building and repair of the steel hulled lighter boats that were used to transport goods between the London Docks and the Grand Junction (later Grand Union) canal and the Great Western Railway. 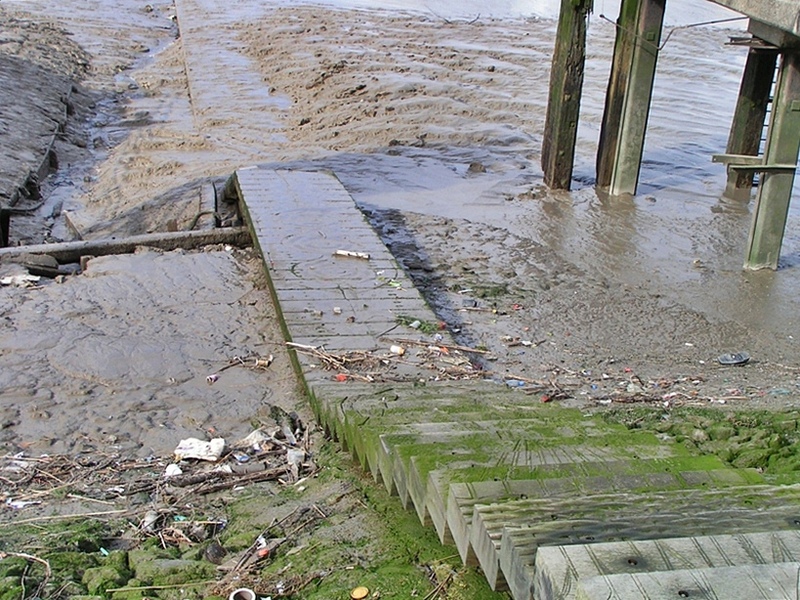 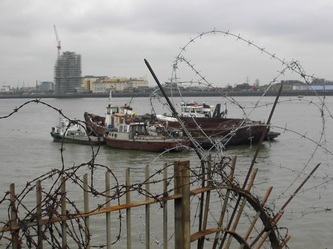 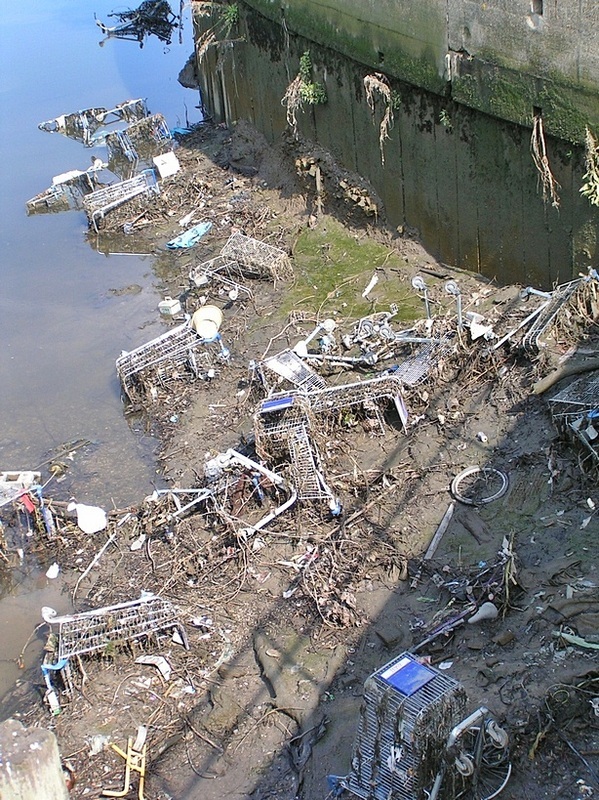 The coming of motorways and shipping containerisation introduced in the 1950s and 60s caused the commercial river going traffic that had dominated the tidal Thames since the early days of the industrial revolution to enter a rapid and terminal decline. 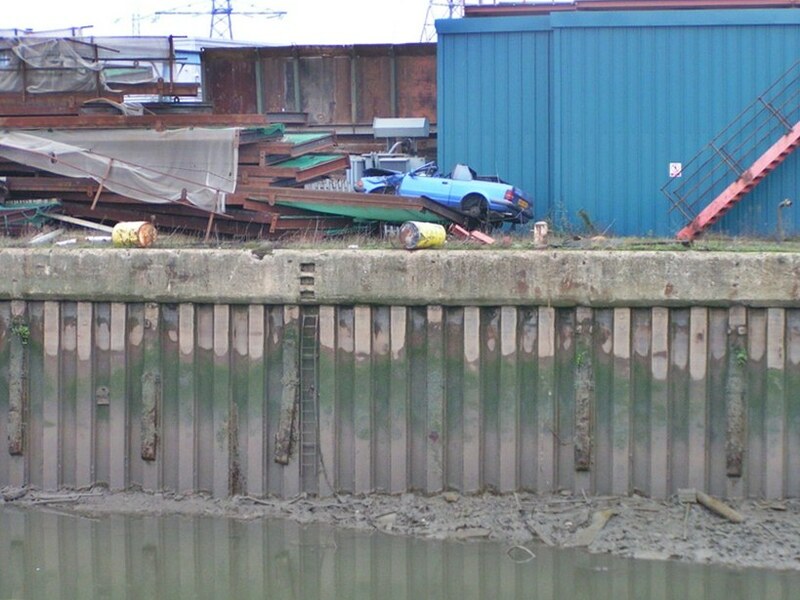 This led to the riverside boat yards shutting one by one. 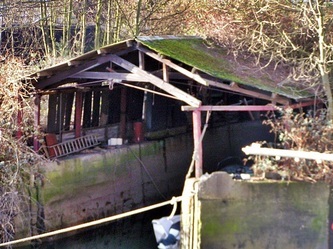 Lots Ait was one of the final boat yards to close in the 1970s and is almost unique in being preserved in its original form. Thanks partly to its island location, Lots Ait avoided re-development and has remained very much as it was left over 30 years ago with weeds and undergrowth hiding the vintage boat sheds and machinery that were formerly a hive of activity. 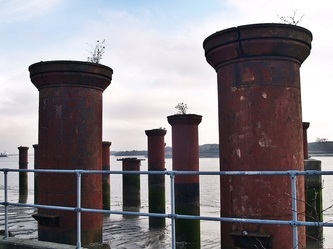 The above information is from the lotsait.com website which tells us that the boatyard has been sympathetically restored to its former glory and the remaining tidal docks will be made available as leisure moorings. The Bow Back Rivers are the waterways which feed into the River Lee Navigation and the Thames in East London. 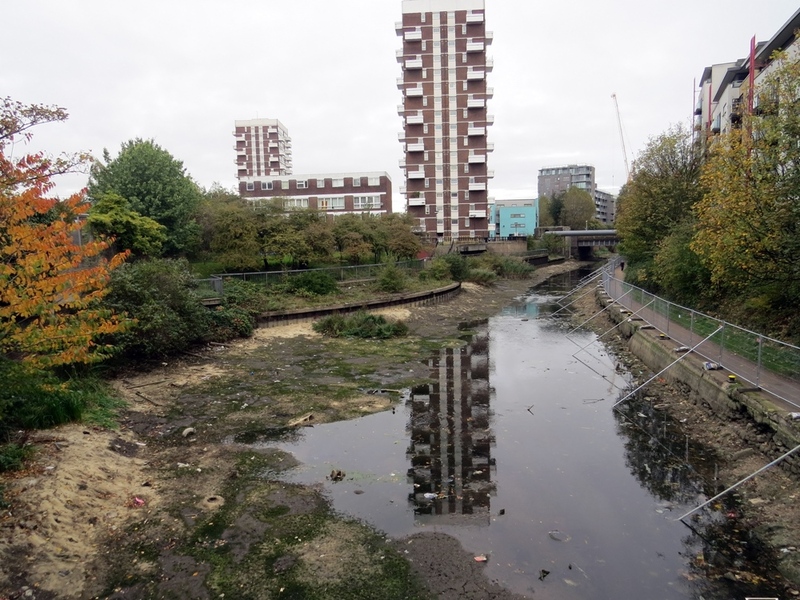 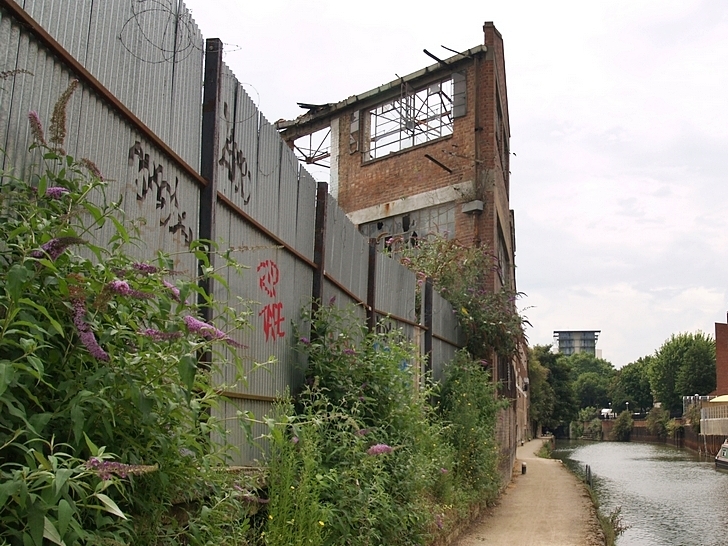 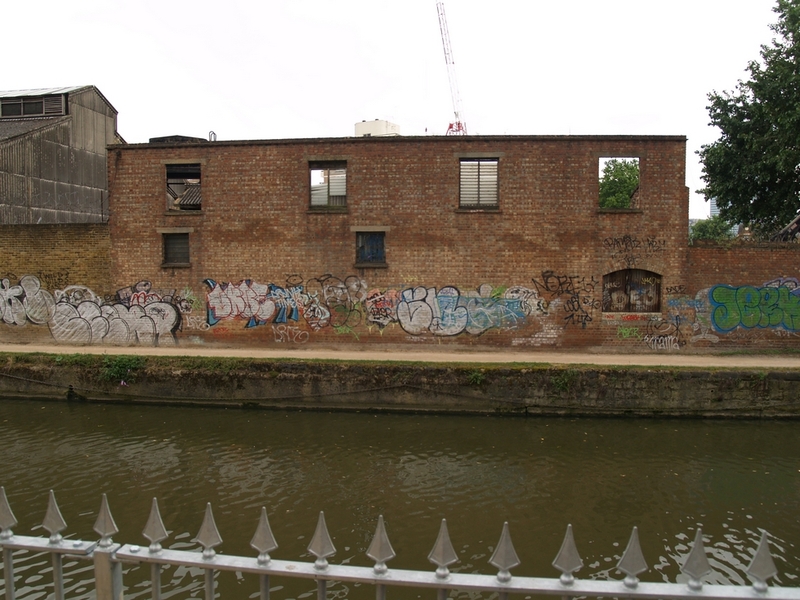 They cover an area the equivalent size of the City of London in the triangle between Stratford, Bromley-By-Bow and Hackney Wick and include: City Mill River, Old River Lea, Prescott Channel, Bow Creek, Abbey Creek, Pudding Mill River and Waterworks River. The River Thames used to be alot wider than it is now and the land that is now Embankment Tube Station was actually the river in early Victorian times. 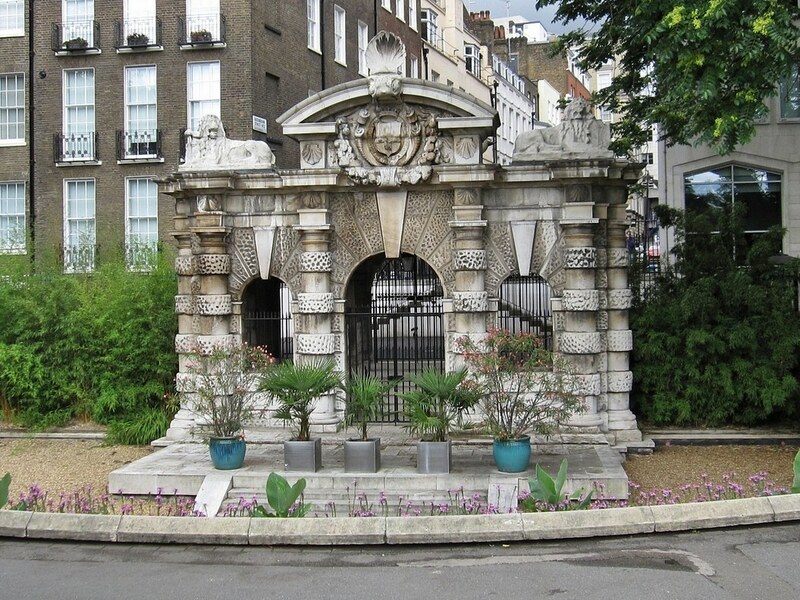 The Victoria Embankment Gardens are a series of gardens on the North side of the Thames between Blackfriars Bridge and Westminster Bridge In 1874 gardens were created on the reclaimed land on the inward side of the roadway named Victoria Embankment after Sir Joseph Bazalgette built the northern intercept sewer and this northern embankment of the river. 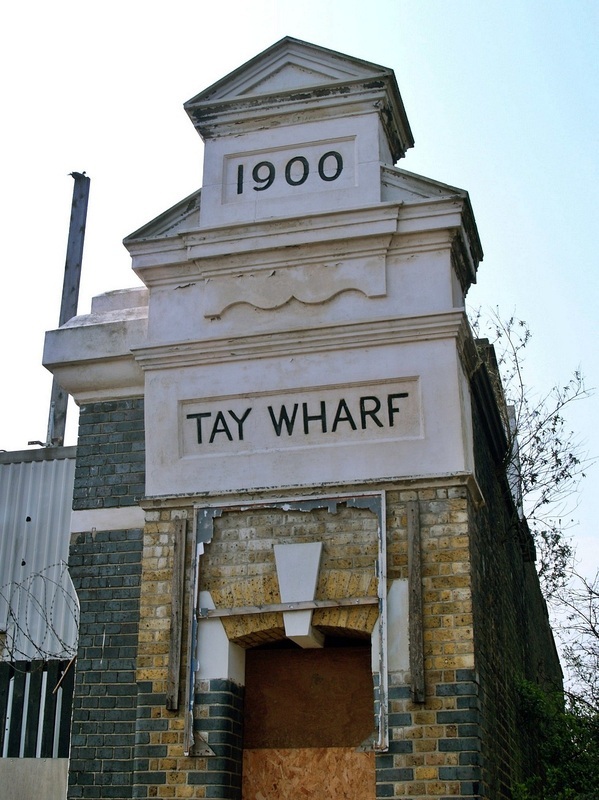 The Keiller & Sons jam factory occupied Tay Wharf from 1880 until 1997. 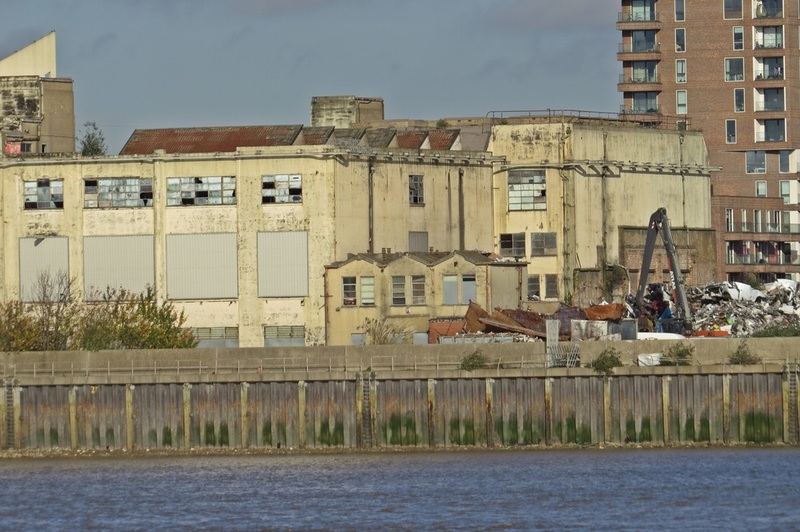 Fruit arrived at the factory by ship, while sugar was supplied by the Tate & Lyle refinery almost next door. 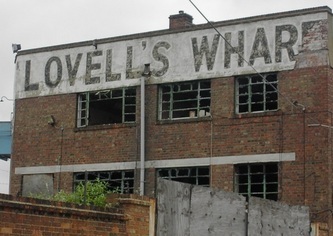 The firm was taken over in 1920 by Crosse and Blackwell and is now a subsidiary of Nestlé. 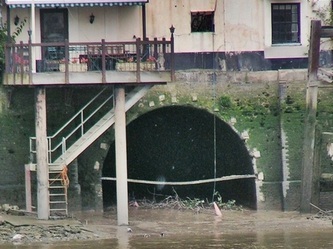 The entrance, which dates from 1900, is a rather strange, tunnel-like affair. 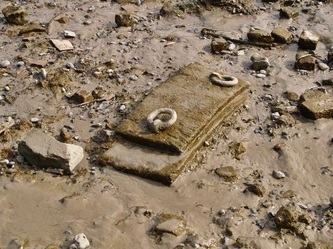 It may be that it was designed in this way so that dockers could be inspected as they left – just in case they were carrying something that did not belong to them. 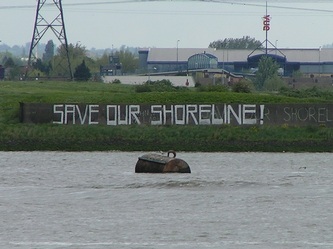 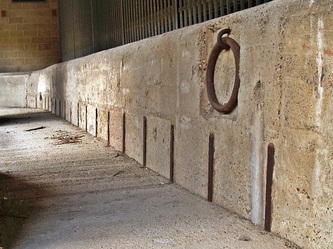 The adjacent wall still shows hand painted wording indicating "Picket Line probably left over from the 1970's strikes. 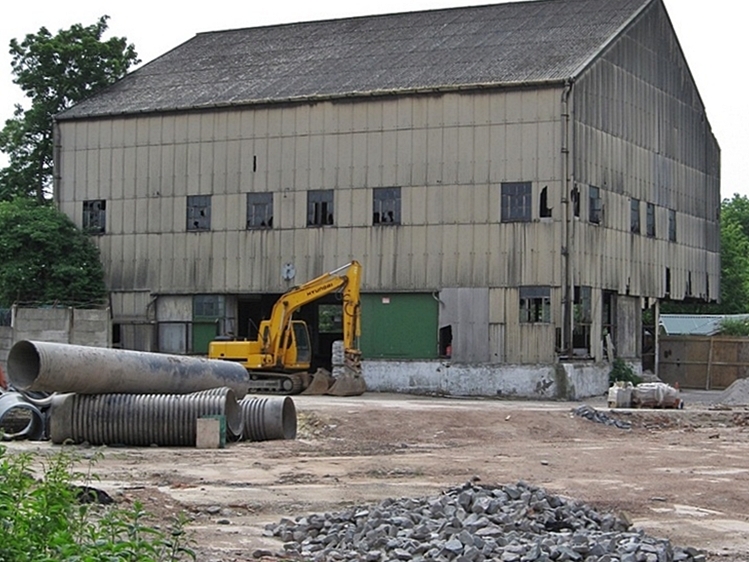 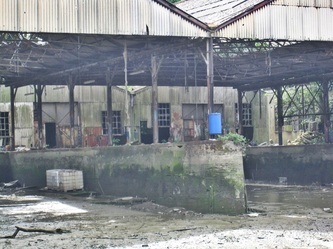 Tay Wharf is now used by scrap iron and steel exporters. 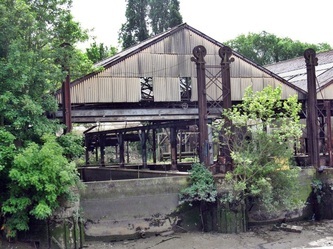 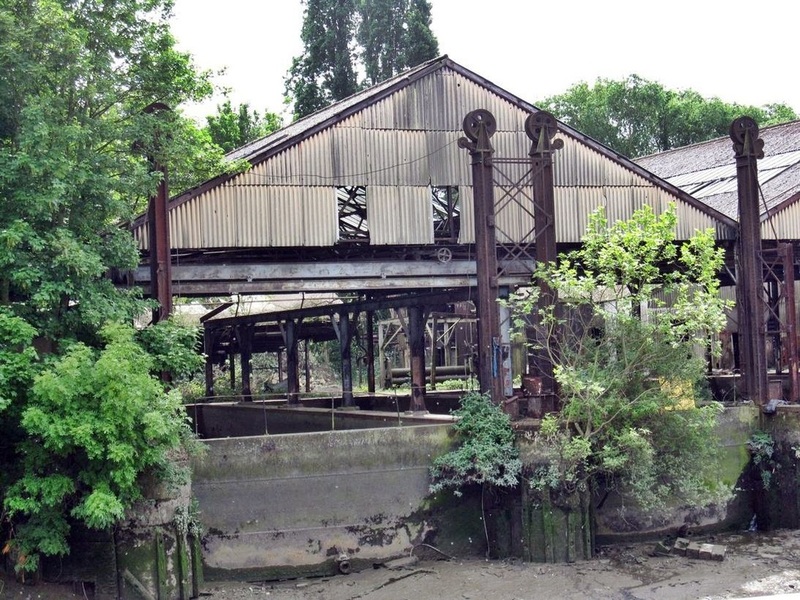 Paynes Wharf was built in 1860 as a boiler workshop for John Penn & Sons until 1913 . Penn's supplied boilers for ships the most notable was HMS Warrior, the first iron warship, now preserved in Portsmouth Historic Dockyard. 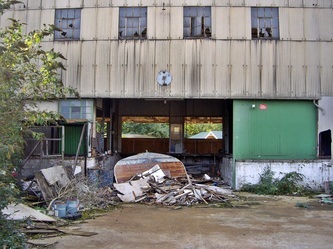 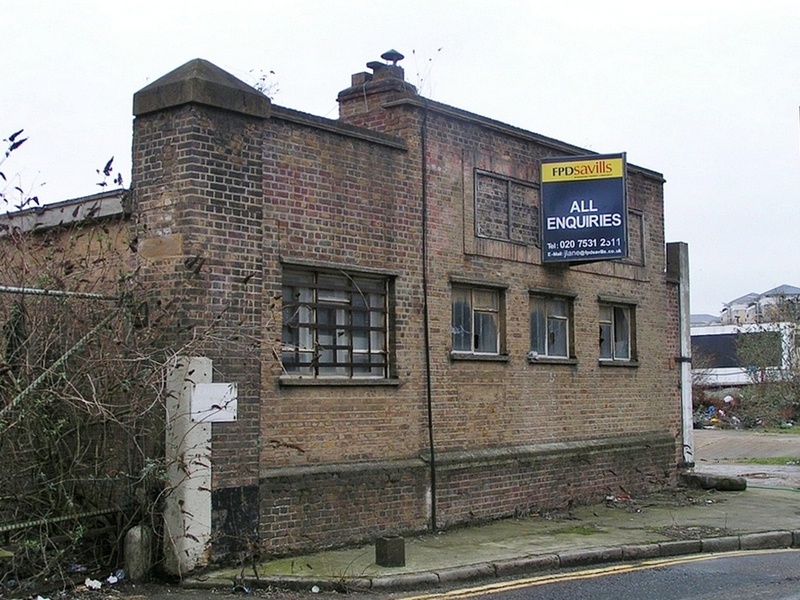 In the 1980s the premises were used by London Egg Products. 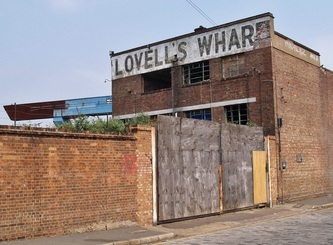 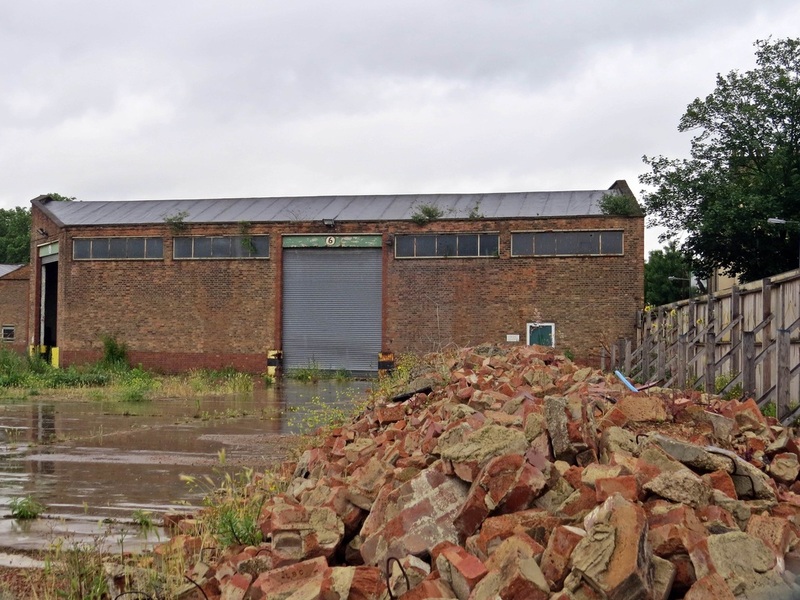 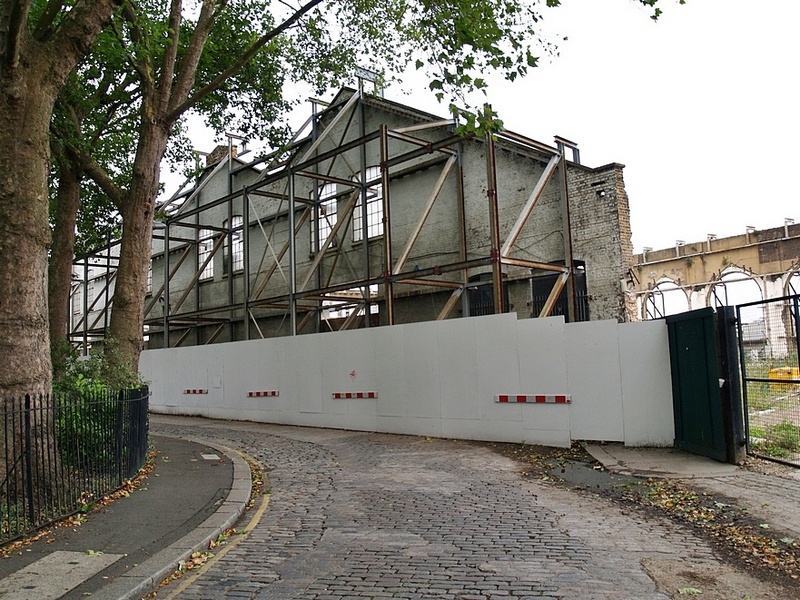 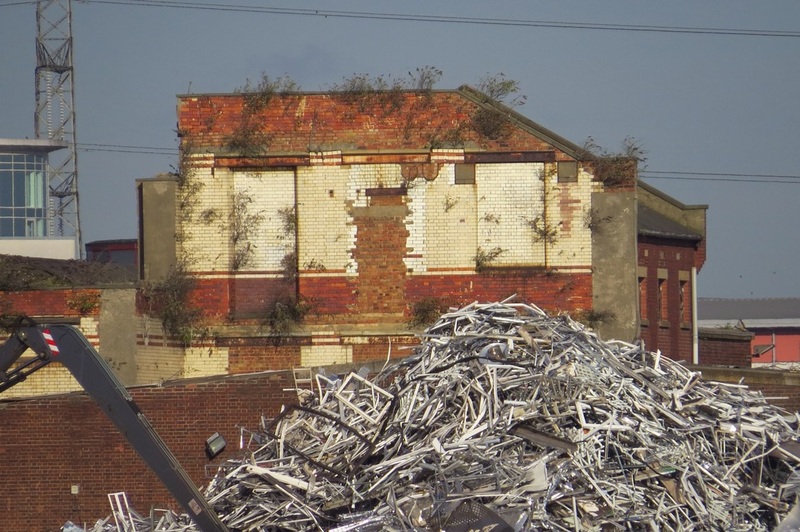 The adjoining Borthwick Wharf, which was built as a cold store by Sir Edwin Cooper in 1934, has been demolished for apartments. 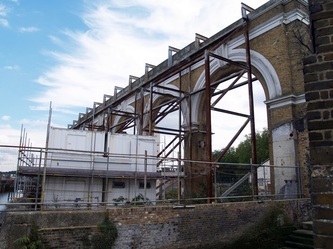 The Grade II listed façade of Paynes, with its Italianate arches, is the only part of the original building left and will form part of a planned arts centre, with two floors of 12 penthouse apartments above it. 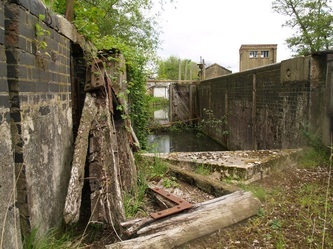 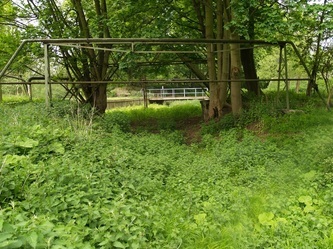 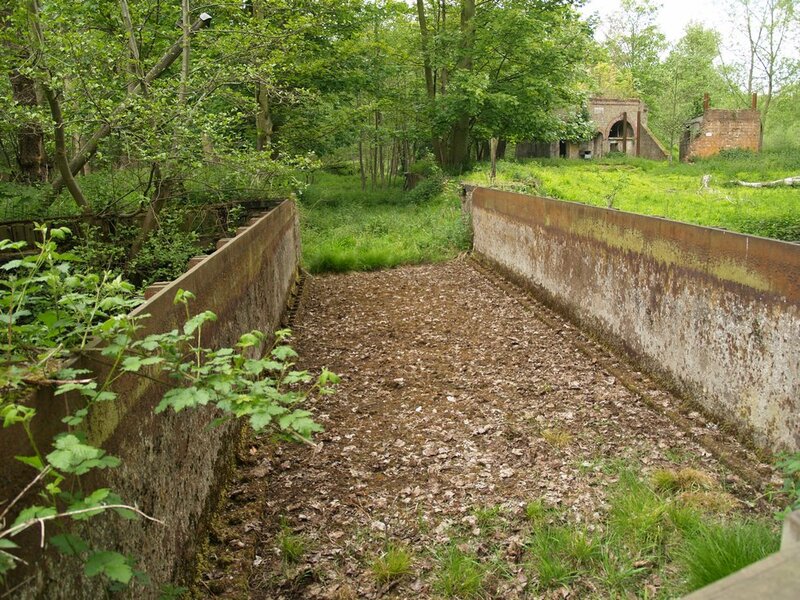 The Royal Gunpowder Mills, Waltham Abbey was one of three Royal Gunpowder Mills in the UK and Ireland but is the only site to have survived virtually intact. 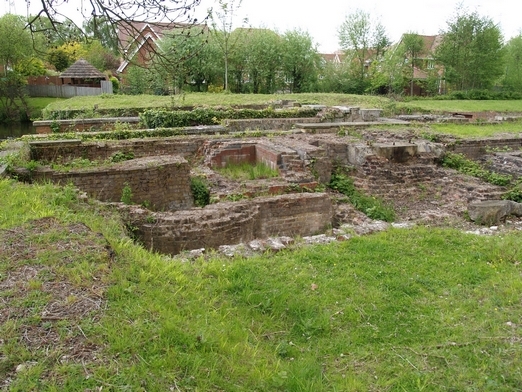 Gunpowder was produced in the Waltham Abbey area from at least the 17th Century. In 1787 the Crown took over ownership of the site and soon obtained a reputation for developing some of the finest gunpowder in the world. 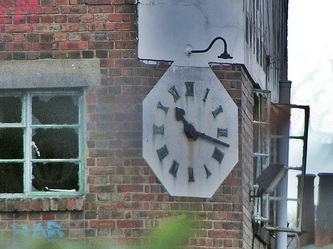 The Crown remained the owners for over next 200 years, until 1991 when the site was closed for operations and sold. 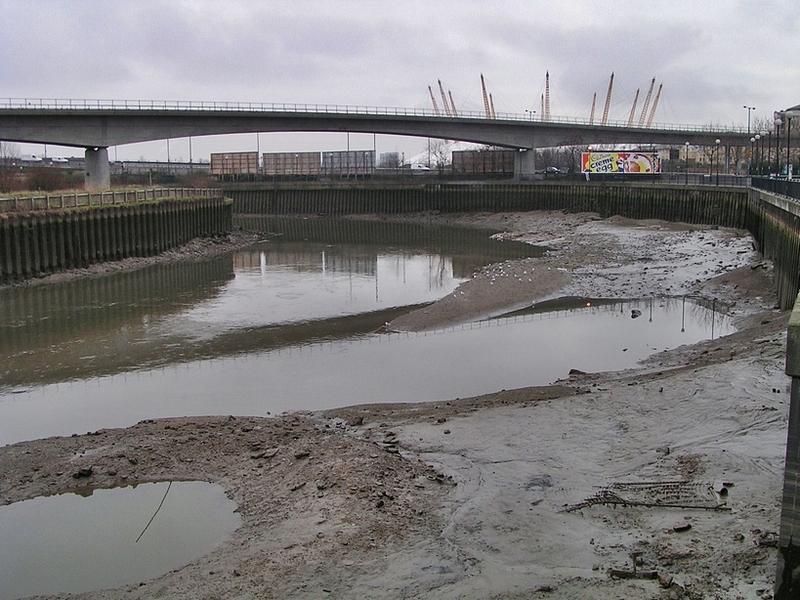 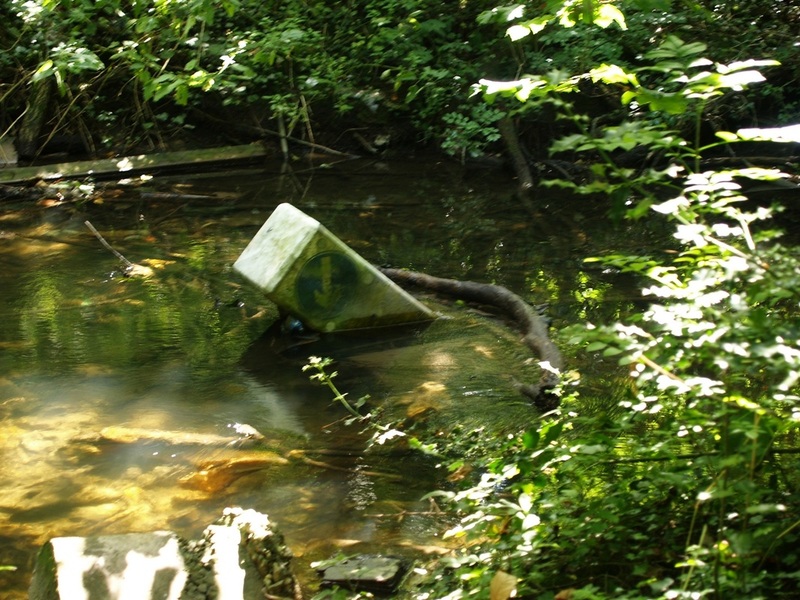 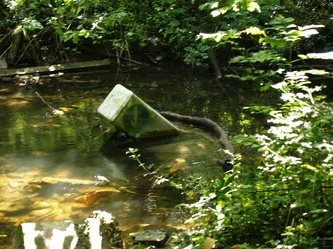 The area was cut off from its surroundings by river boundaries and the highly secret nature of its work. 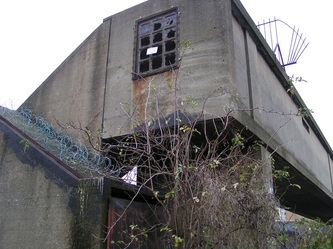 The sites primary use was for military, with the gunpowder used to fire in guns or for demolition. 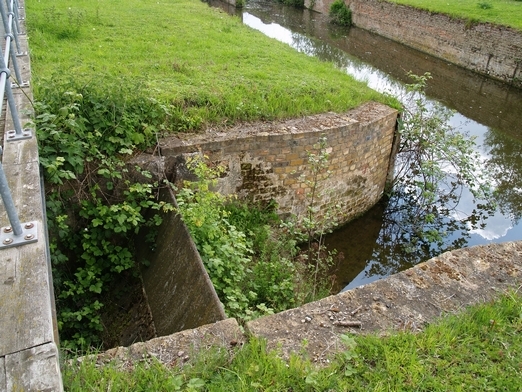 The gunpowder also had its uses outside of the military, where it would be sold for use in engineering, construction, quarrying and mining. 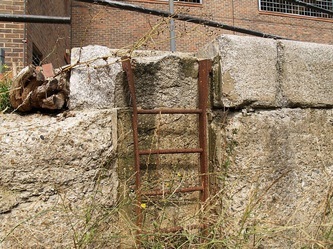 The demand for gunpowder in the 1900s was huge, expanding the staff numbers initially to 3000 staff and then during the years of WW1swelling to 6230. As the war was surging most of the employees at the mill were female, most recruited from the local area of Waltham Abbey. 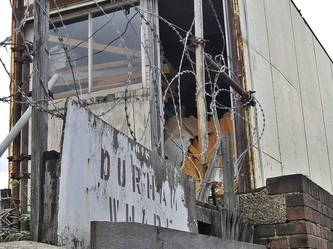 In 1945, the mill was re-opened, but this time as a research centre where military propellant, explosives and rocket propellants could be developed and tested. The testing was possible due to the expanse of the site, and the canals that had previously been used to move the gunpowder to the River Lea. 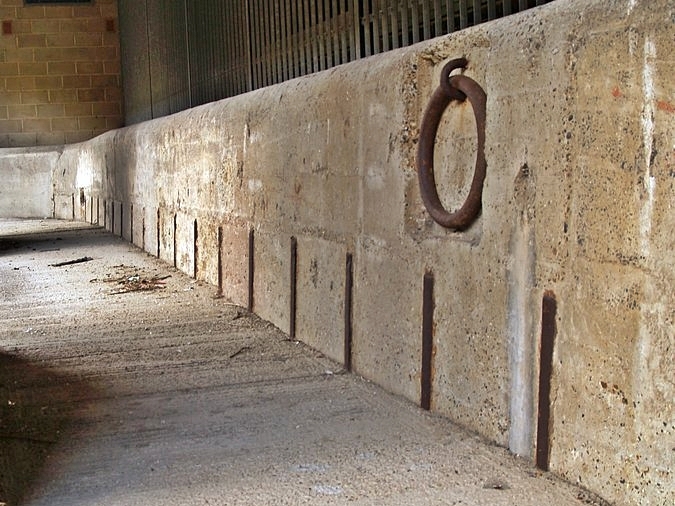 Concrete testing booths were also erected on the site, along with a series of outbuildings to enable testing to be carried out in a safe area within the grounds, but far enough away from the mass of the main buildings. 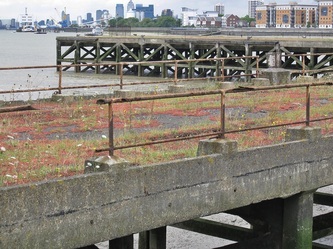 This Thames-side plot of land was purchased by the East India Dock Company in 1803 , in connection with the building of the East India Docks, and it remained part of the docks estate until the Great Eastern Railway Company bought the freehold in 1886. 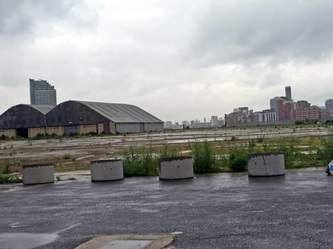 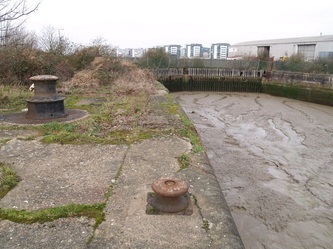 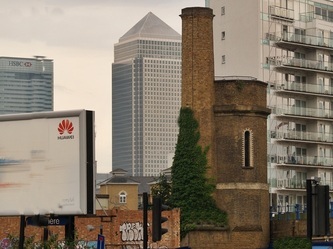 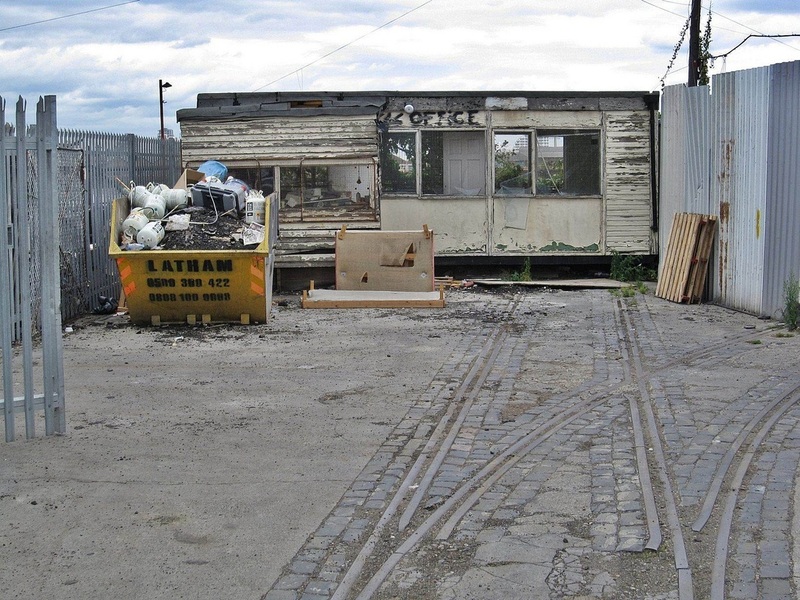 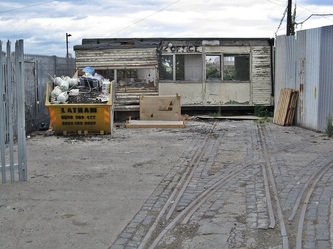 Railway ownership ceased in 1947.Before its purchase by the East India Dock Company, the site of Orchard Wharf had been part of a copperas works (involving chemicals used in dyeing cloth, tanning and the making of black ink) and the copperas house itself stood on this spot. 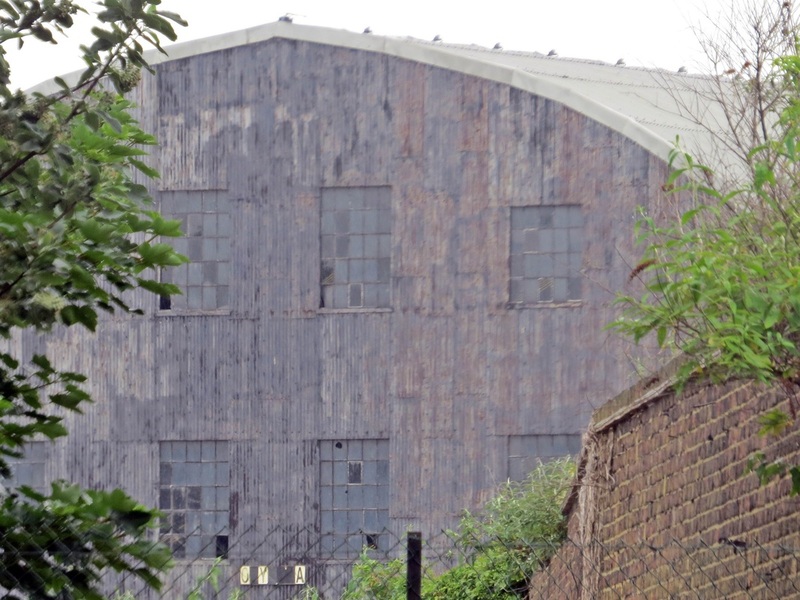 During the construction of the East India Docks the old house was occupied by the dock company's engineer and subsequently was used by the company as a residence for dockmasters and other officials. 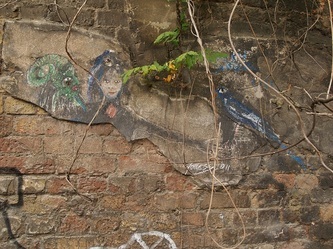 There was an extensive garden which survived until the property was let to a barge-builder in the 1870s. 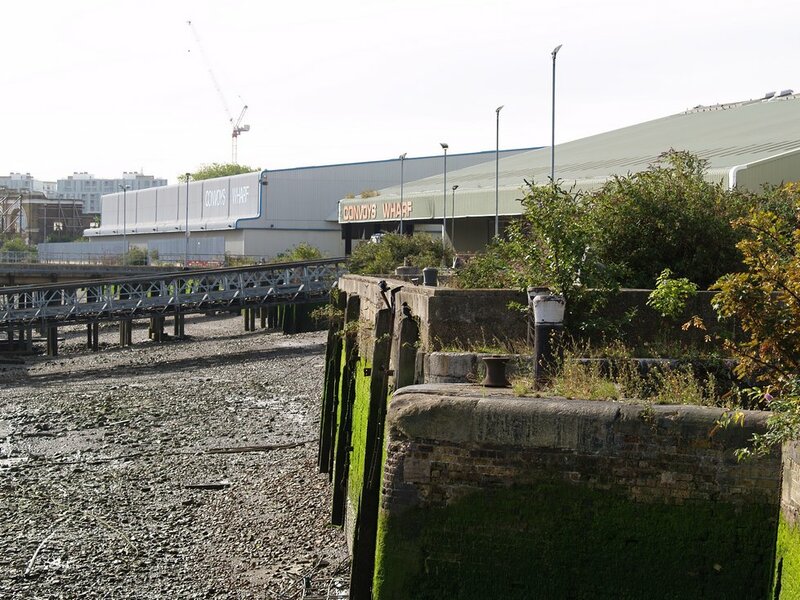 From the late1880s, John James Prior, set up a business supplying sand, ballast and cement for road construction, which was continued here by his heirs and successors, until the wharf closed in the late 1980s. 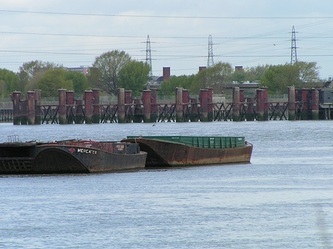 Barges delivered the sand and gravel to the wharf, where it was screened and graded on site before being sent on to customers by road or river. 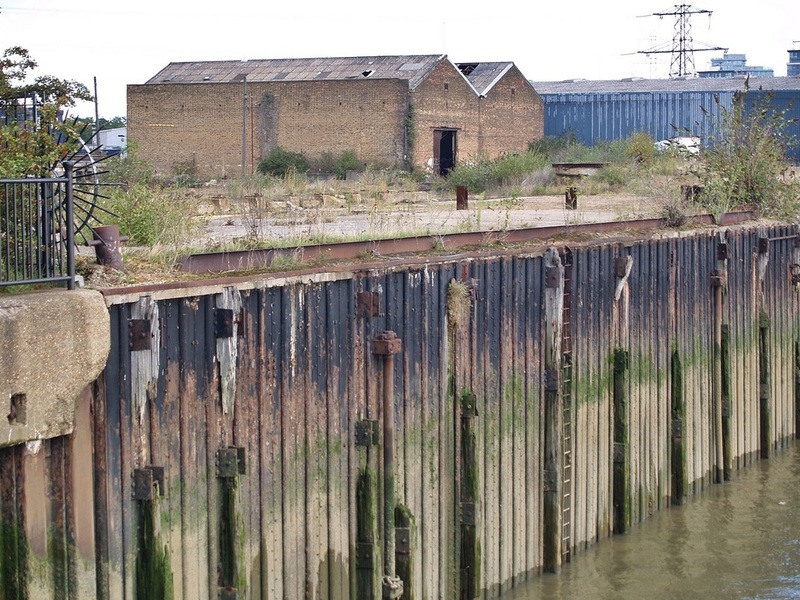 Surprisingly this site will not be used to build flats - Orchard Wharf has been given a safeguarded wharf status by the Mayor of London. 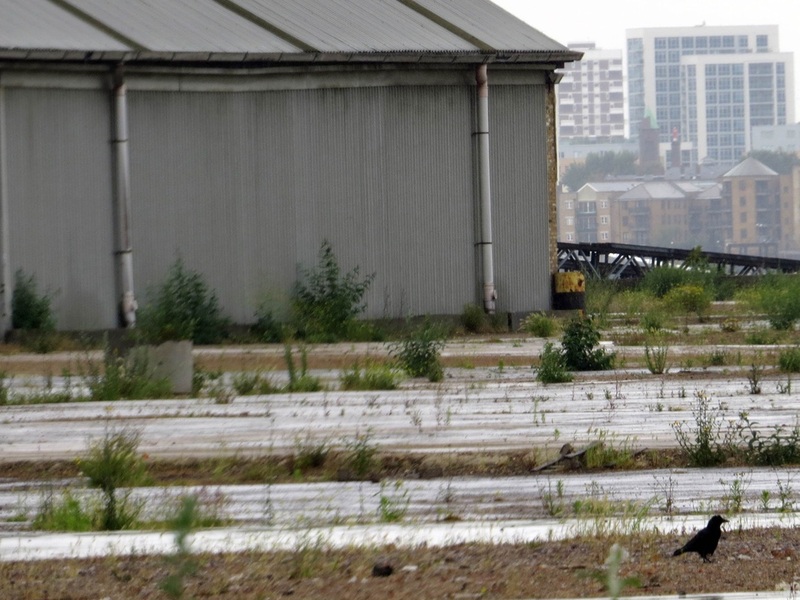 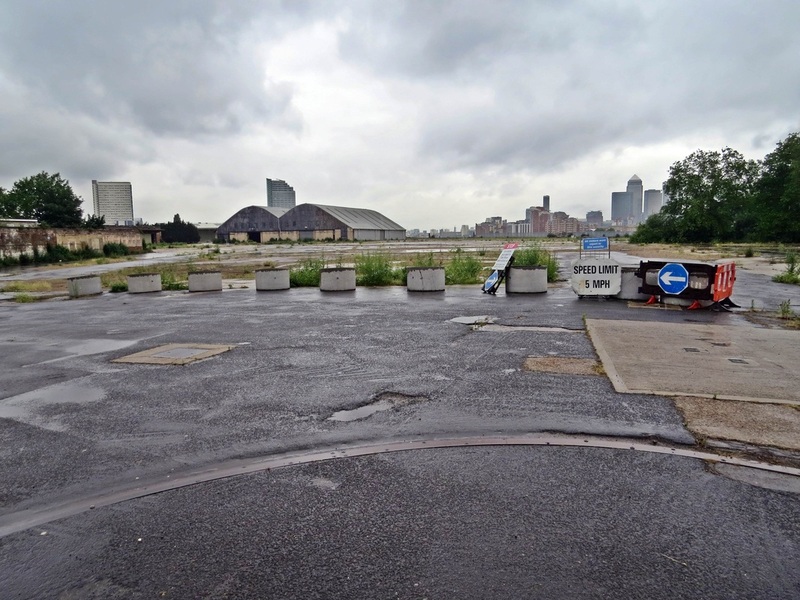 Proposals are being developed to use Orchard Wharf for the delivery of construction materials into central London. These buildings were visible in the background in a fight scene between West Ham & Millwall firms in the cult football film "Green Street"
Opened in 1805, A monopoly granted to the London Dock Company meant that all vessels entering the Port of London with cargoes of tobacco, rice, wine and brandy (except vessels from the East and West Indies) had to unload at London Docks.The dock system consisted of two main basins, the Western Dock and the Eastern Dock, with a small basin known as the Tobacco Dock linking the two. 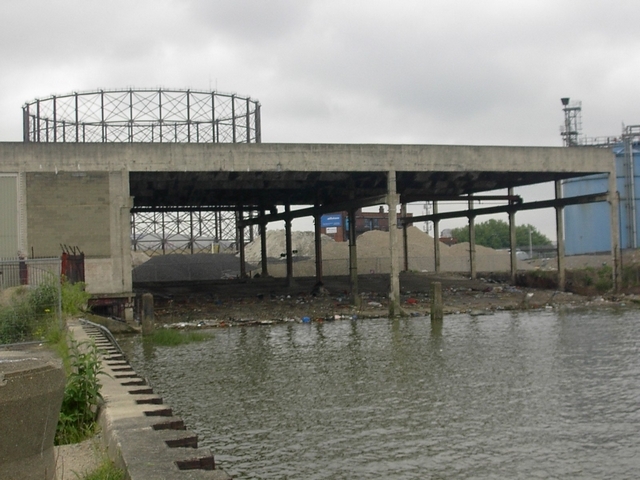 Eastern Dock joined the Thames via Shadwell Basin.As container ships became more popular, the London Docks became unable to cope with their size and closed in 1971. Most of the Eastern Dock has been infilled and much of it is now a park surrounded by housing. Opposite Tobacco Dock these remanants of the old dock wall remain some of which is used as a wall for the multi storey car park. 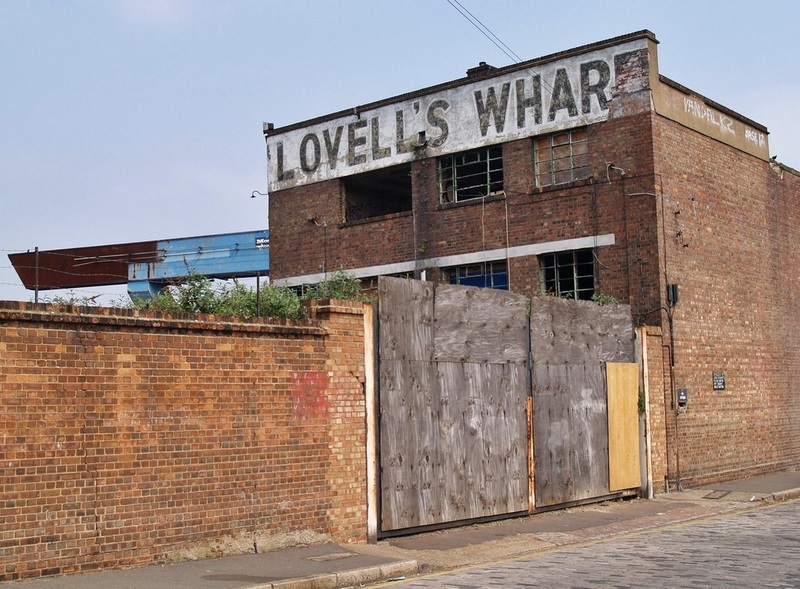 More information and pictures of the London Docks in Wapping (plus numerous other former docks, canals and rivers) can be found in my book LONDON'S LOST RIVERS and I occasionally run guided walking tours of the area. I always wondered what these battered wooden structures were called until I saw a drawing from the 1800's on one at the Docklands Museum. 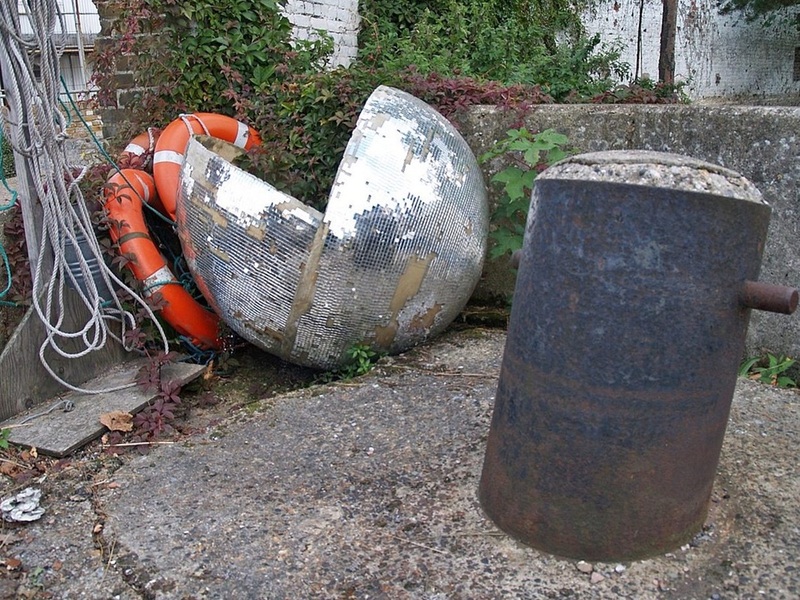 A dolphin is a large wooden pile used as a mooring post for ships or as a beacon. 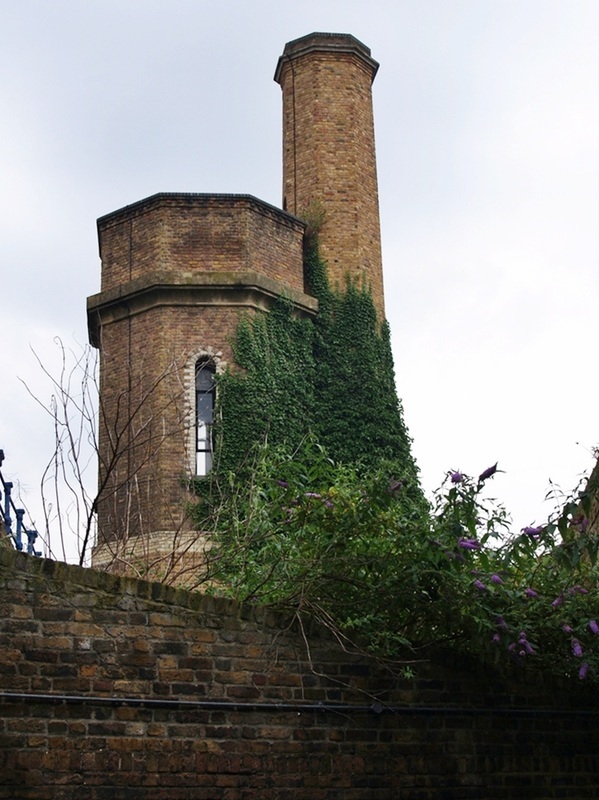 This octagonal tower was built in 1869 was used to store water which provided the hydraulic power for the cranes and locks in the adjacent Limehouse Basin. 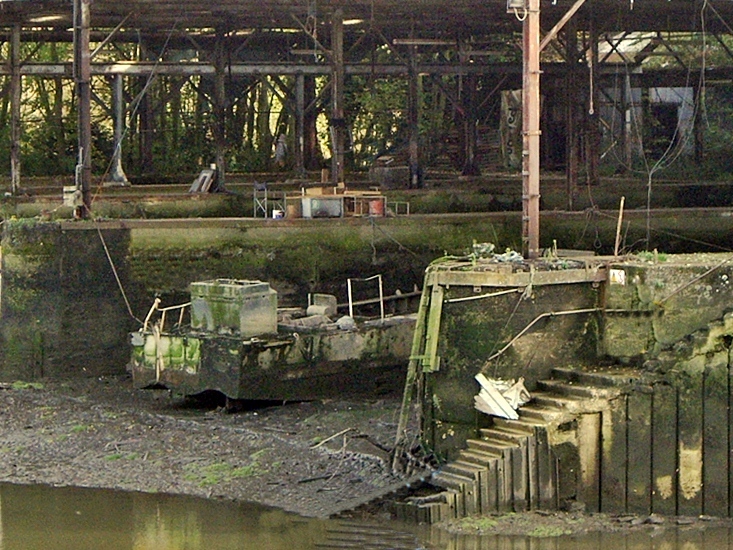 Long gone is the engine room that would have stood next to the tower.